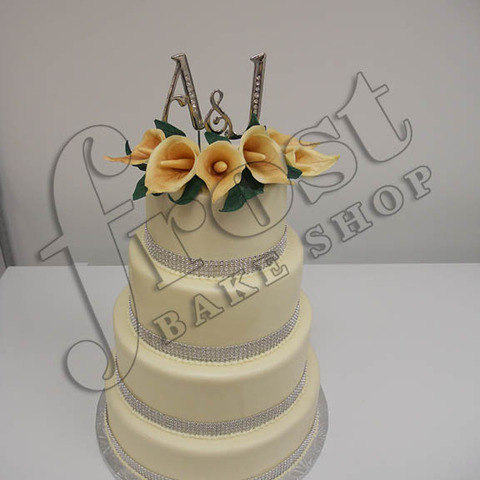 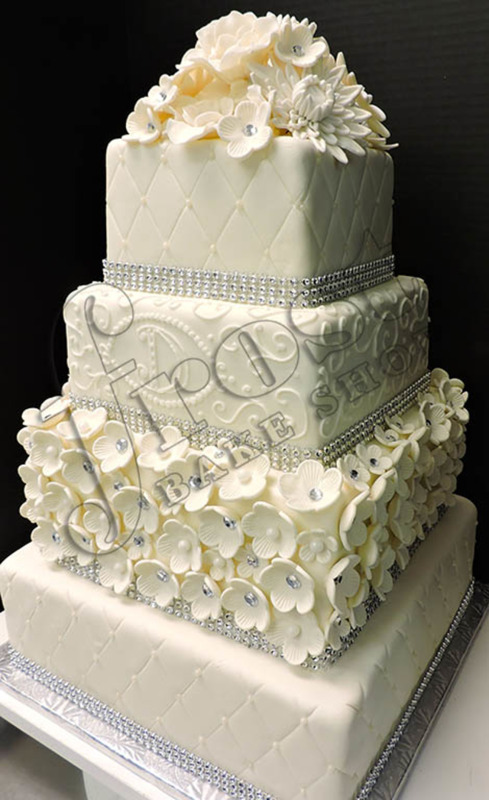 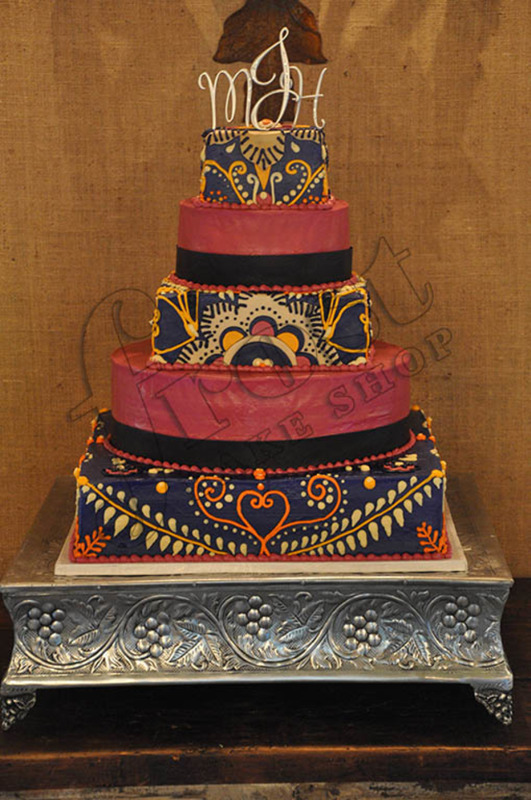 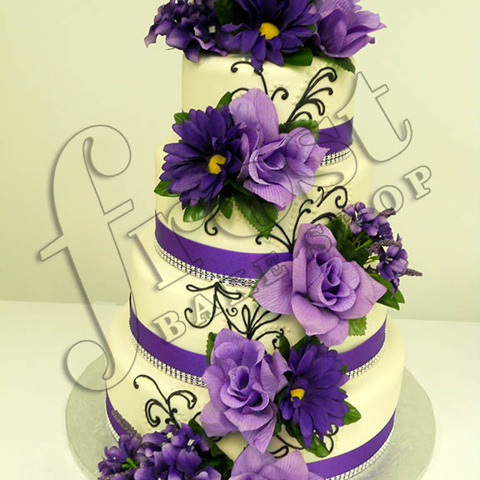 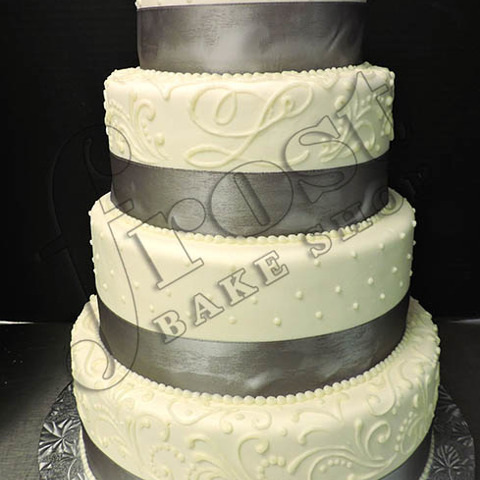 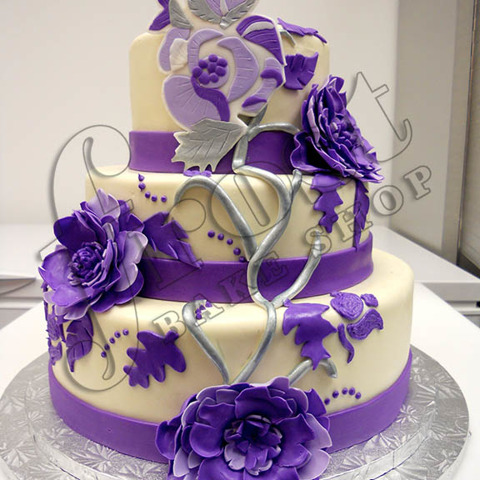 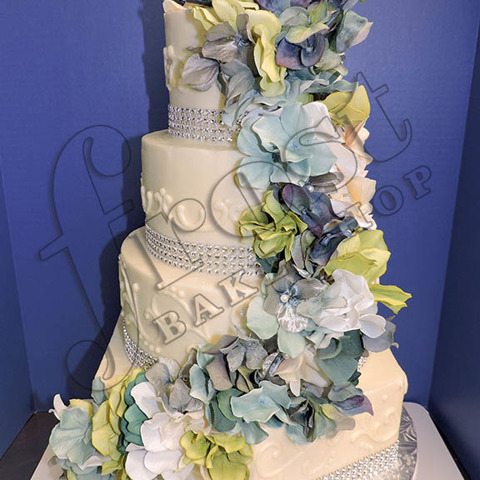 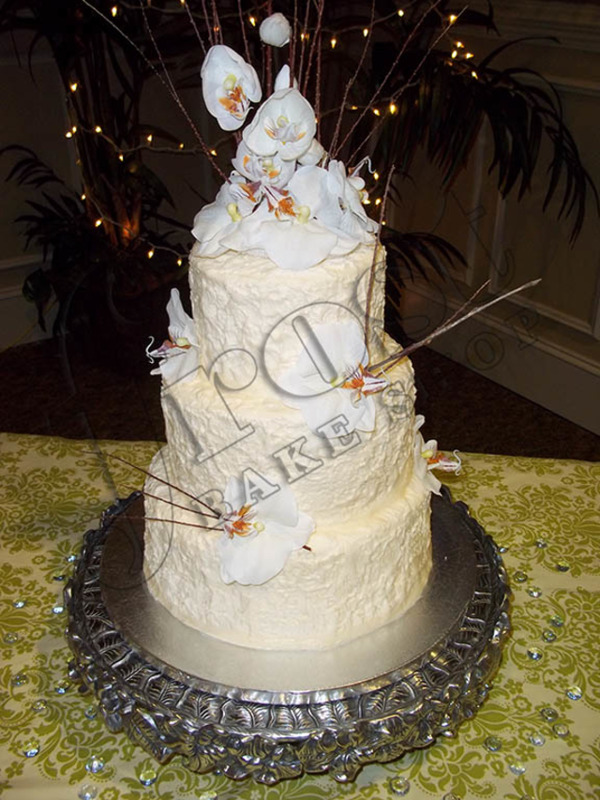 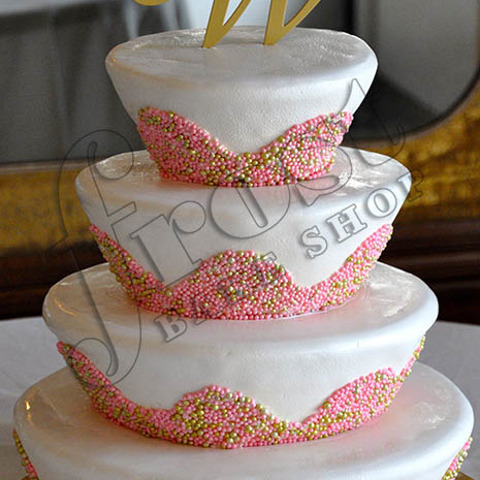 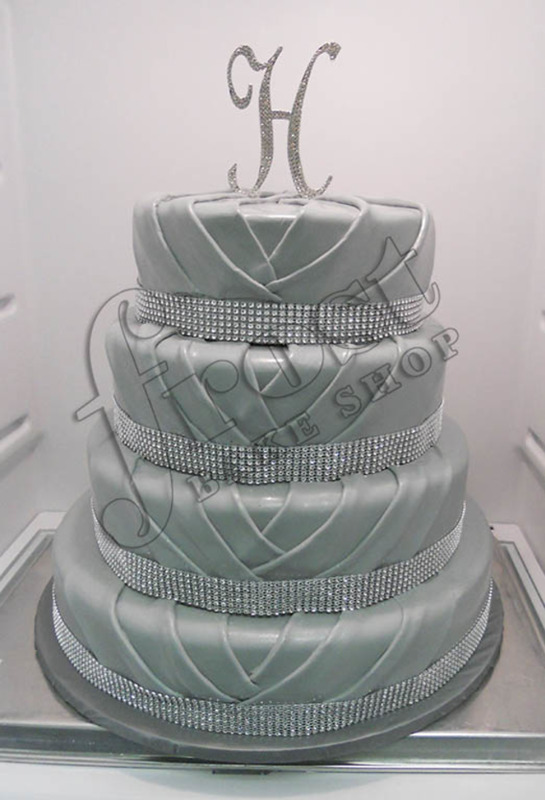 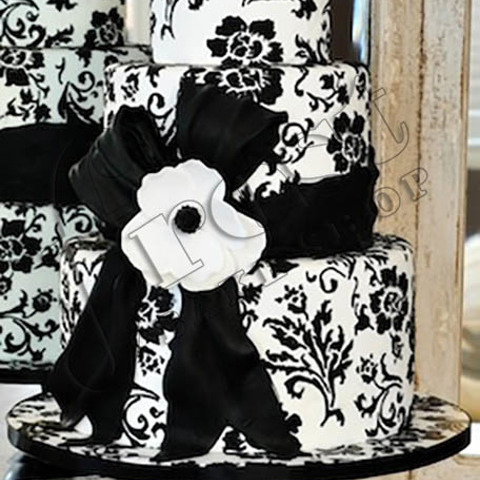 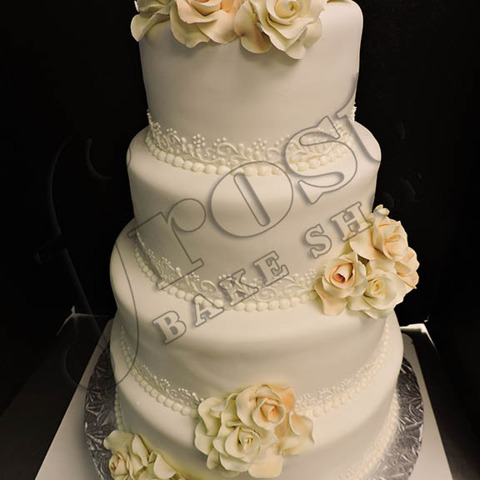 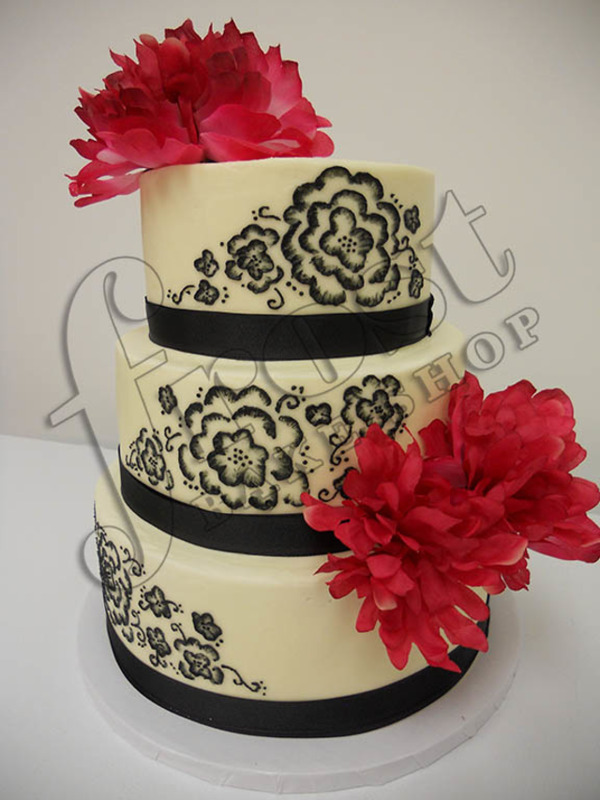 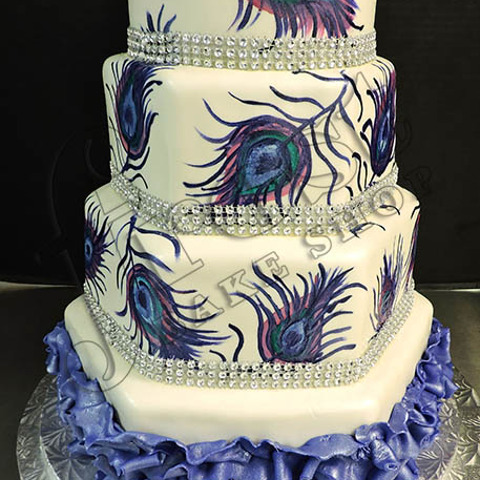 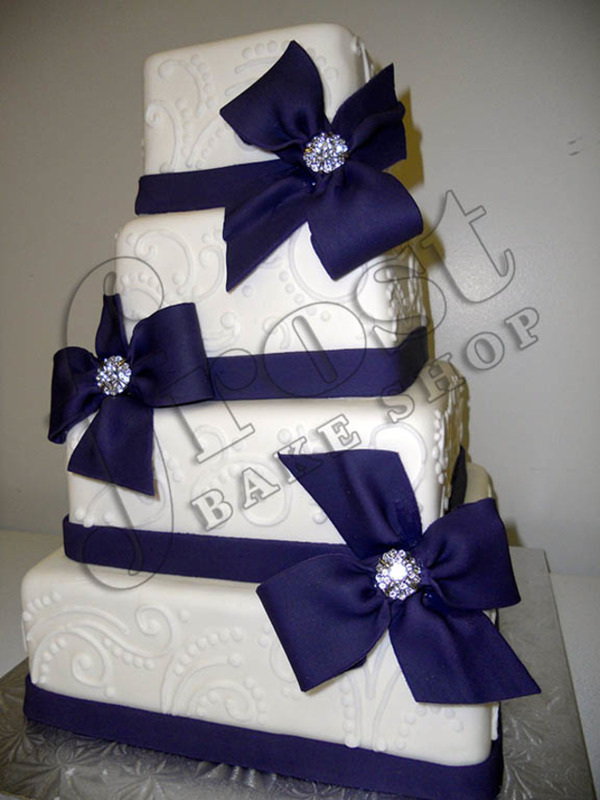 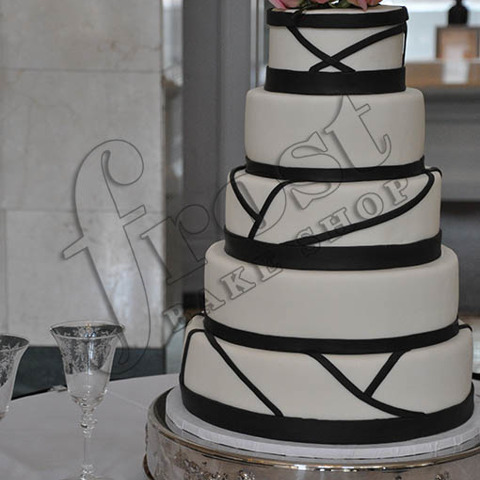 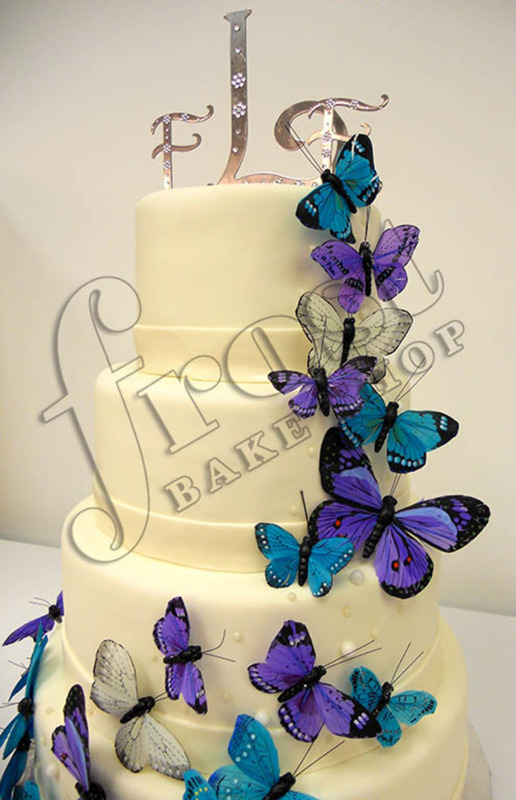 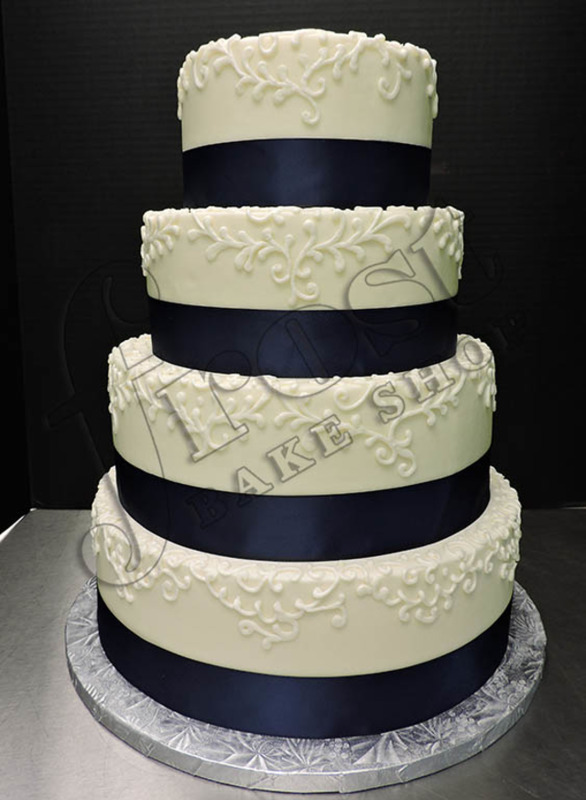 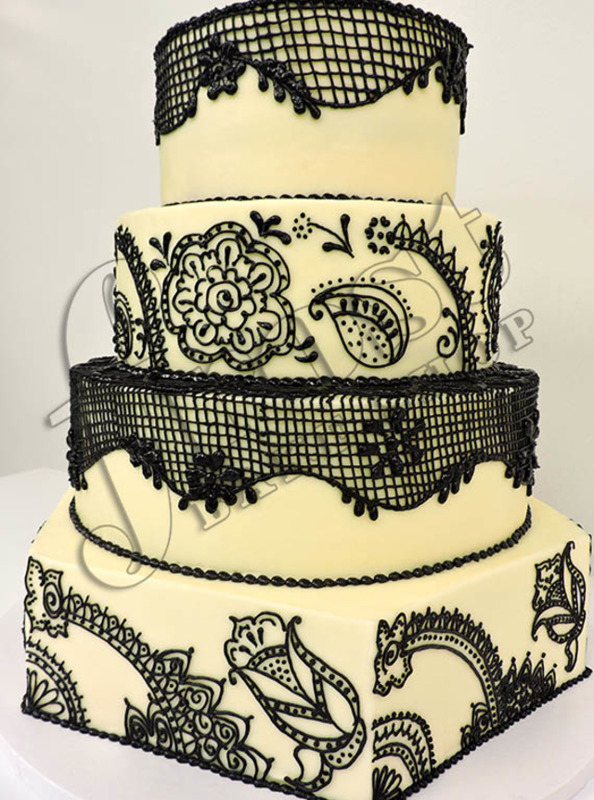 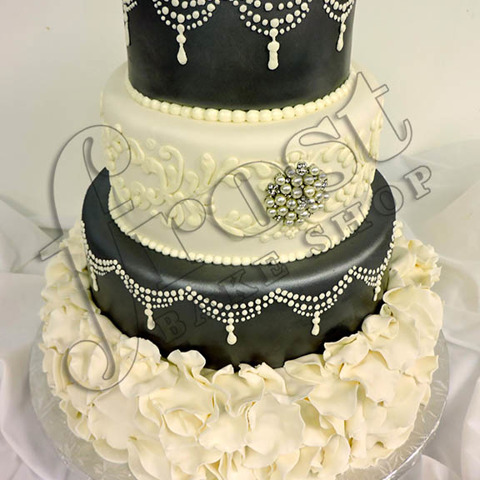 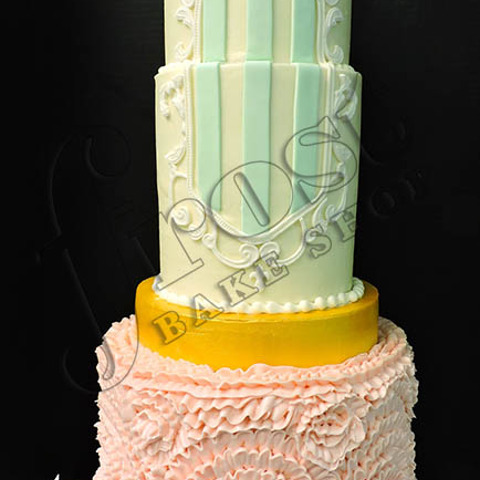 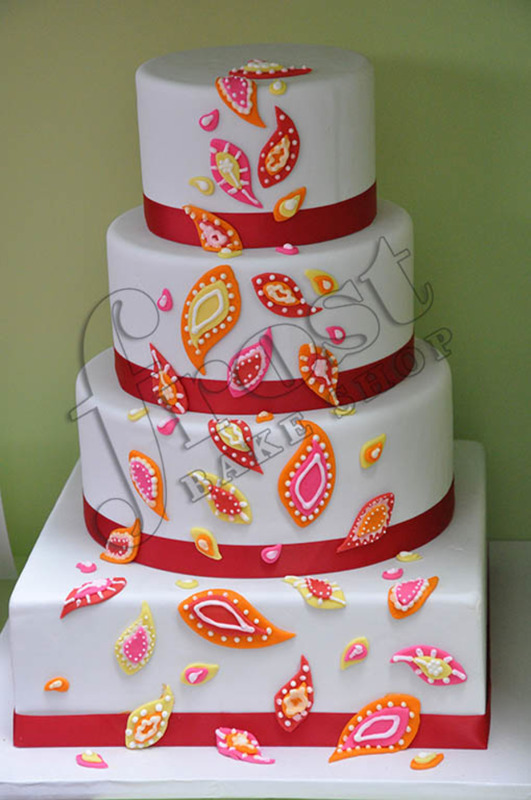 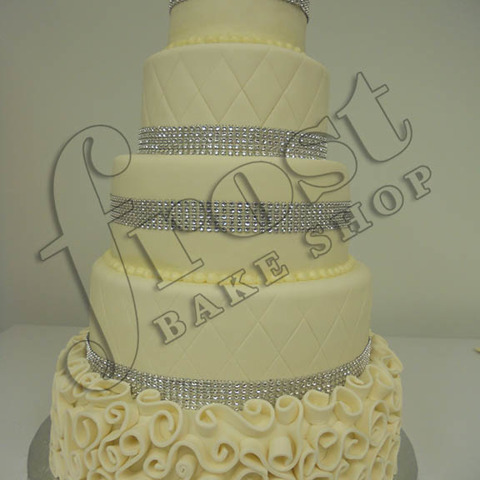 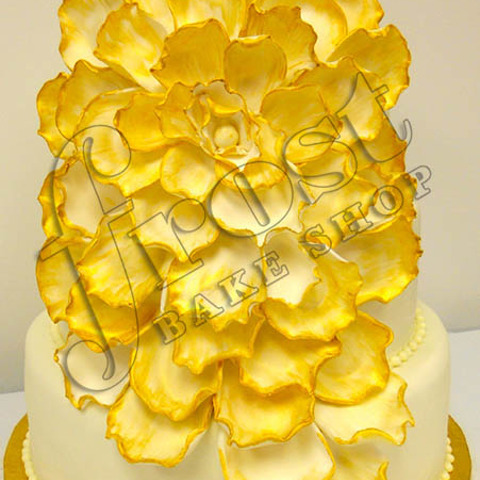 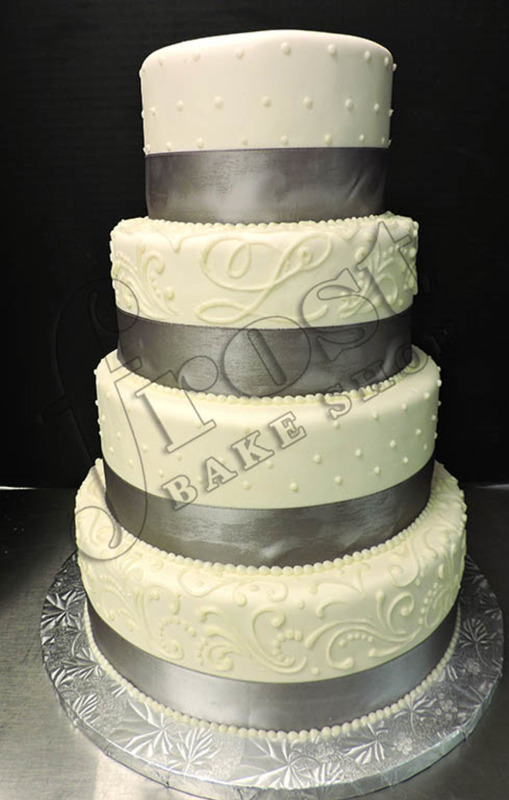 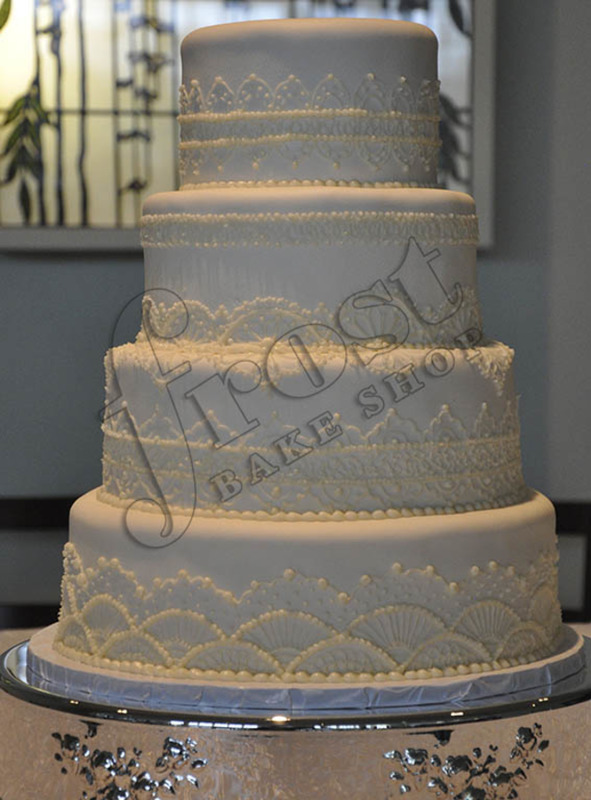 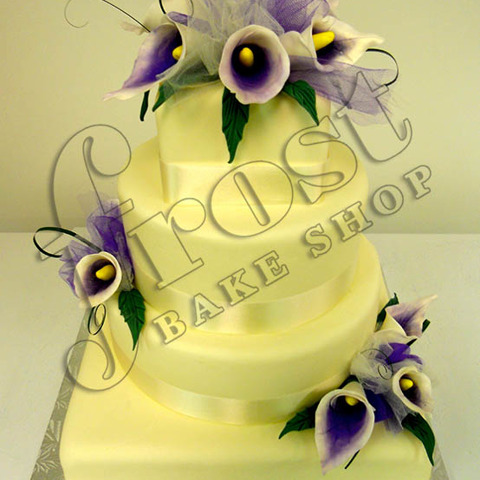 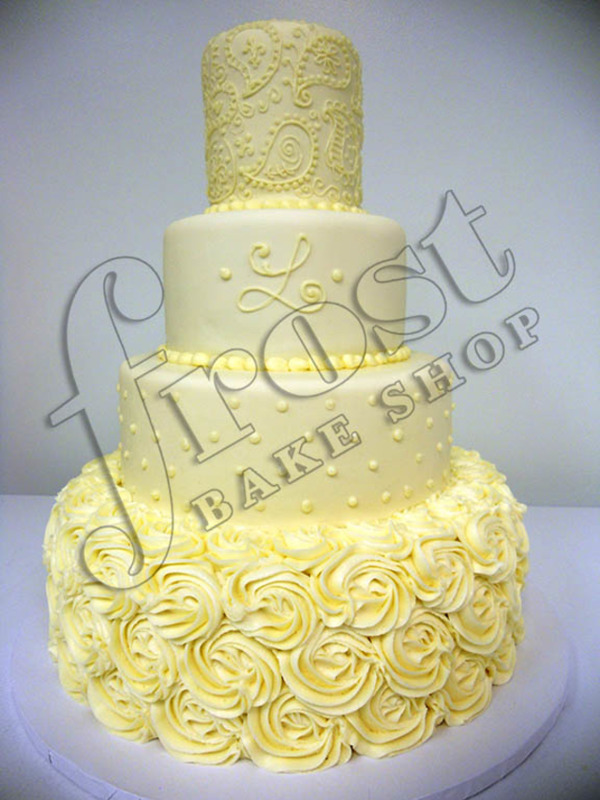 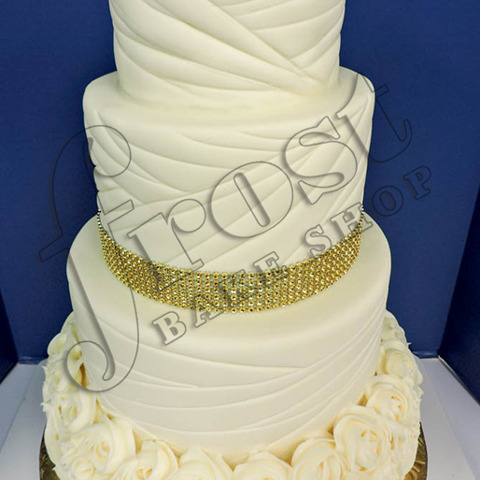 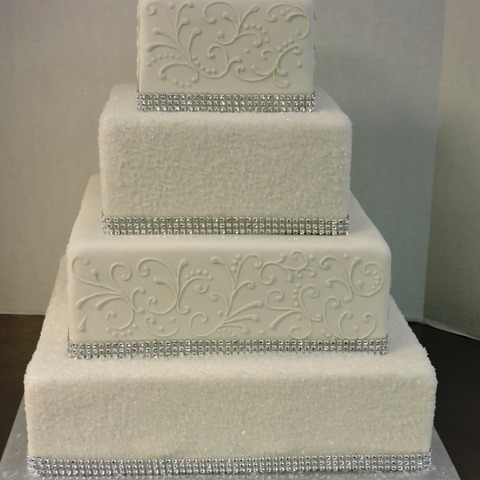 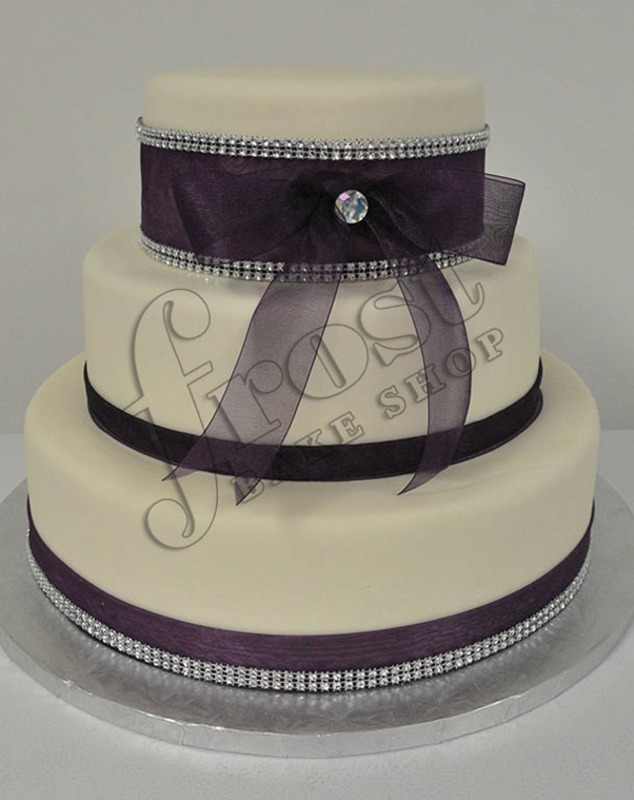 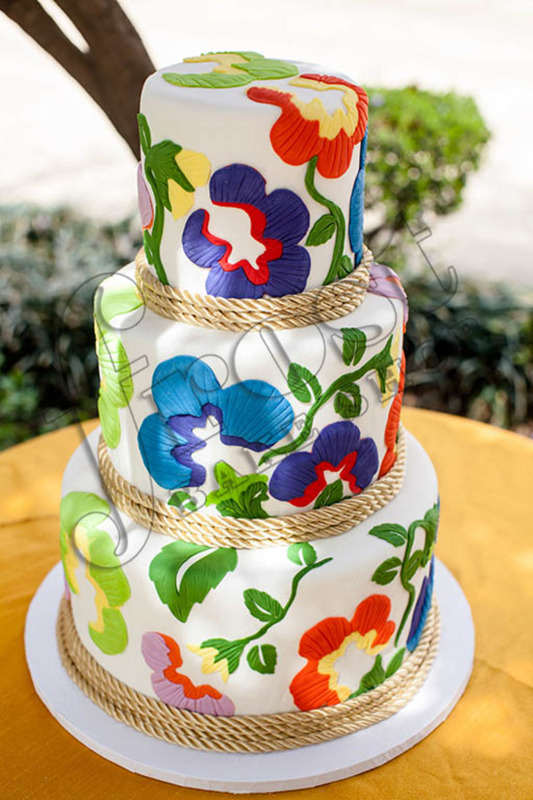 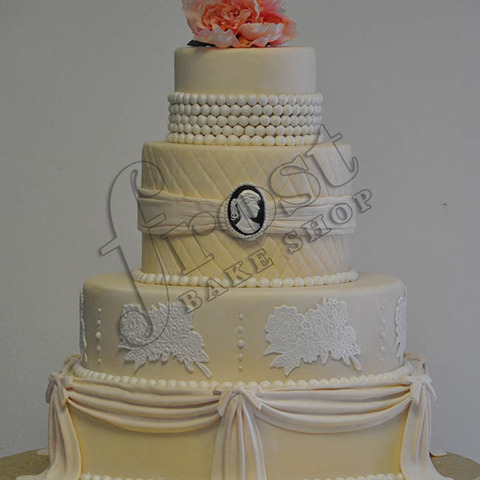 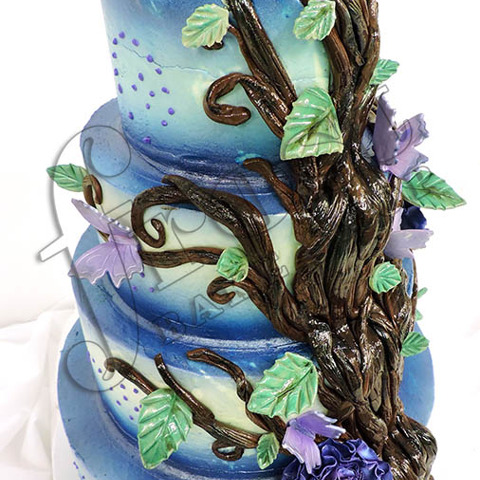 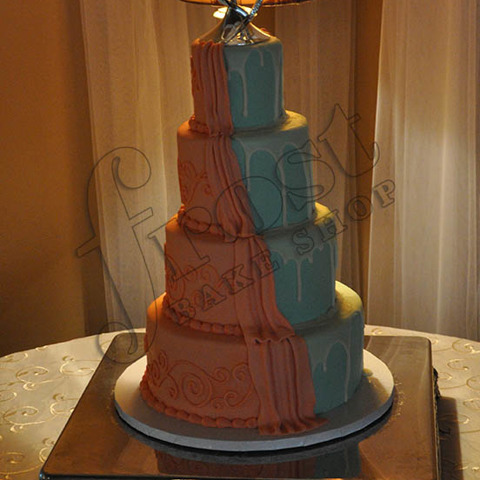 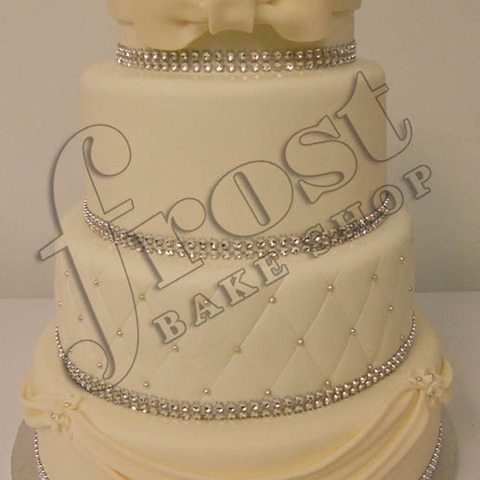 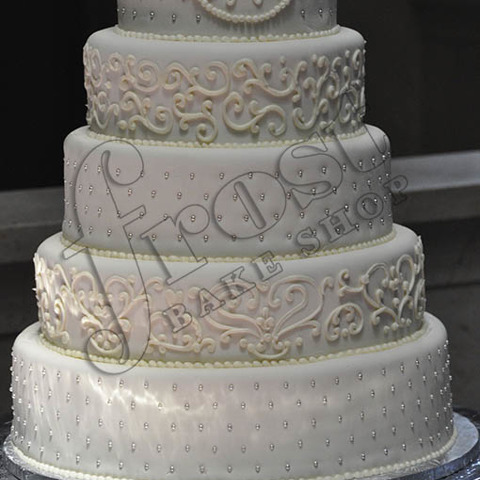 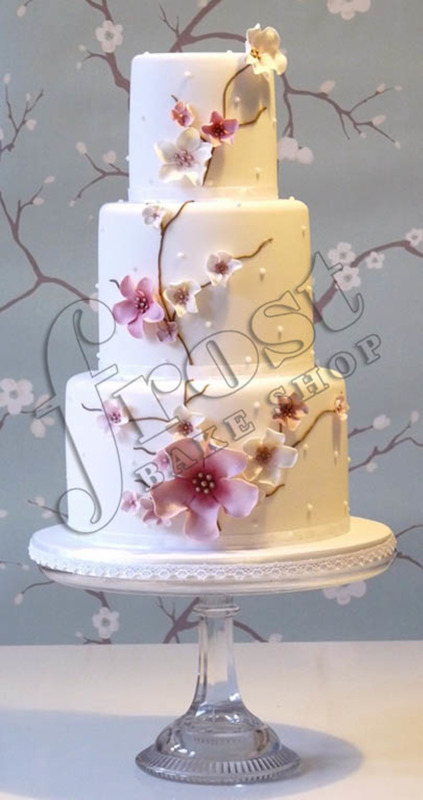 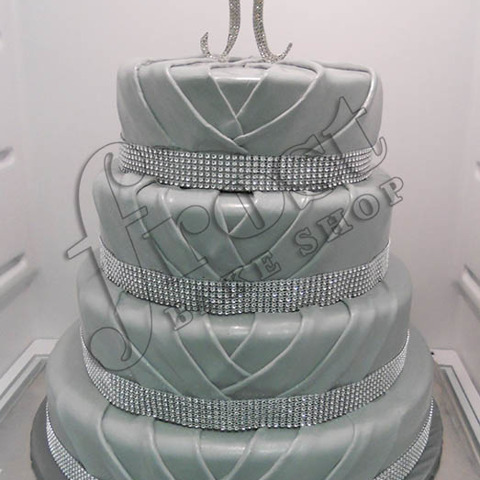 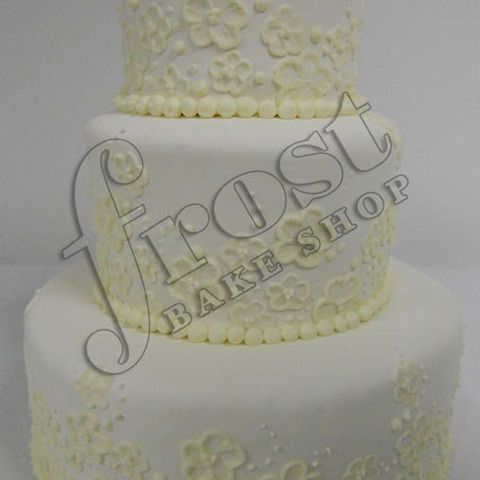 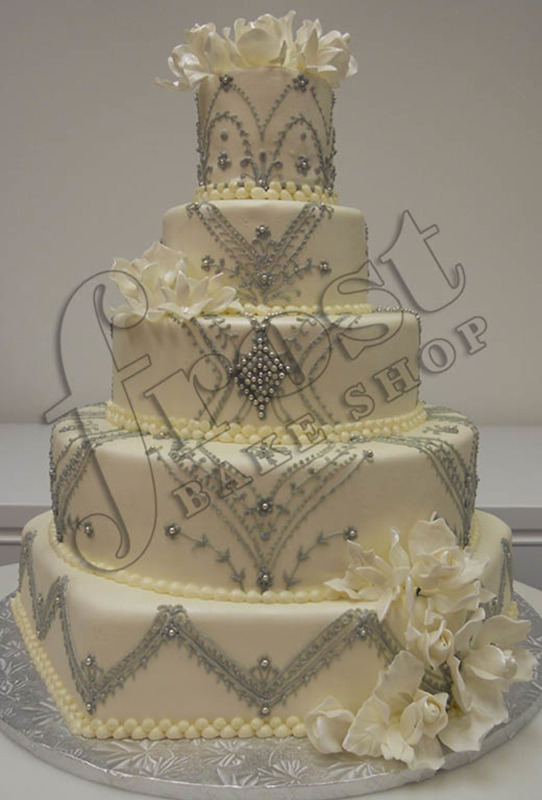 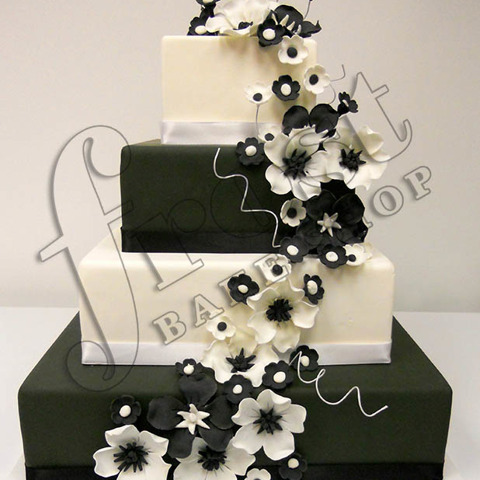 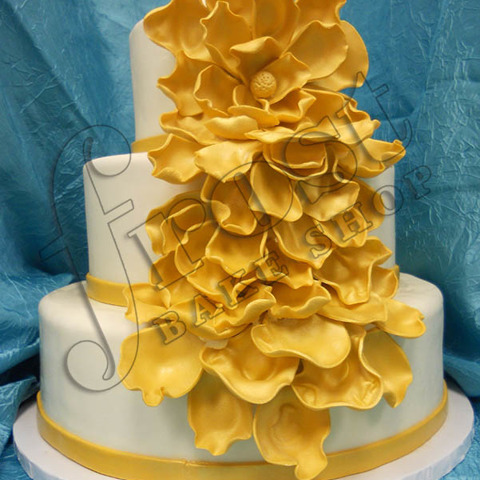 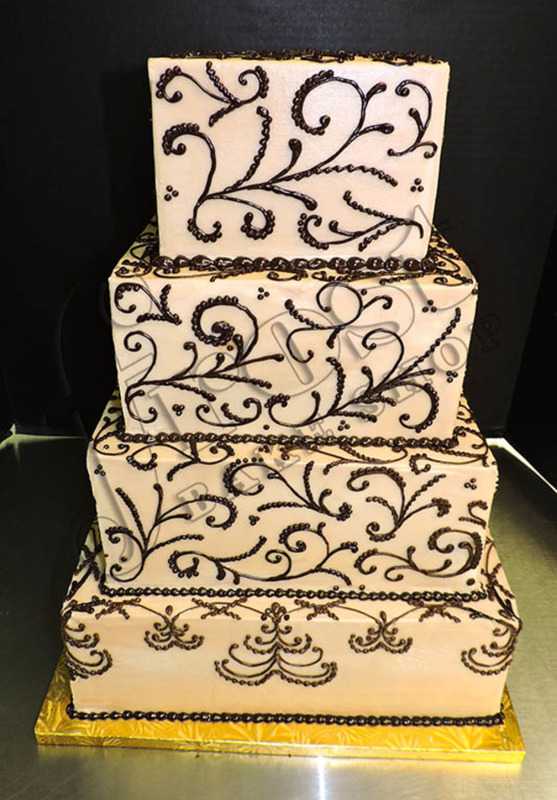 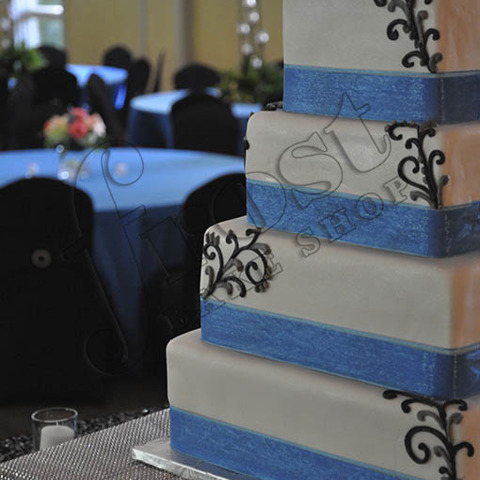 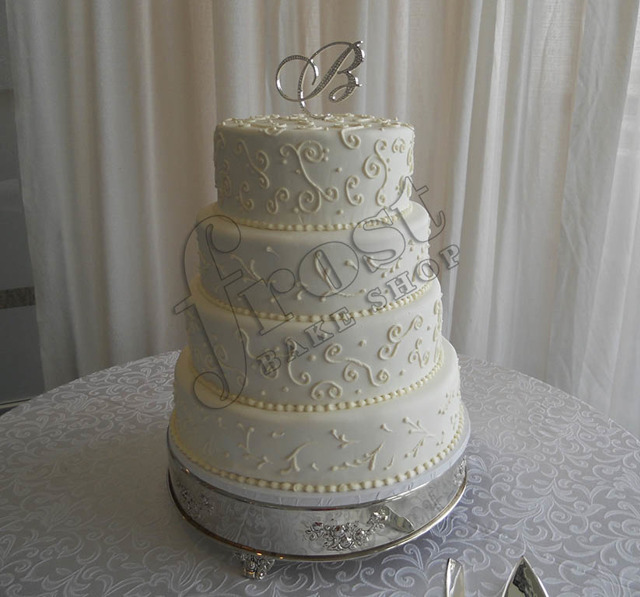 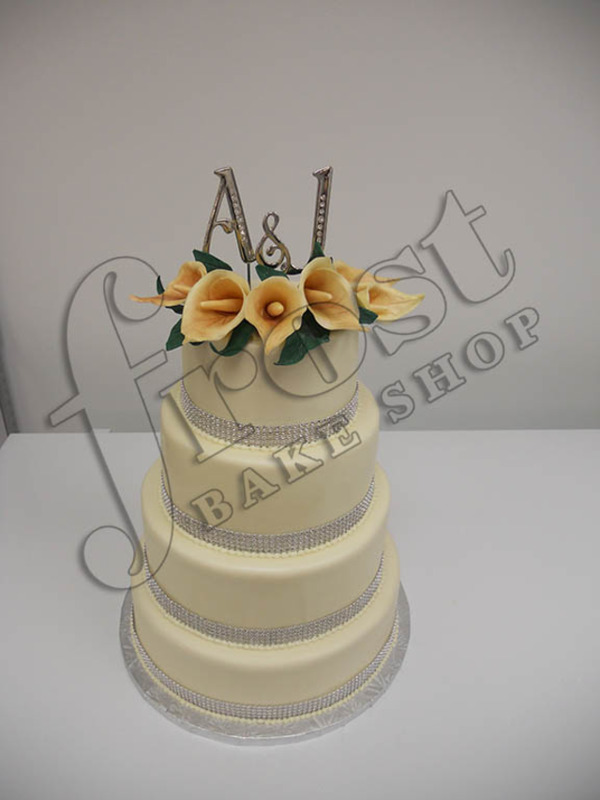 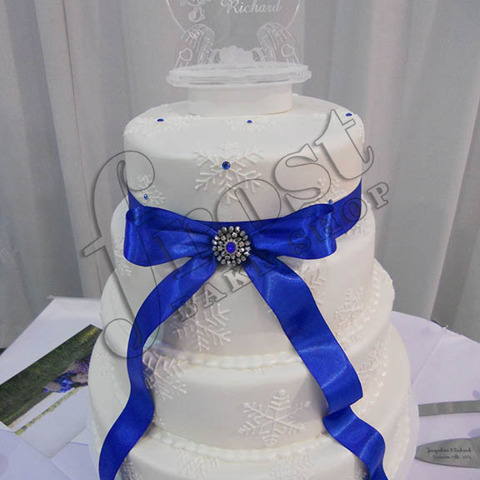 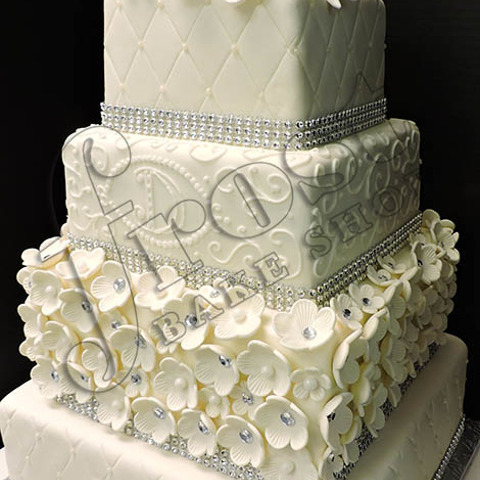 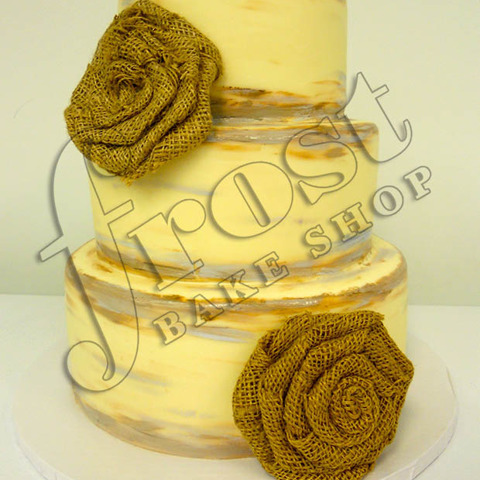 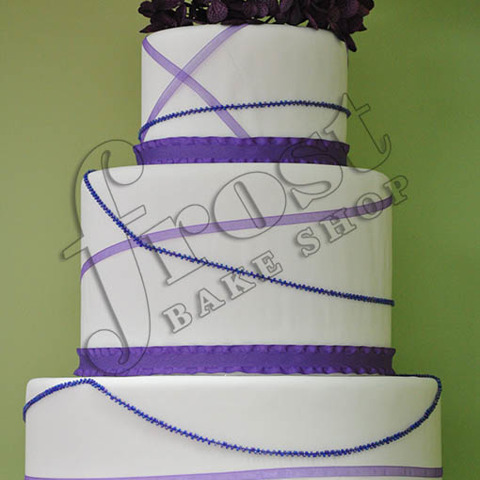 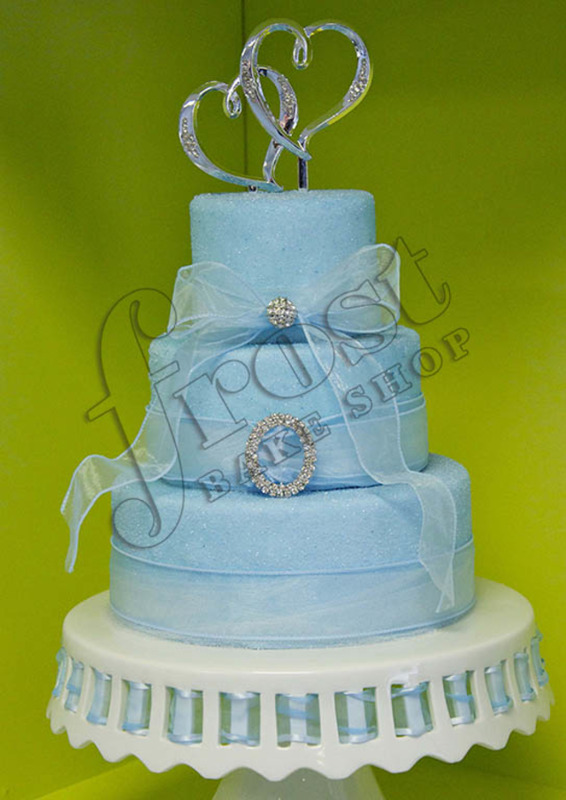 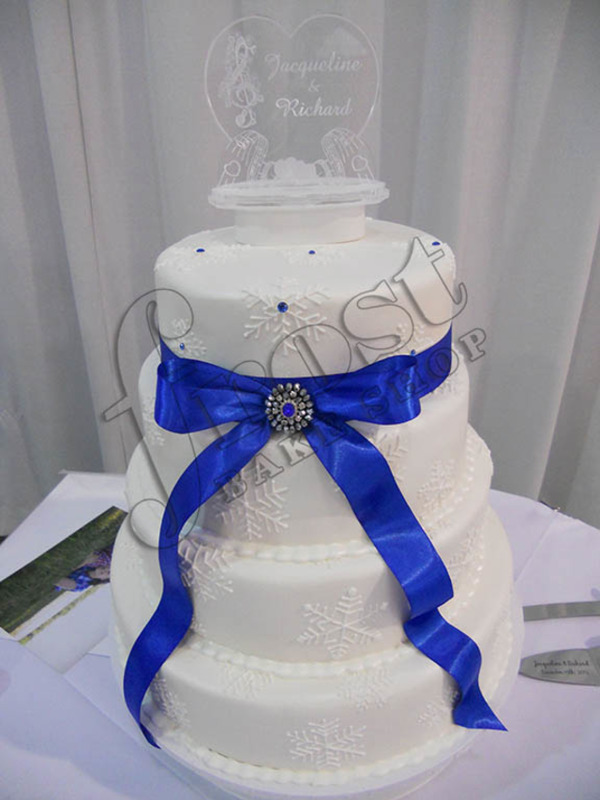 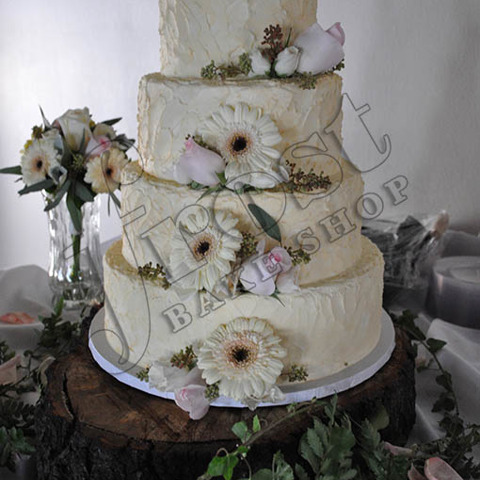 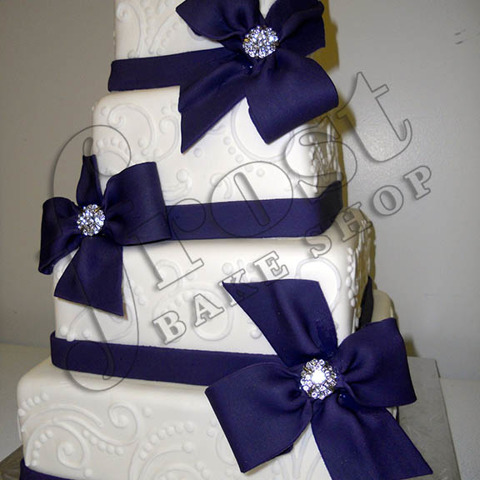 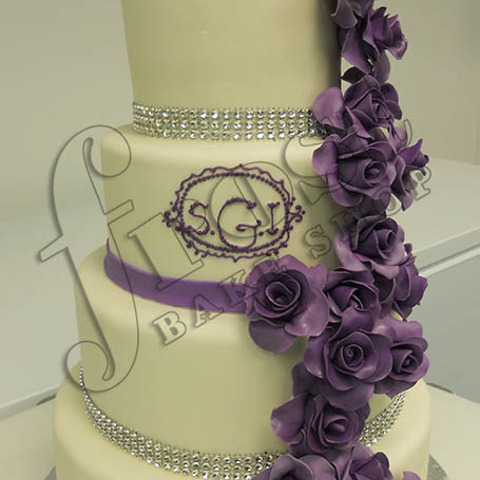 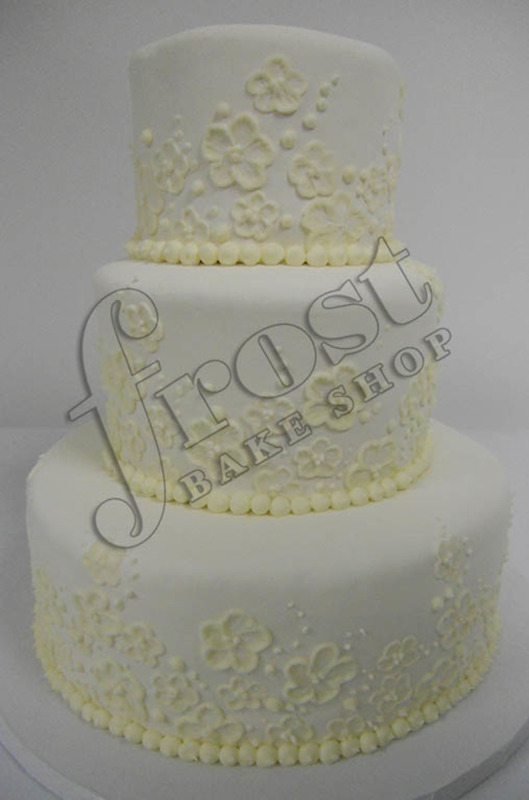 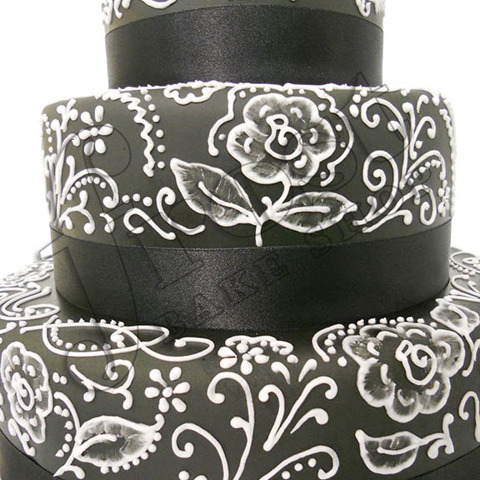 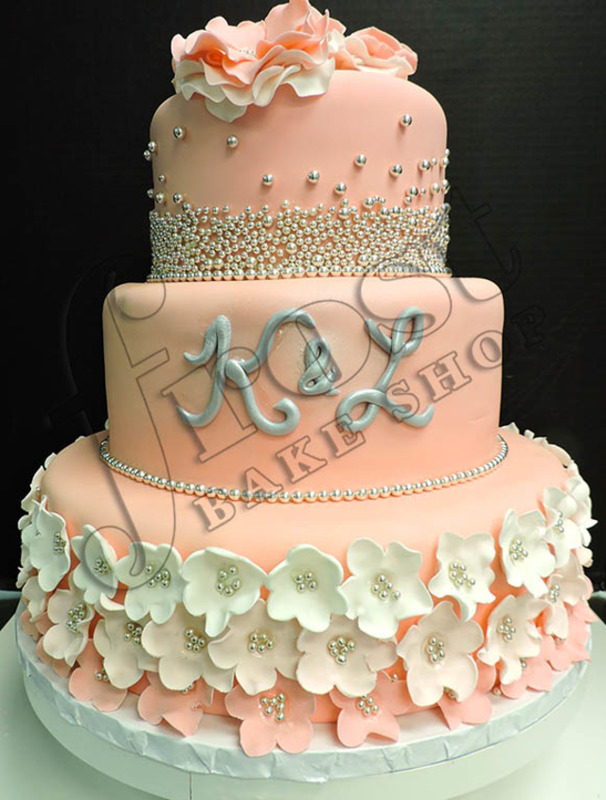 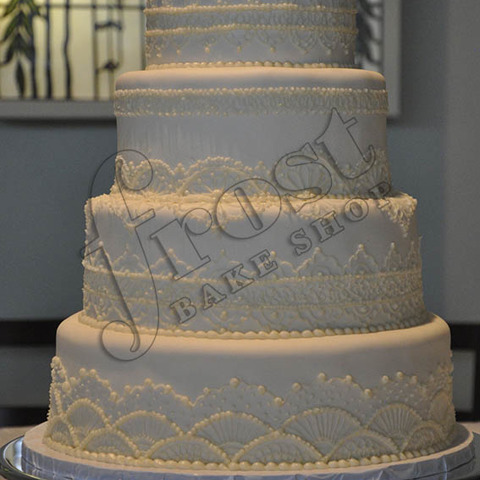 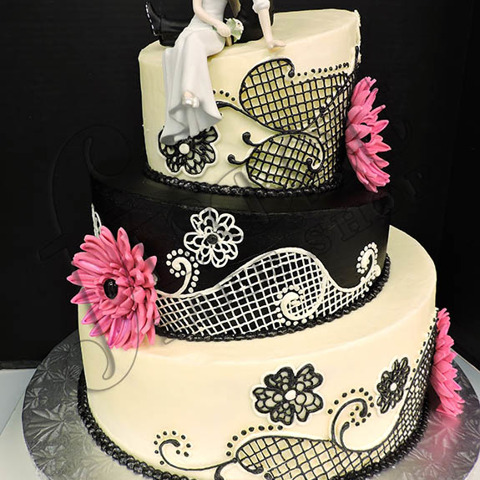 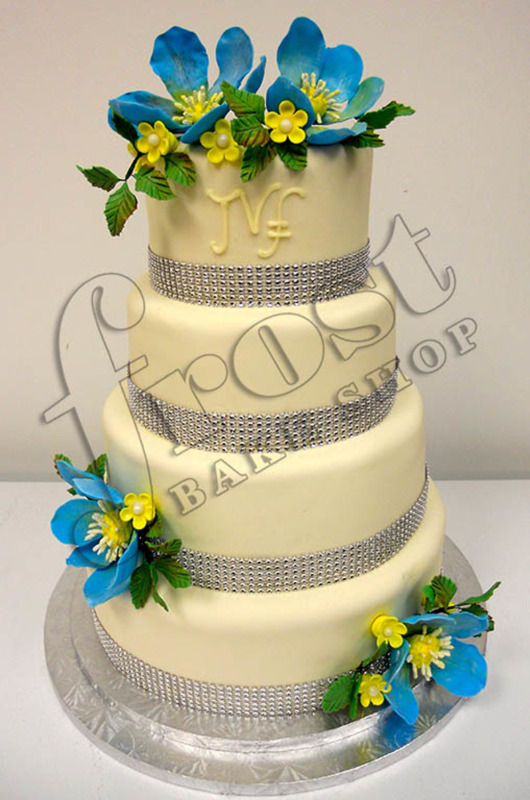 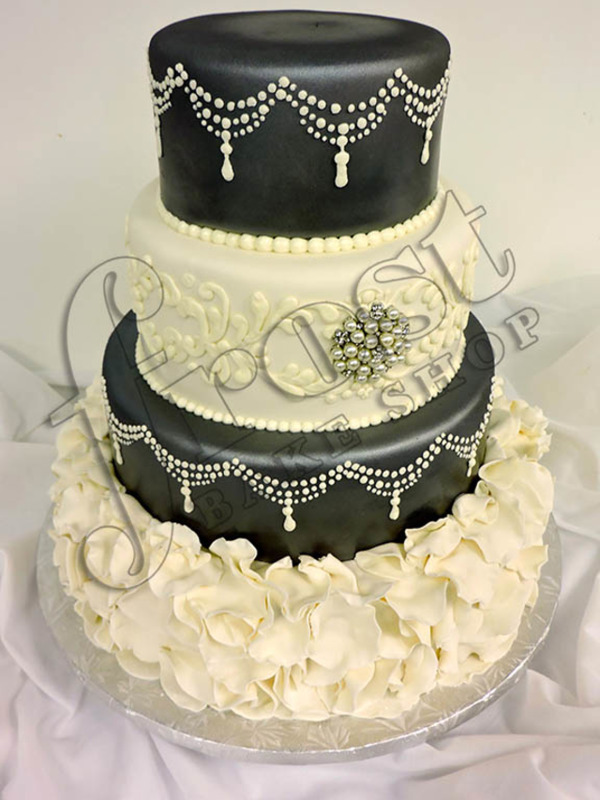 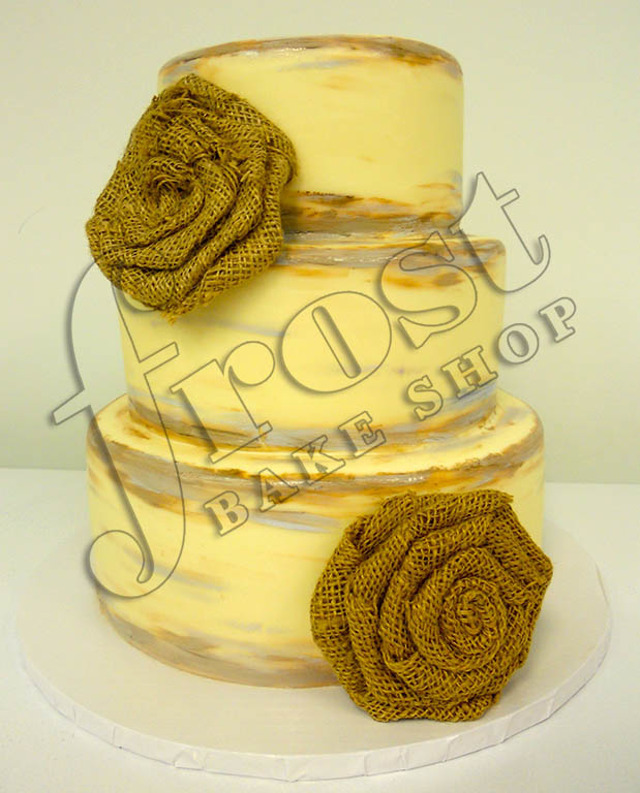 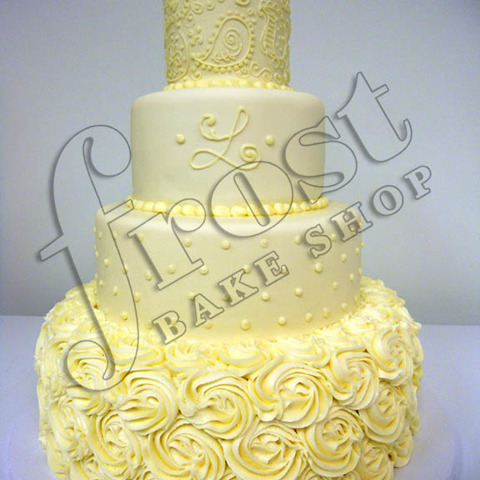 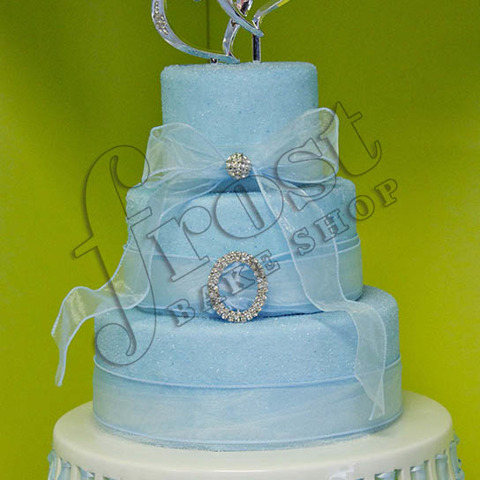 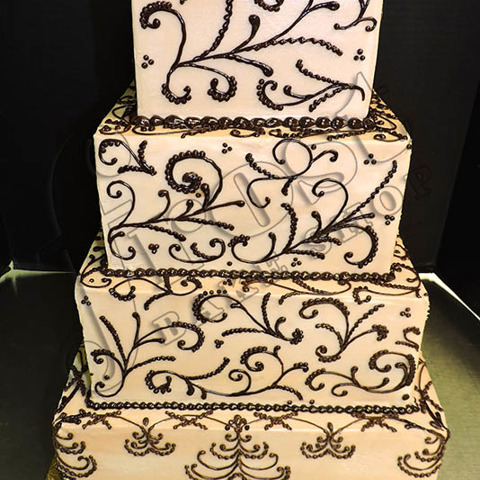 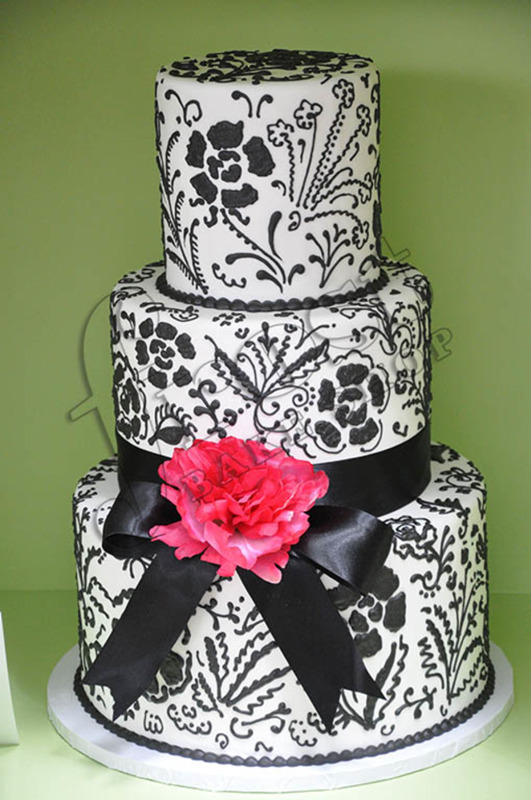 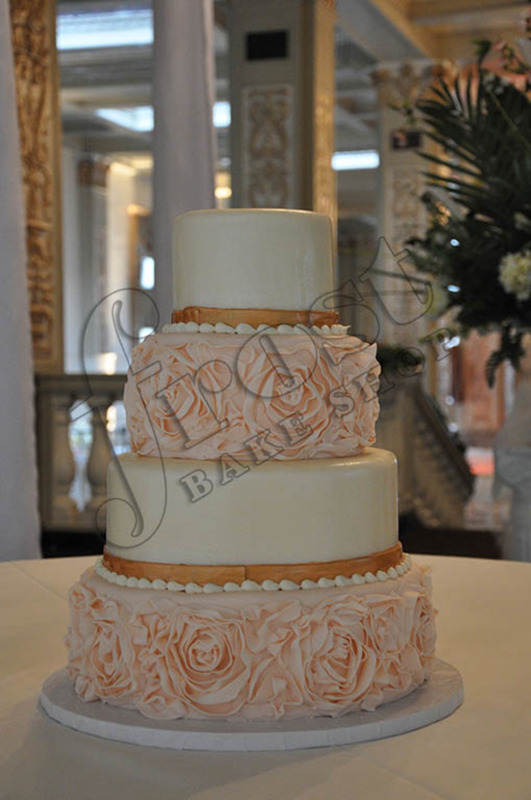 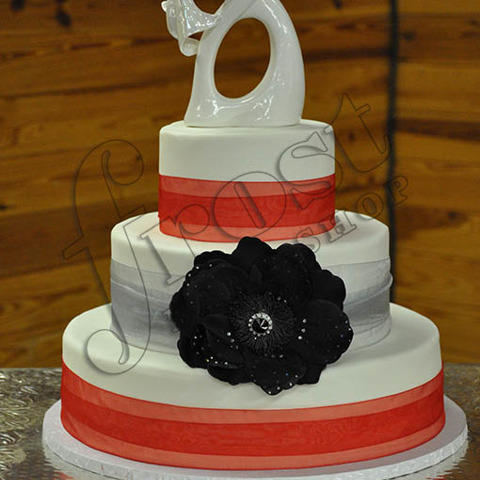 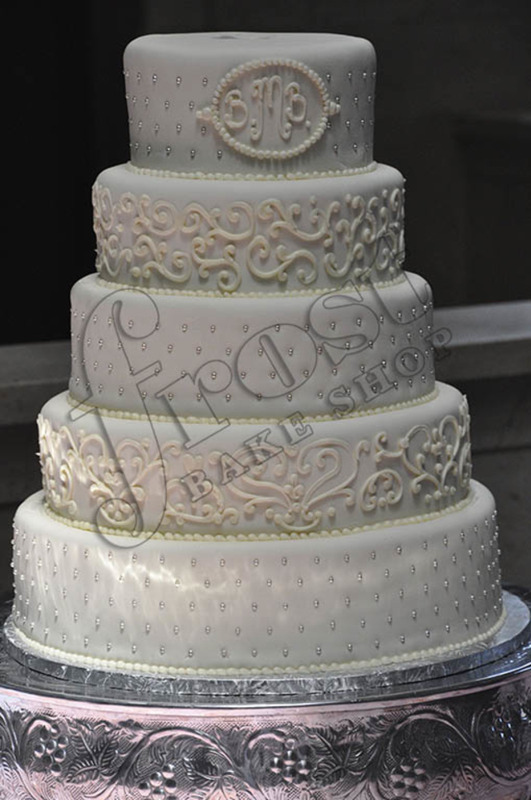 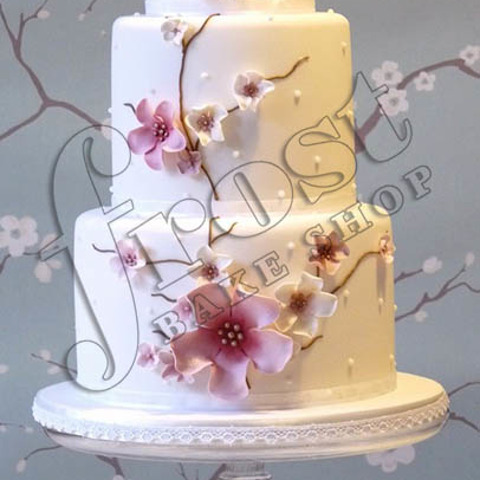 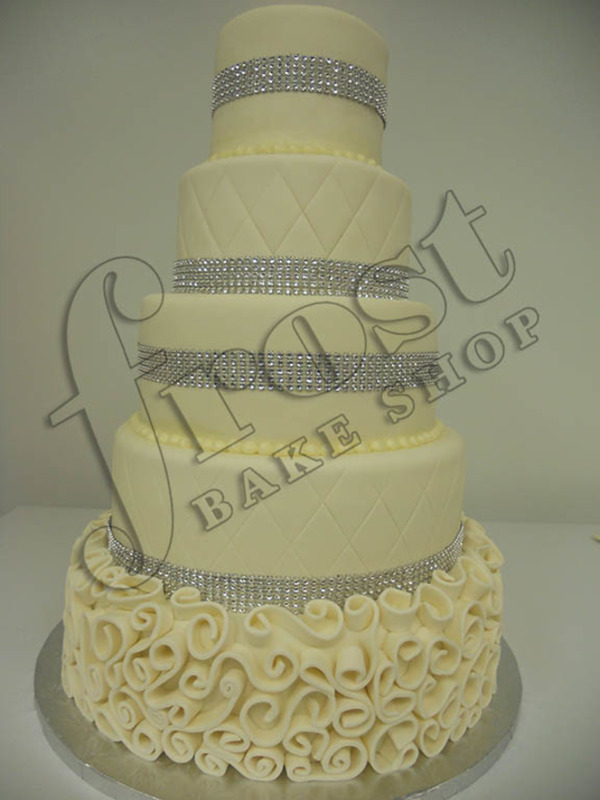 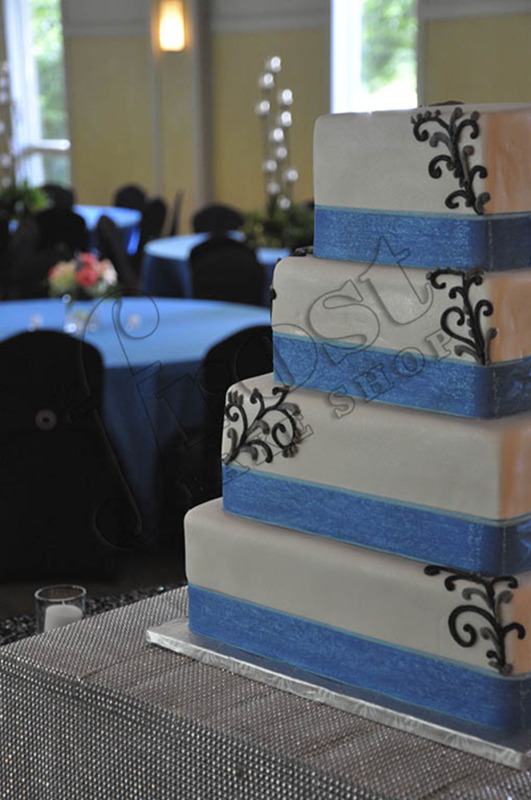 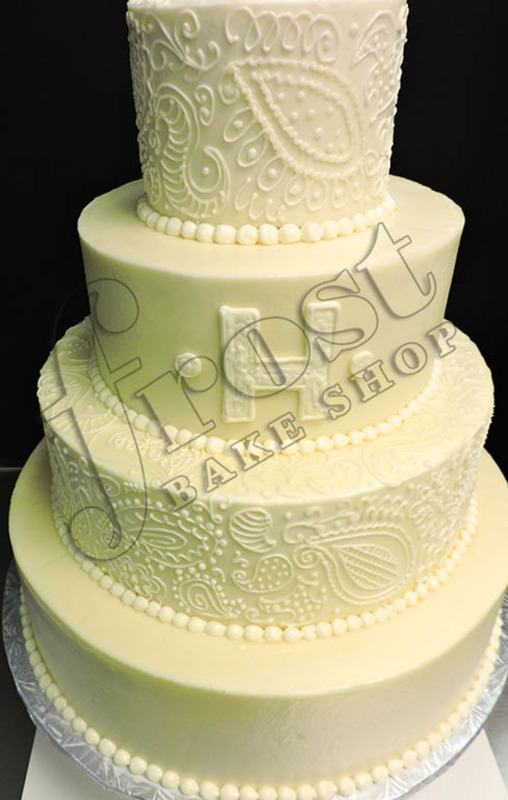 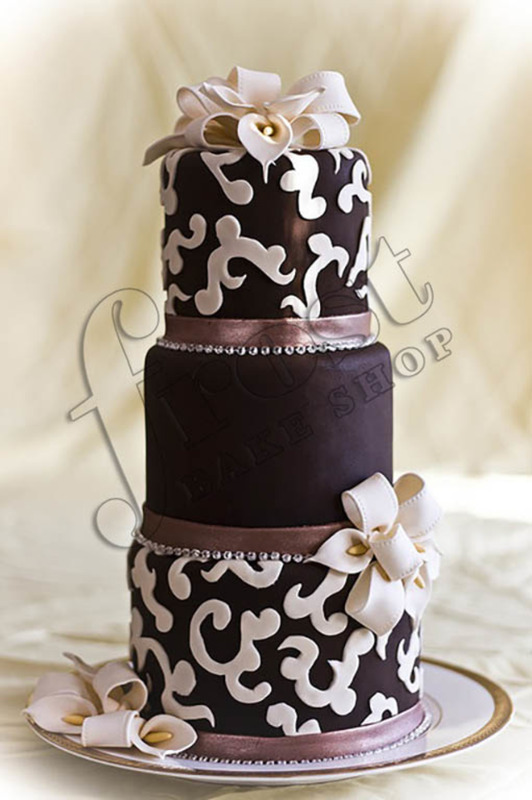 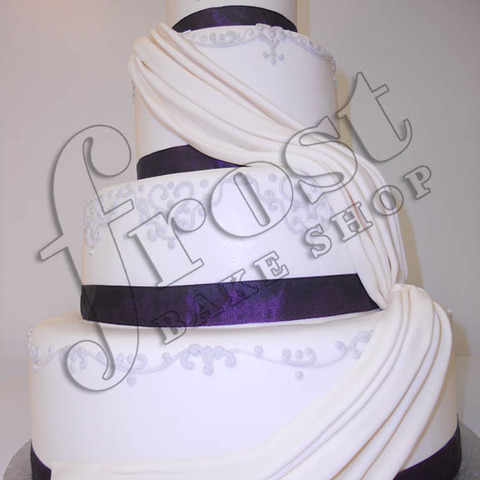 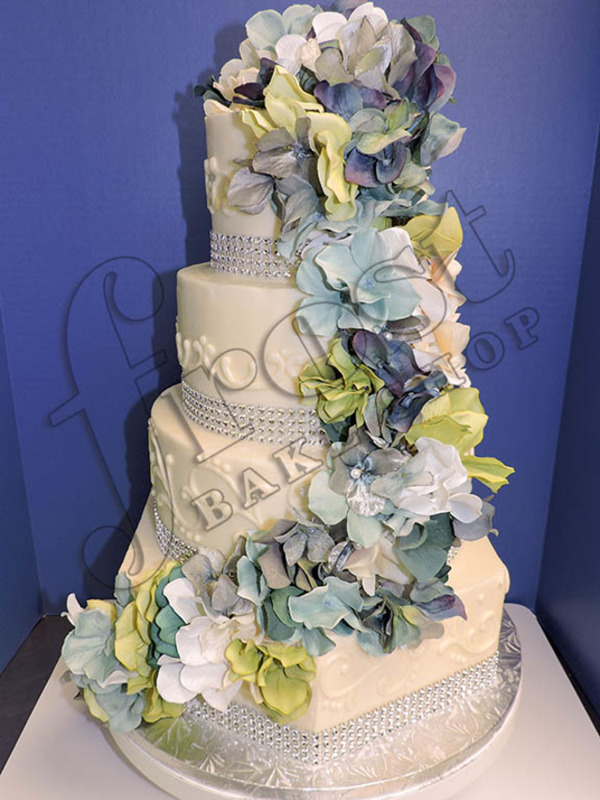 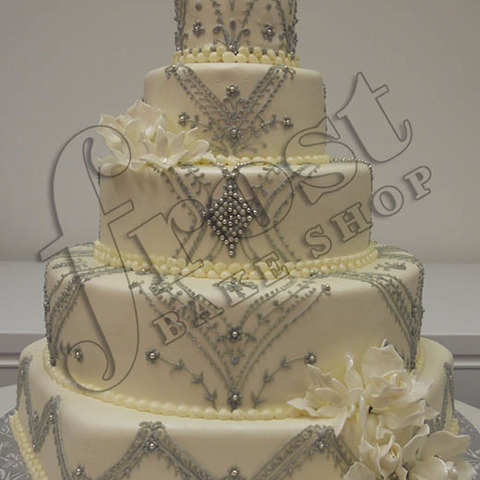 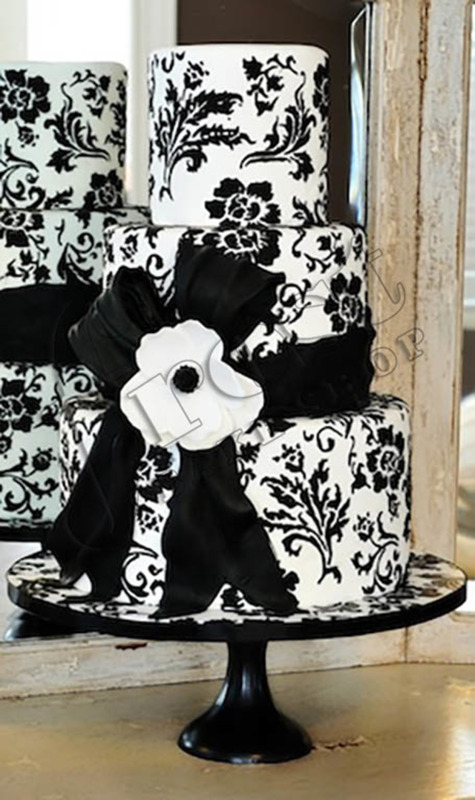 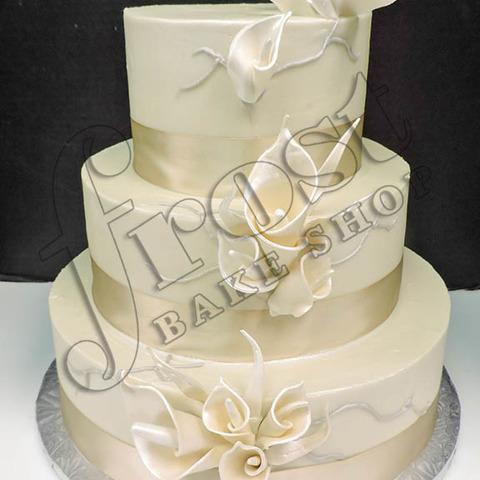 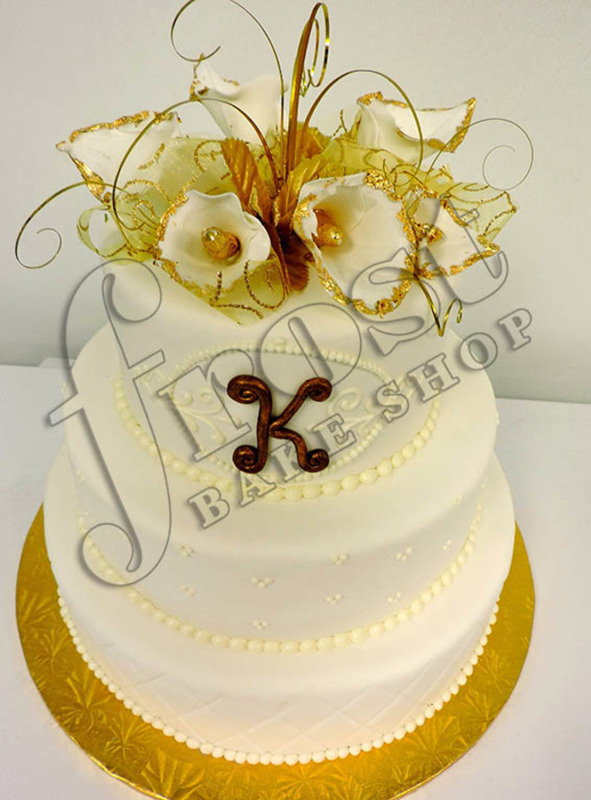 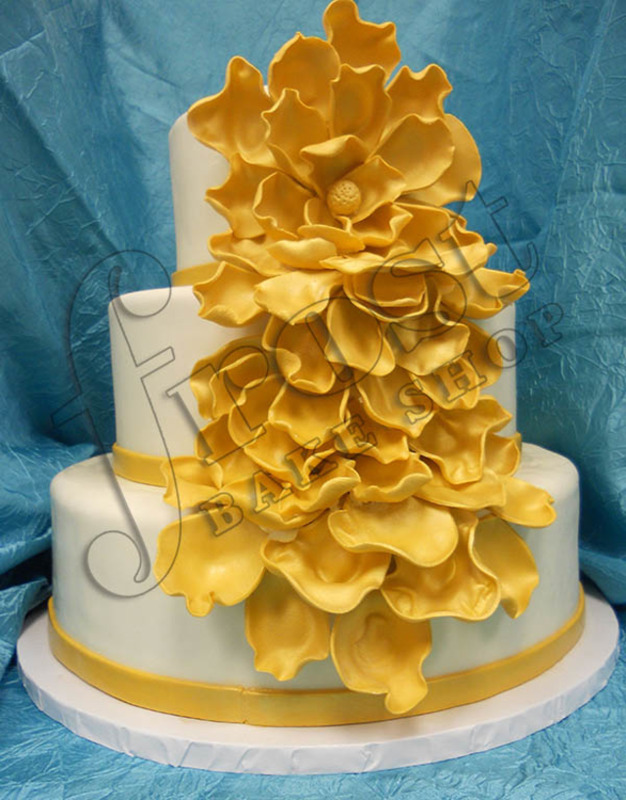 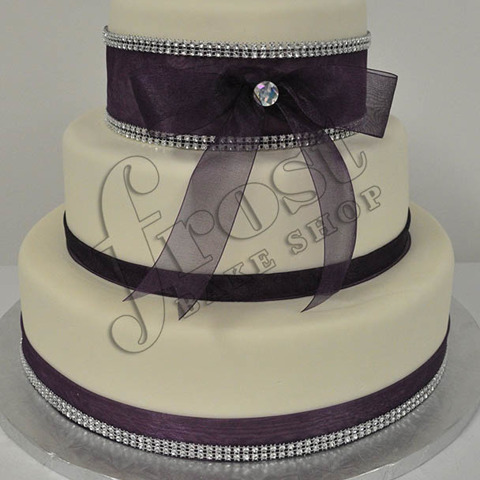 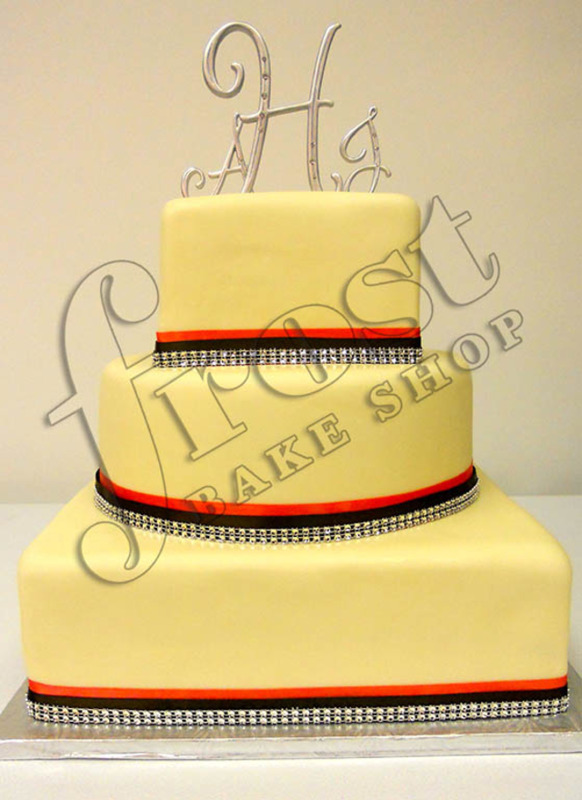 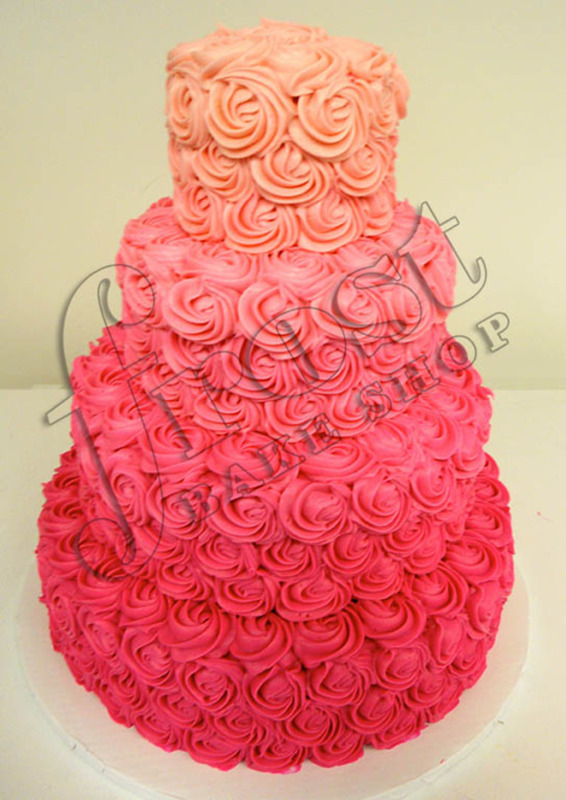 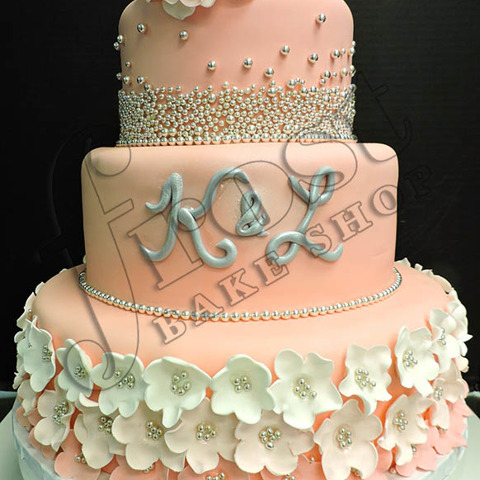 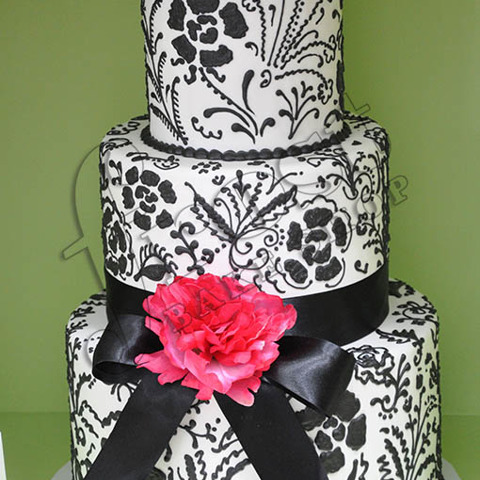 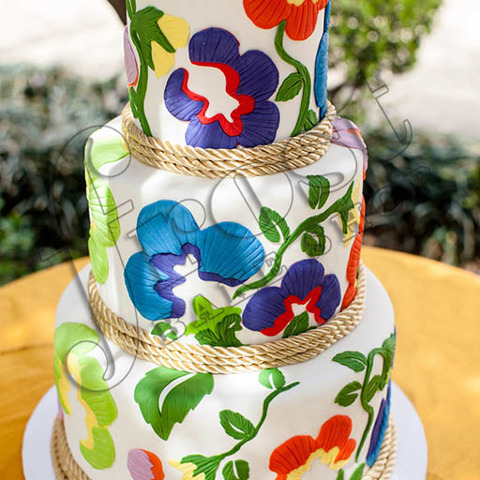 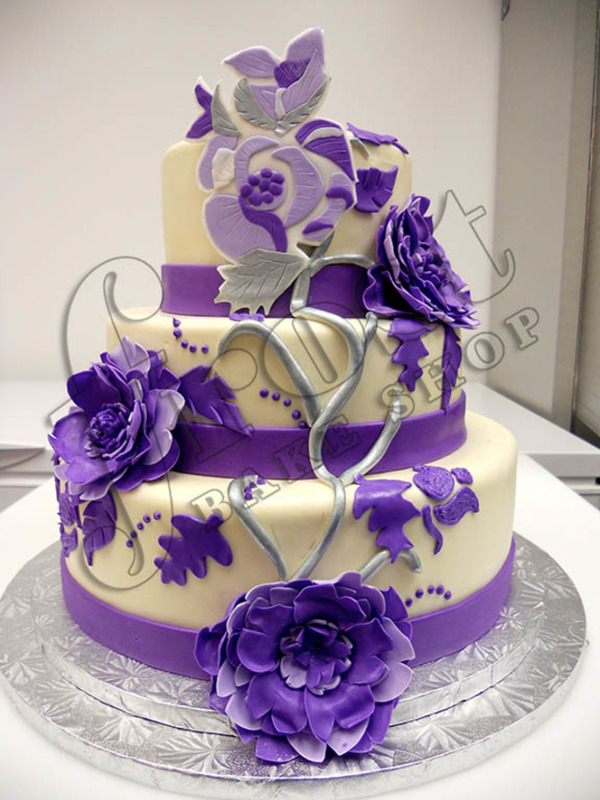 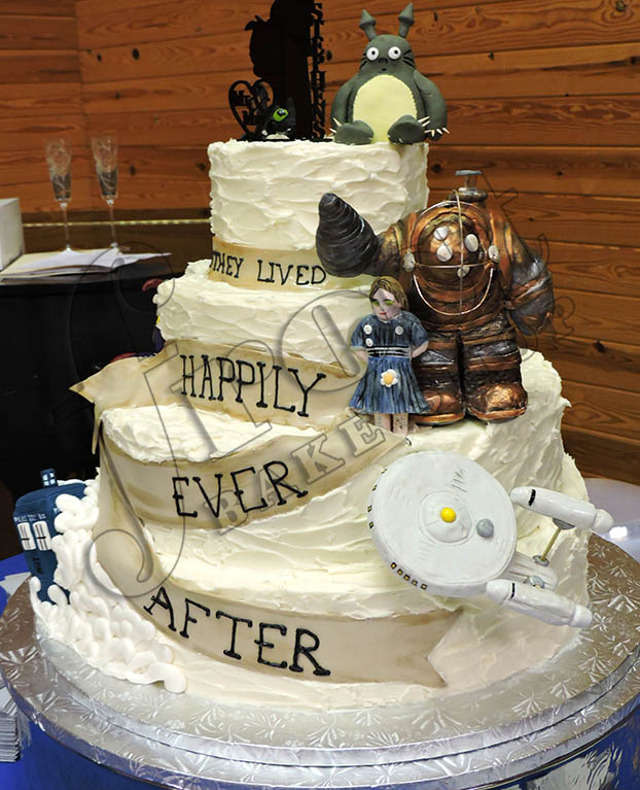 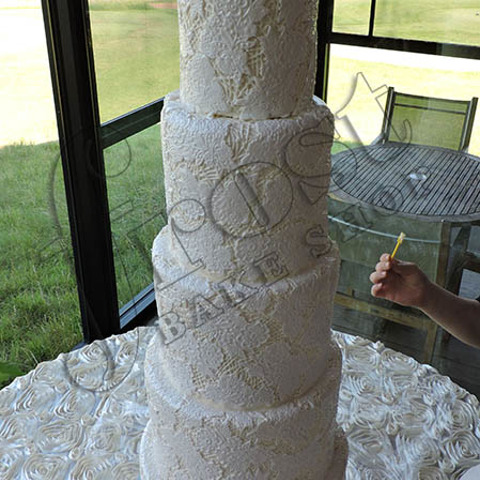 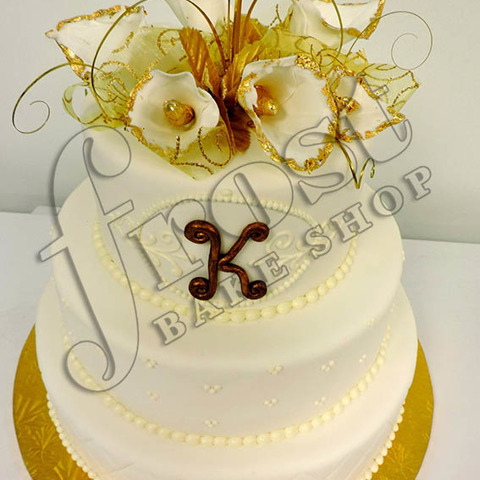 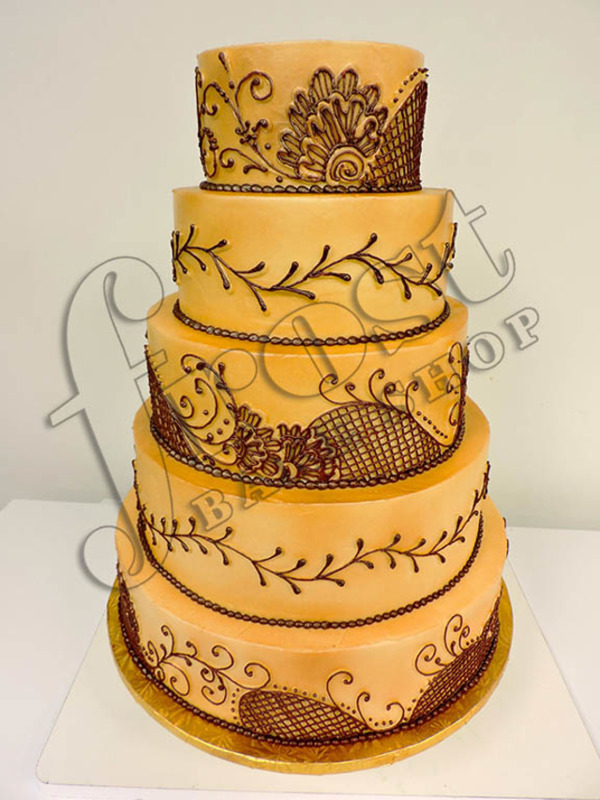 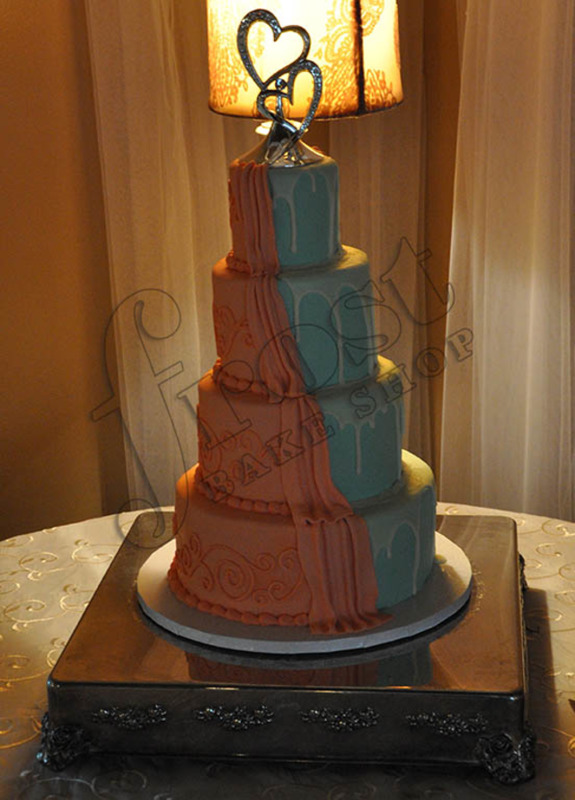 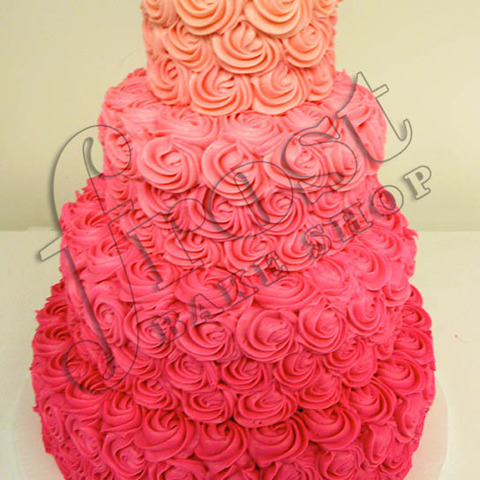 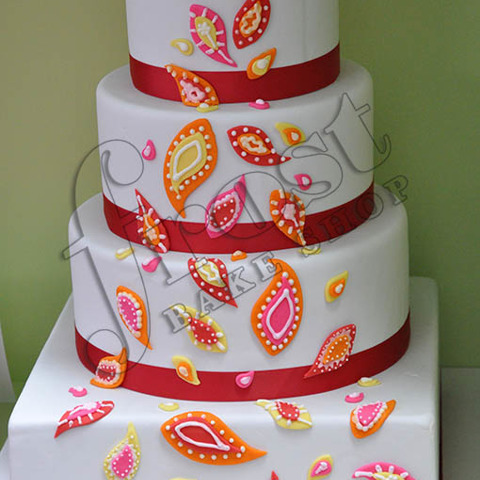 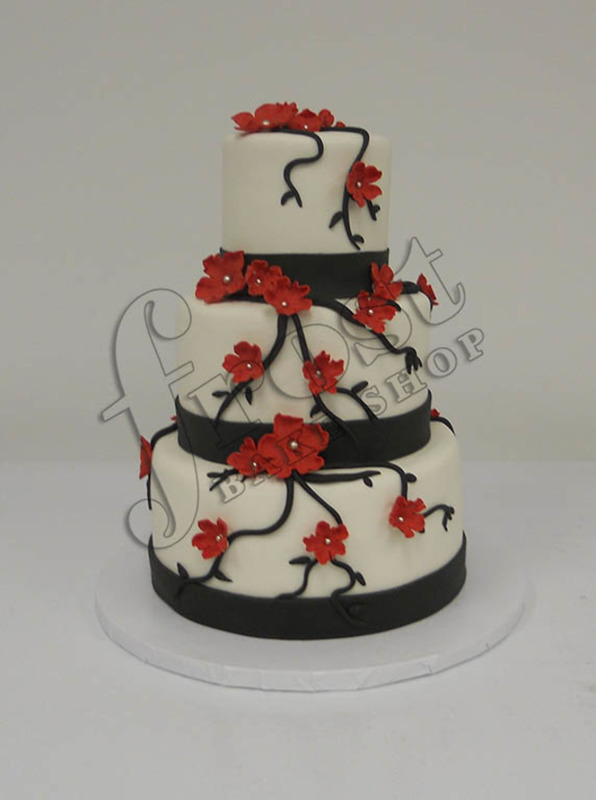 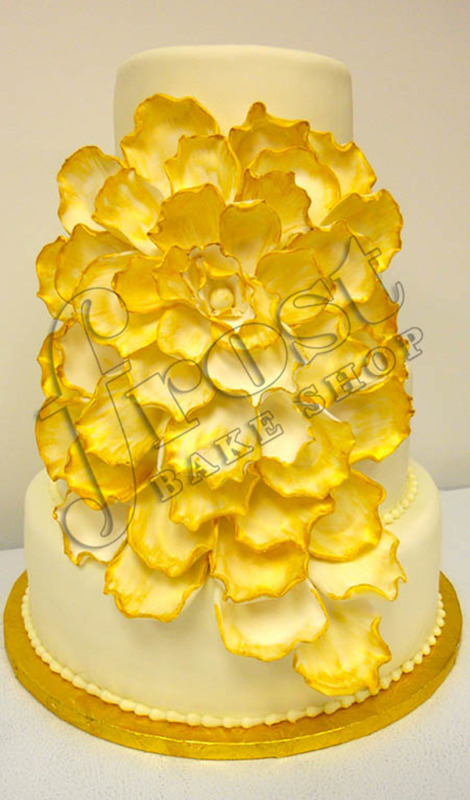 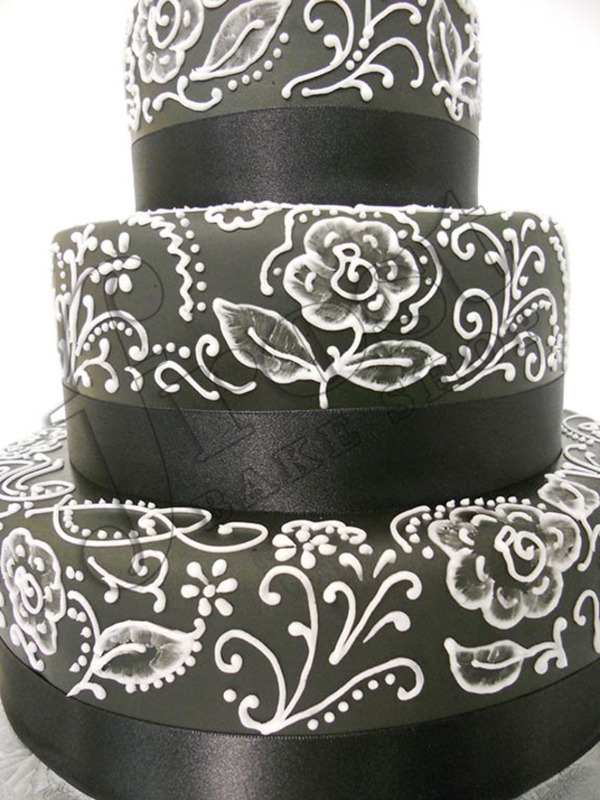 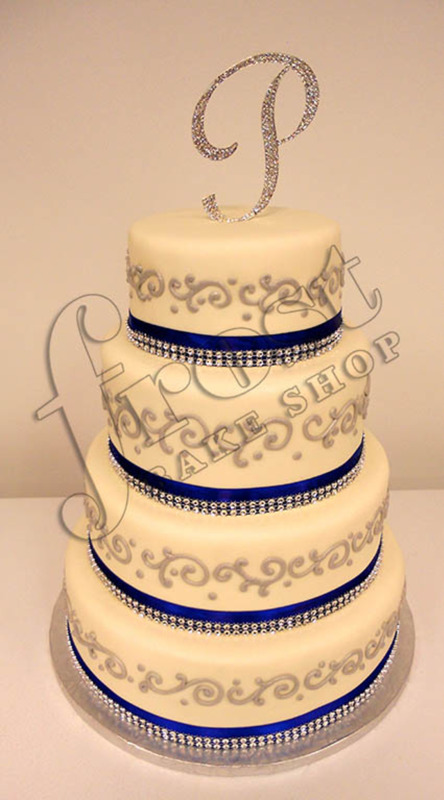 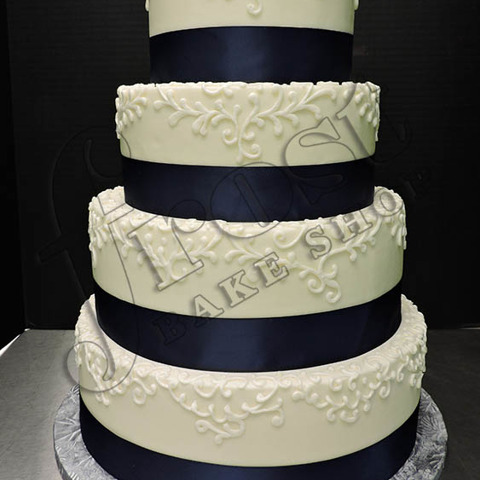 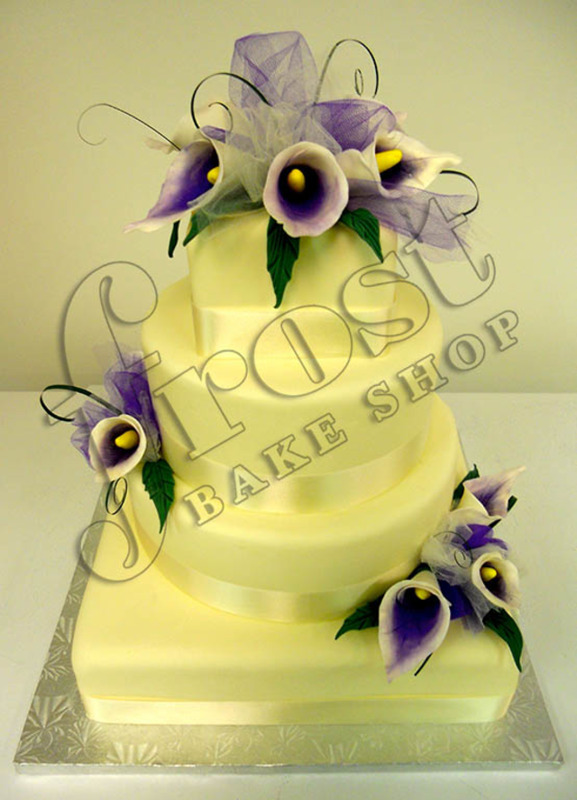 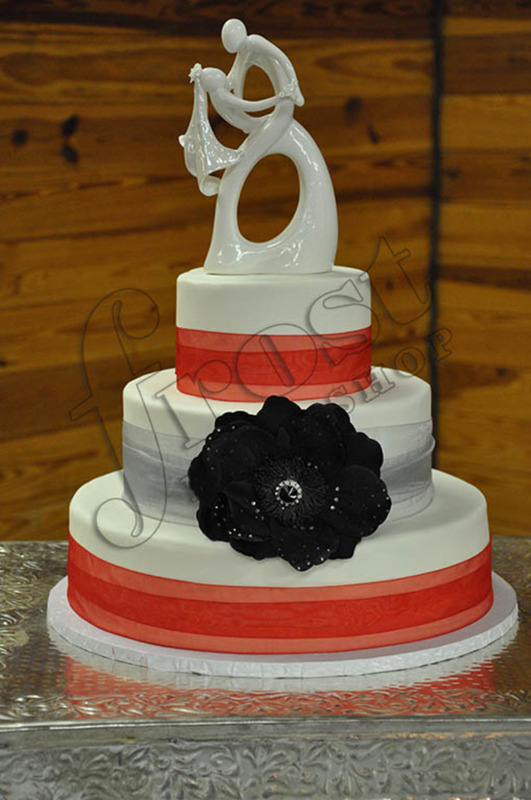 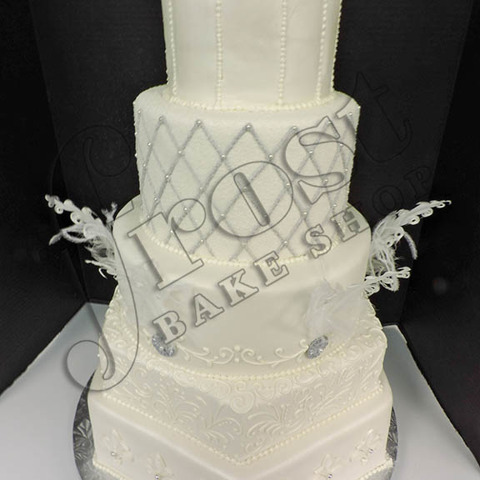 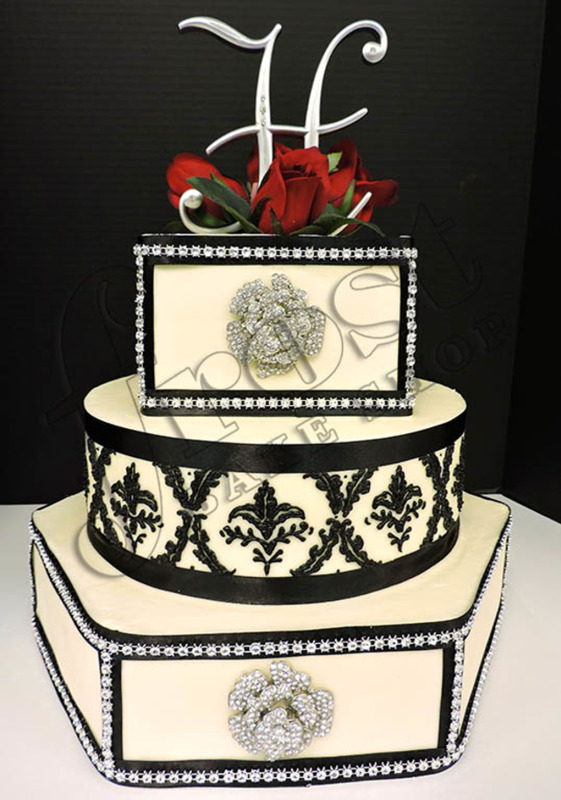 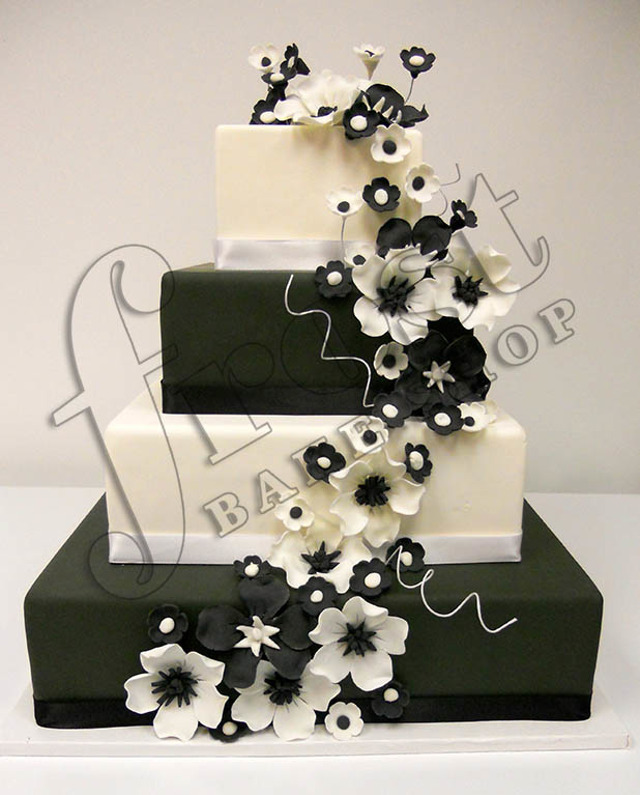 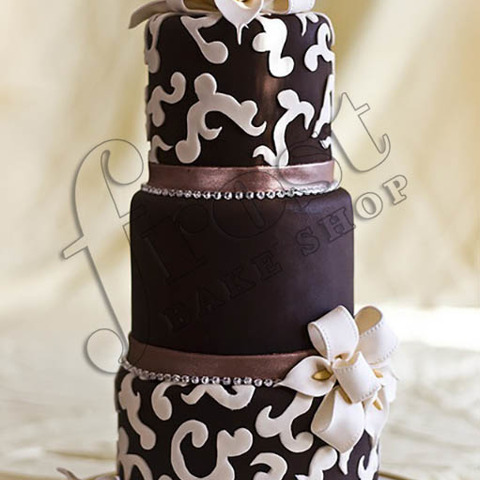 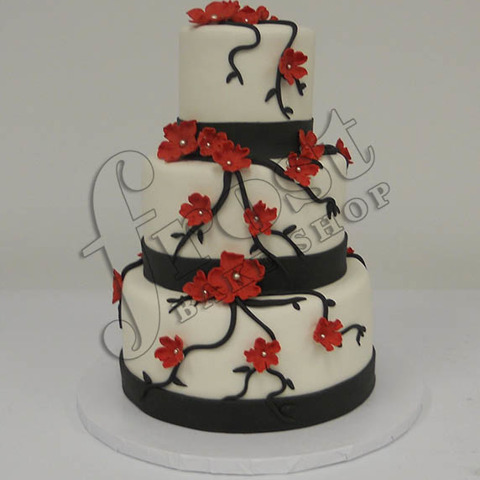 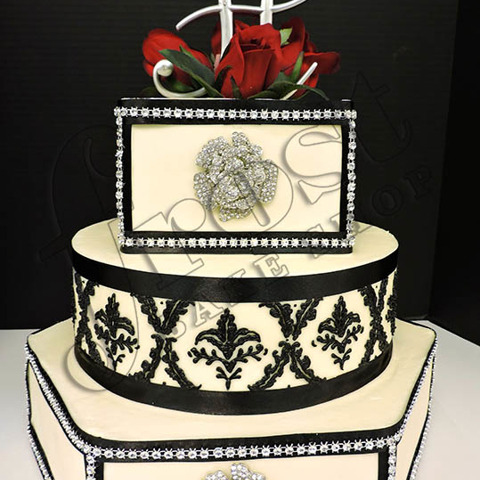 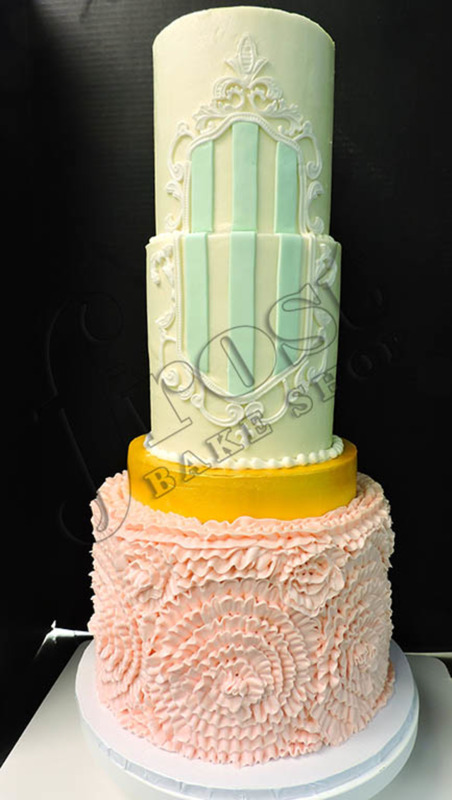 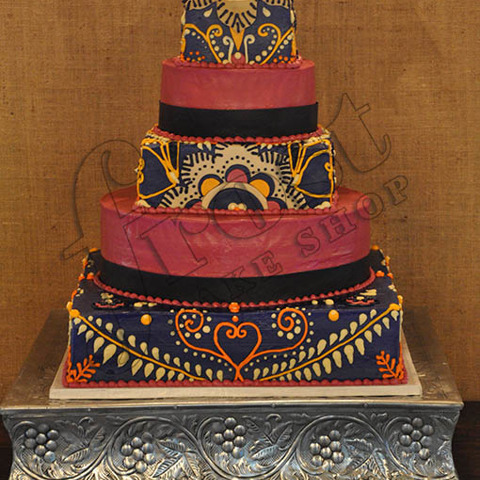 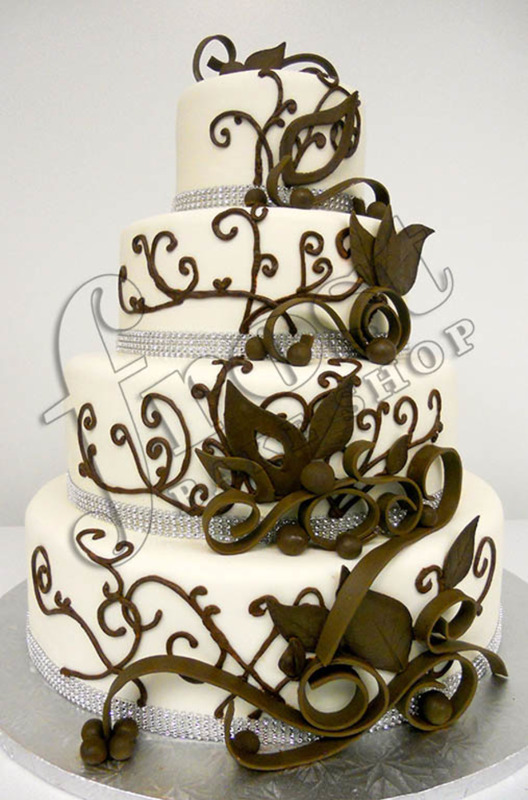 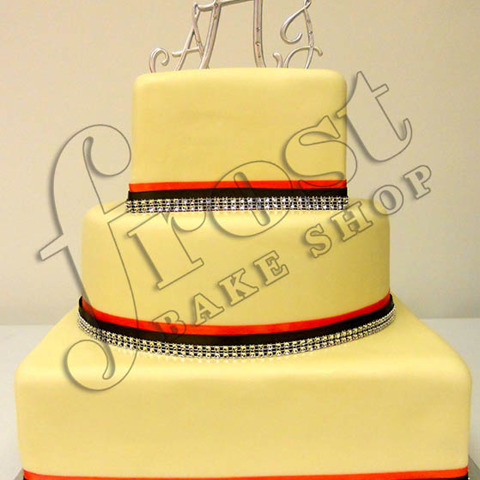 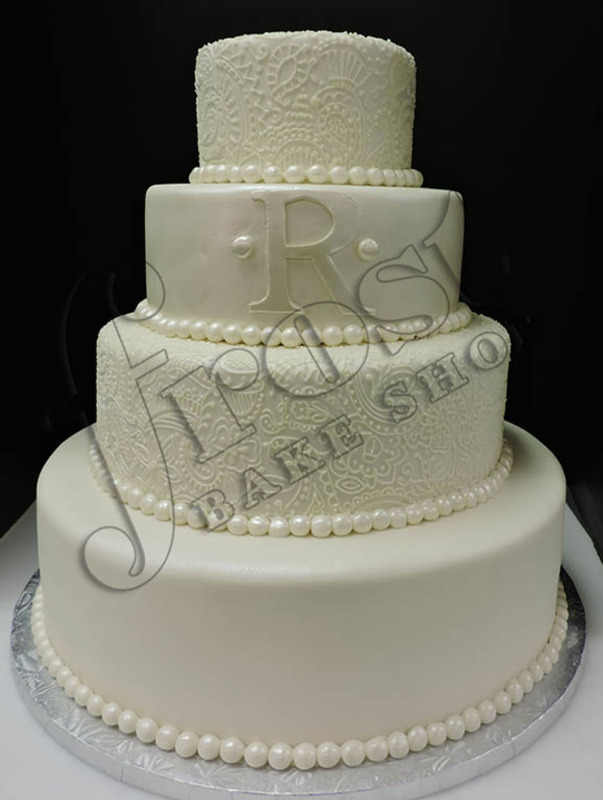 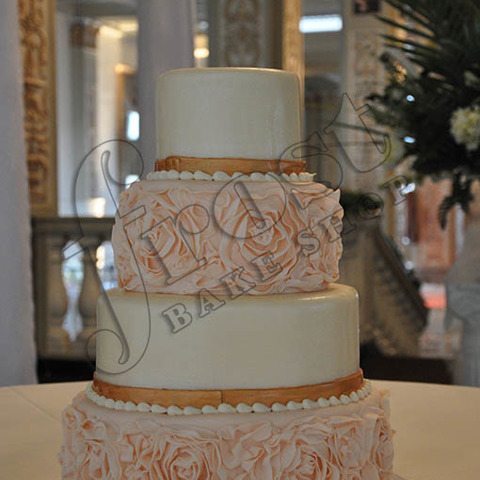 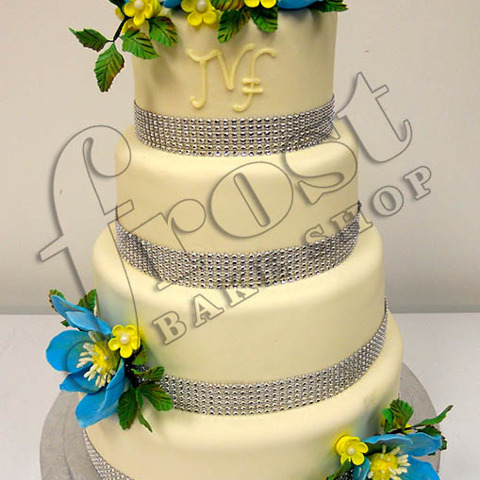 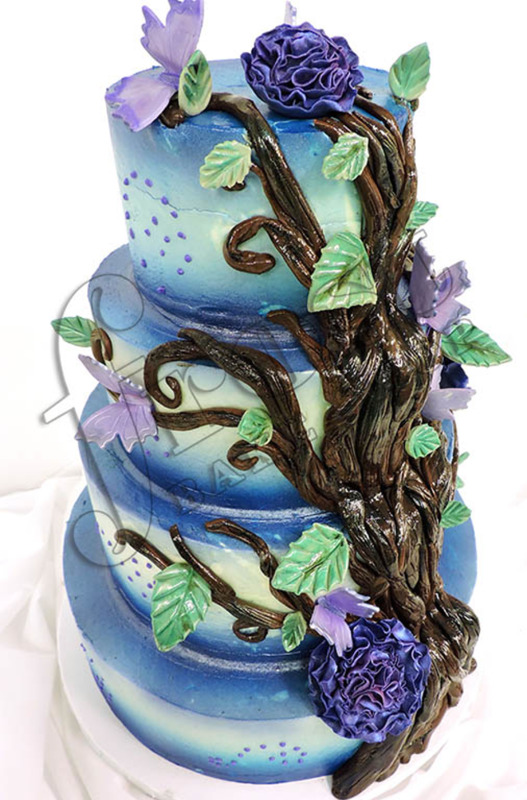 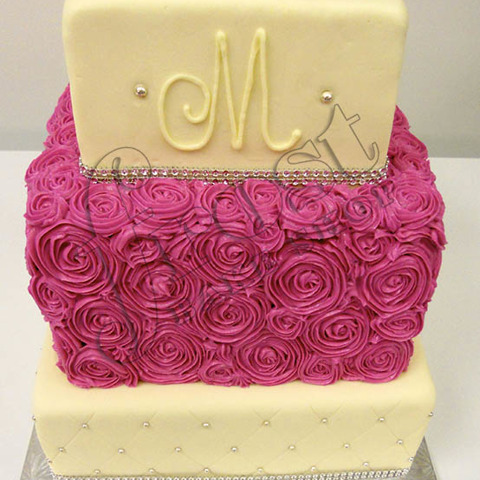 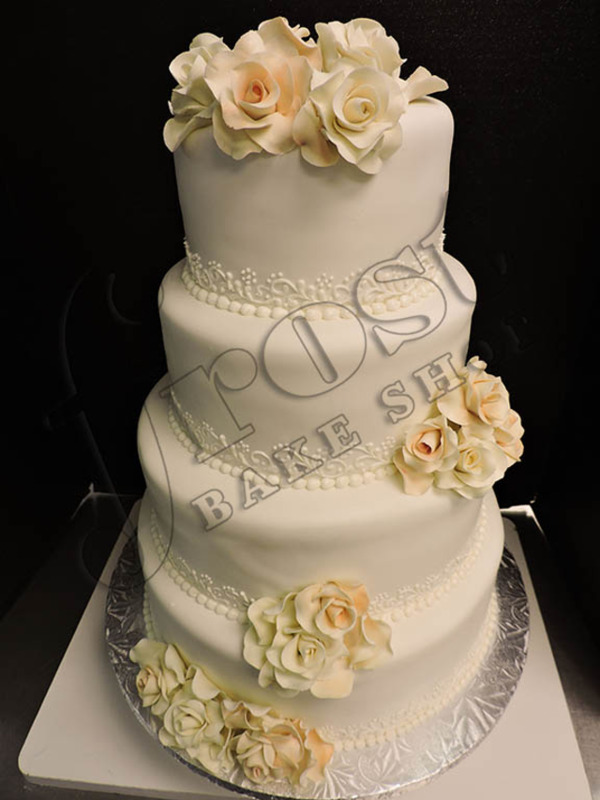 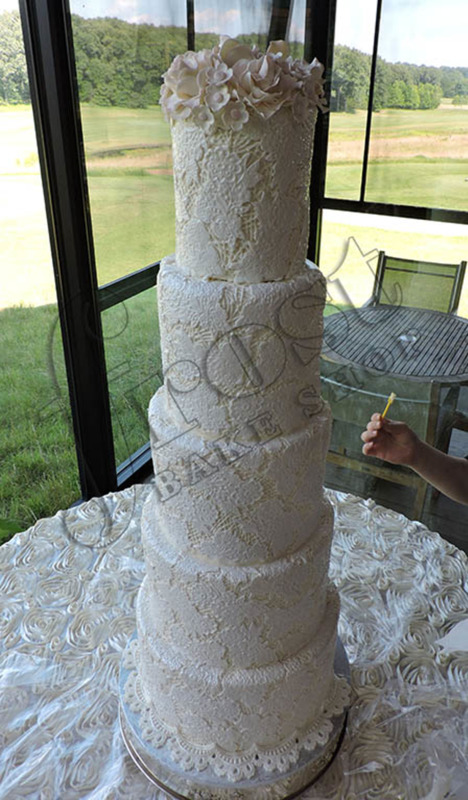 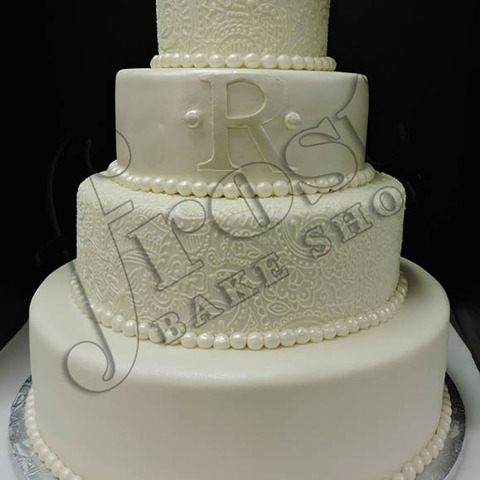 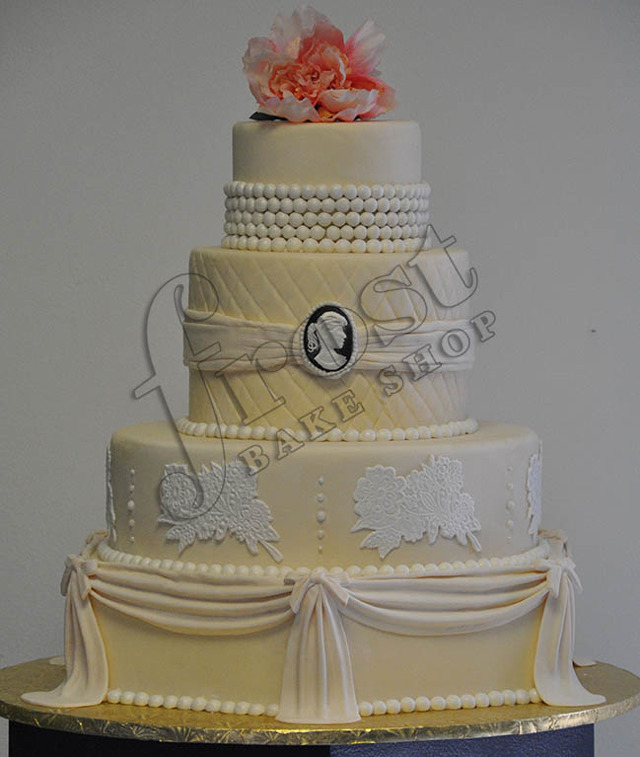 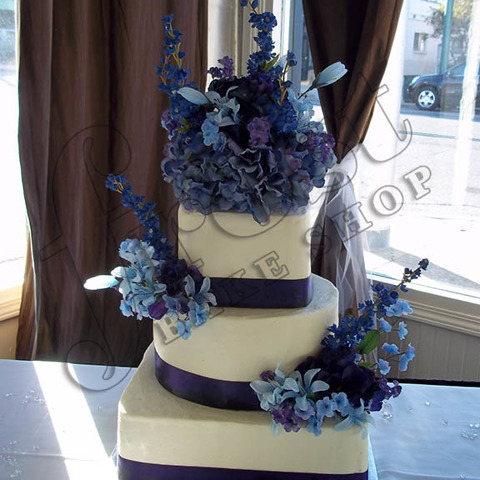 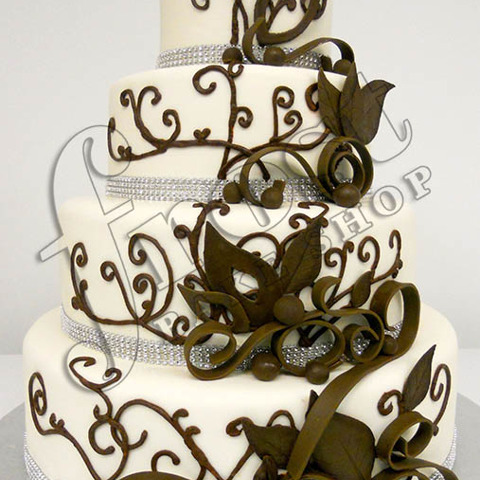 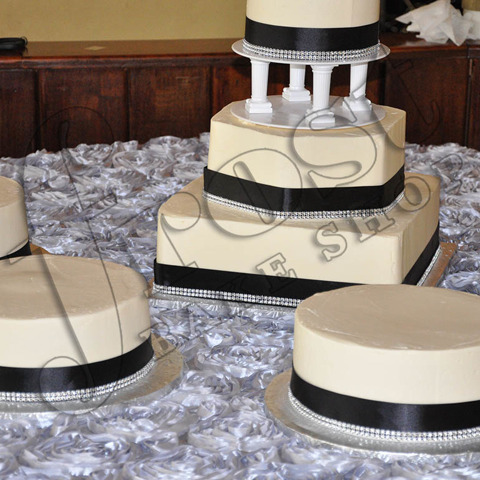 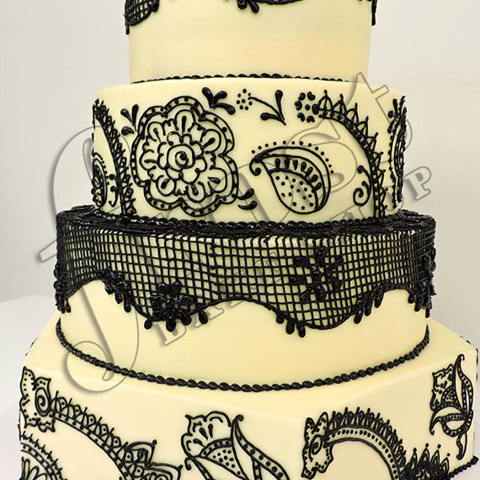 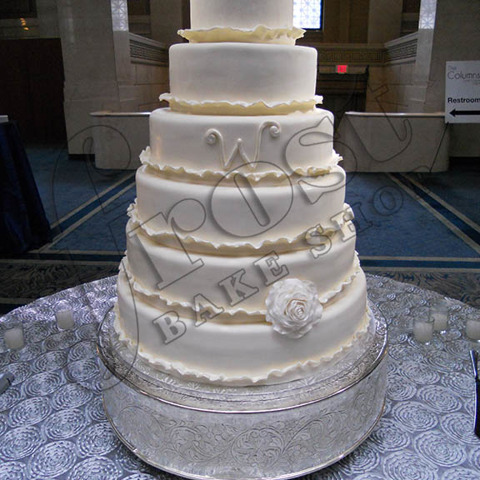 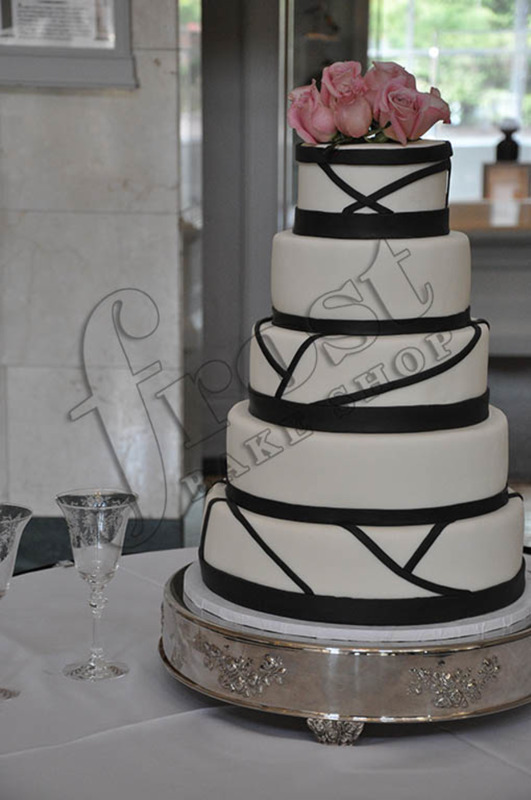 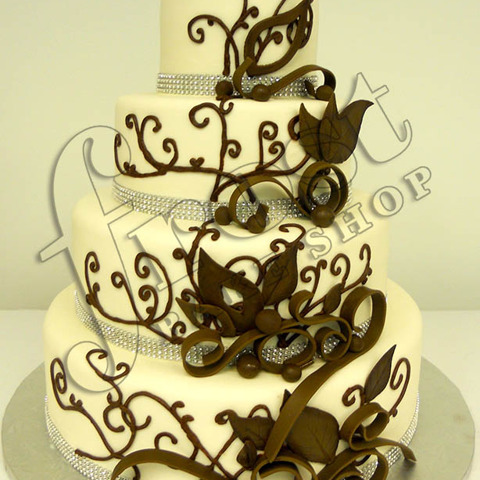 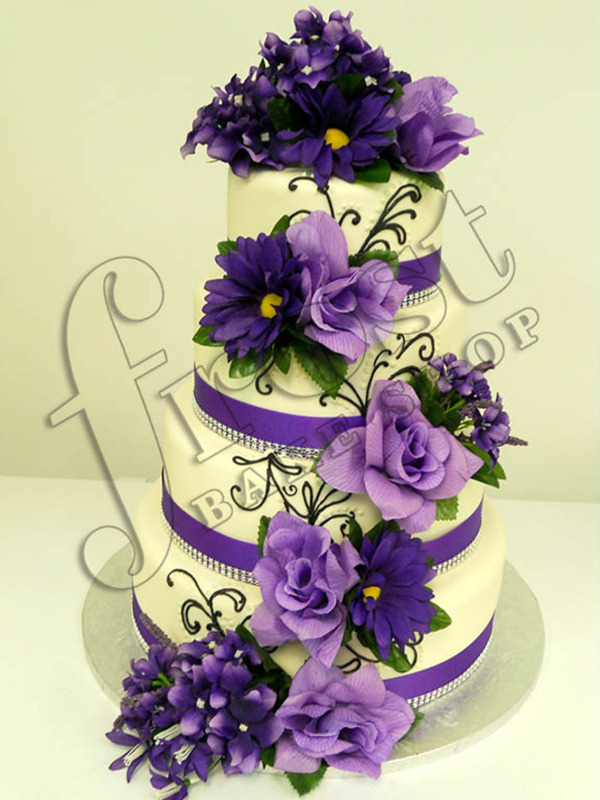 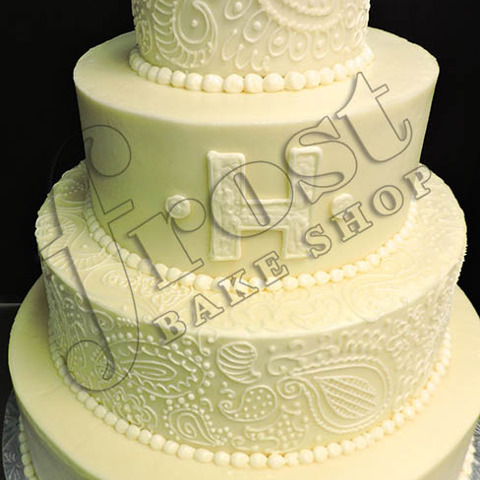 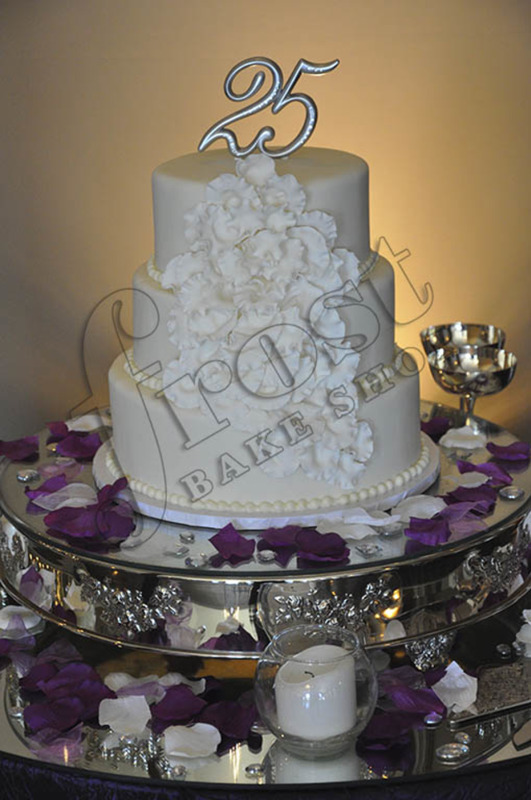 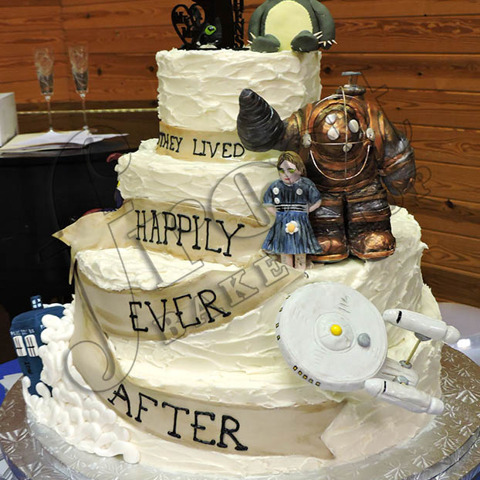 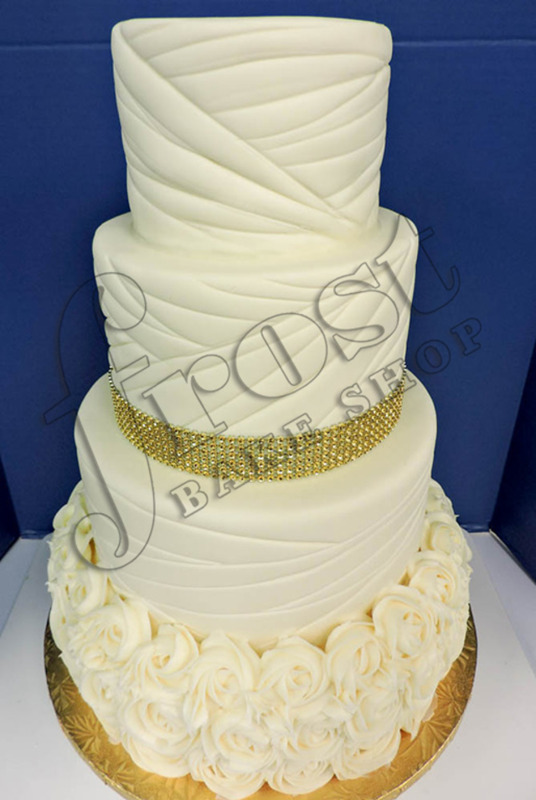 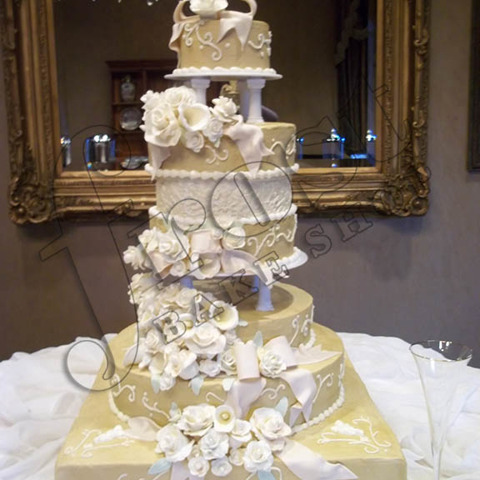 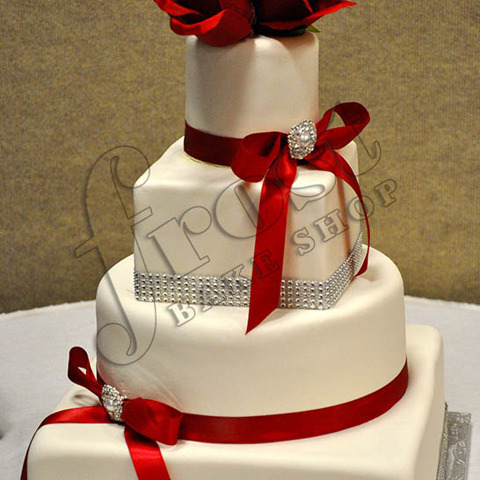 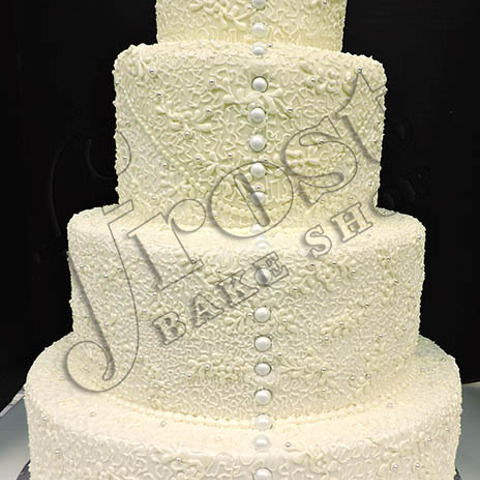 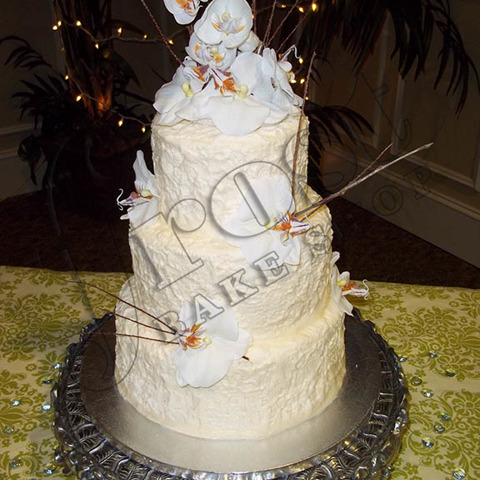 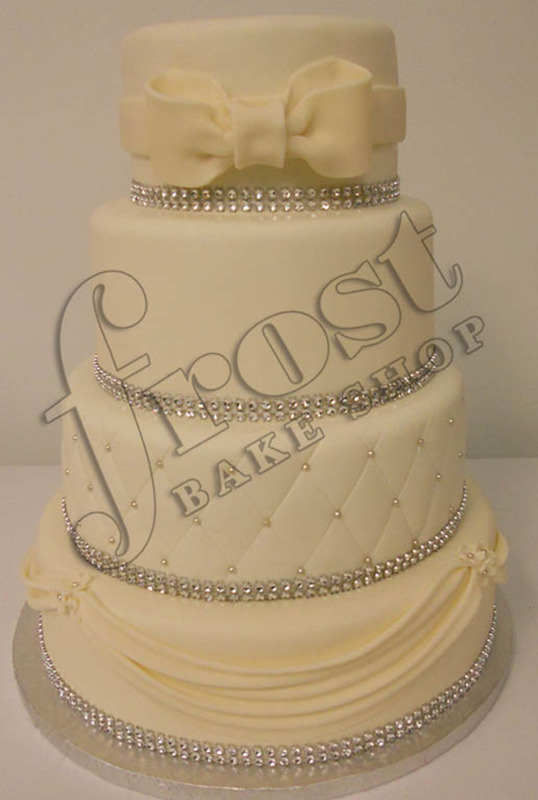 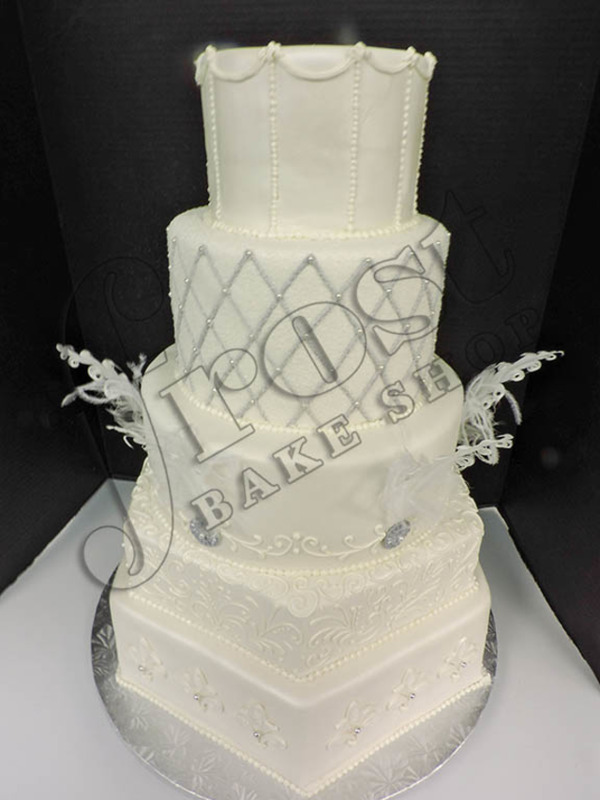 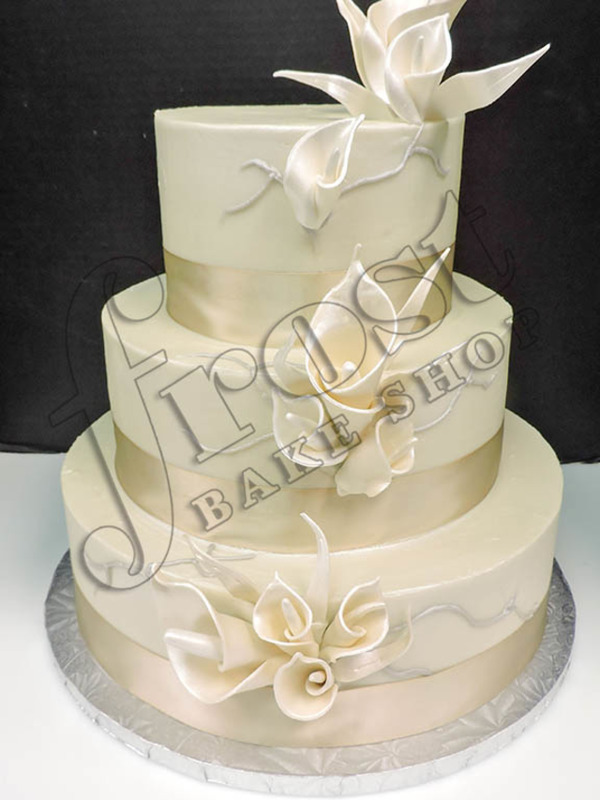 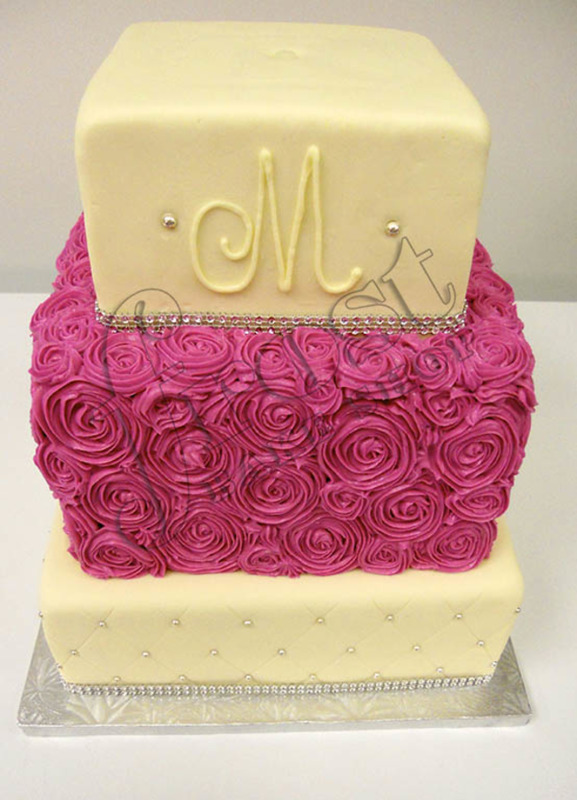 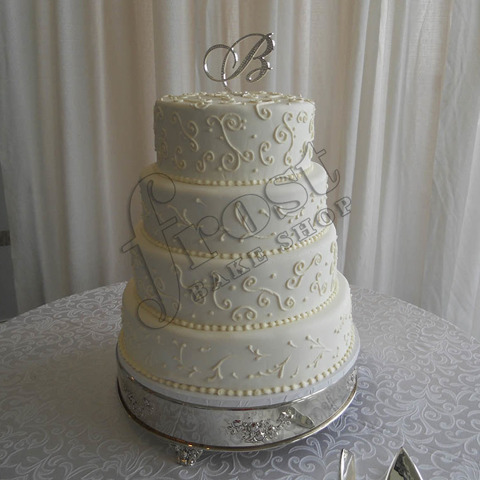 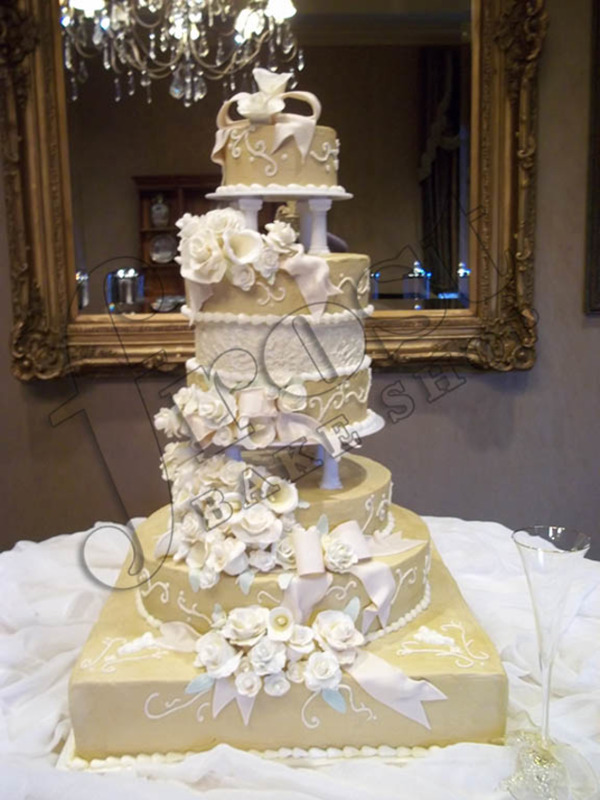 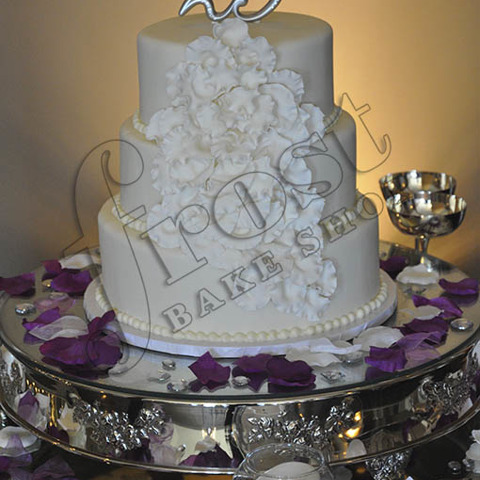 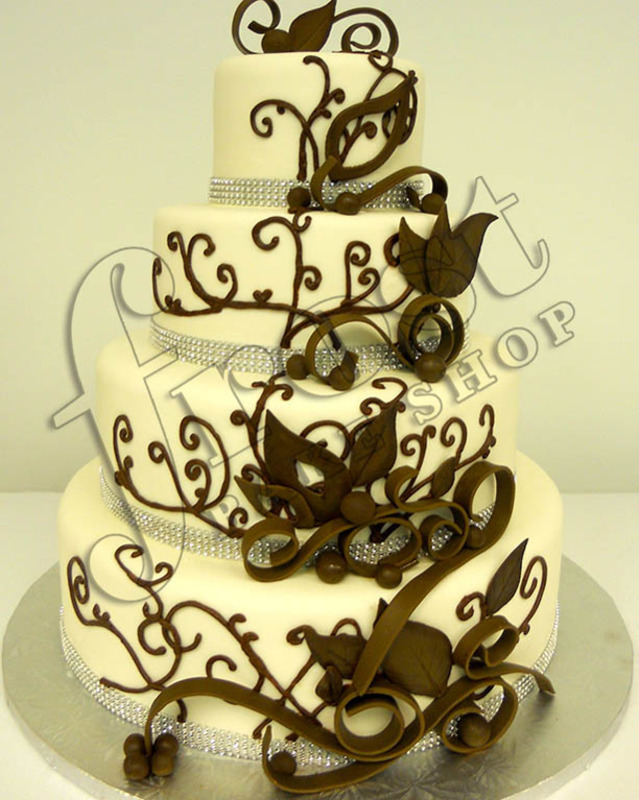 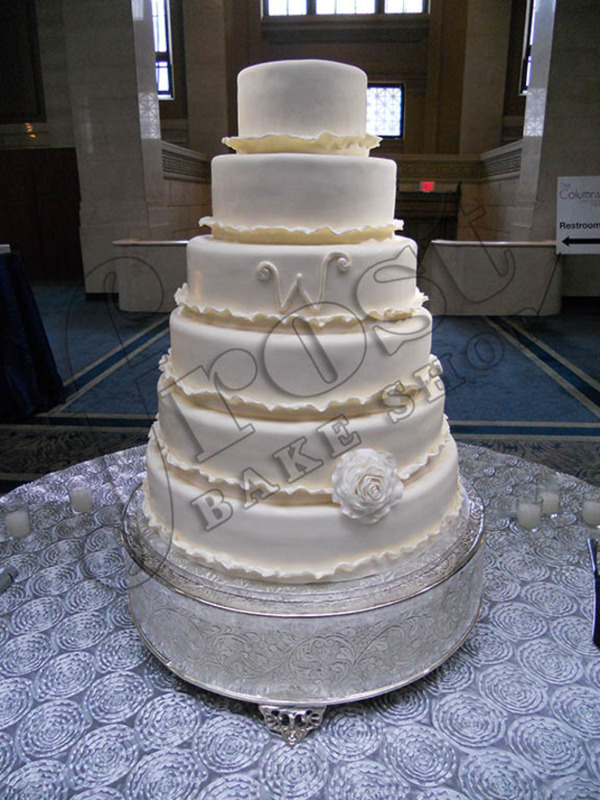 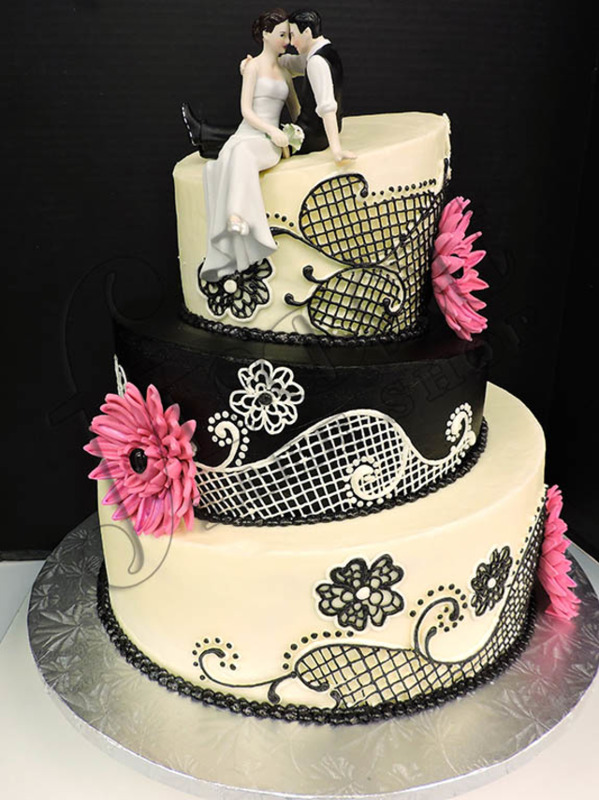 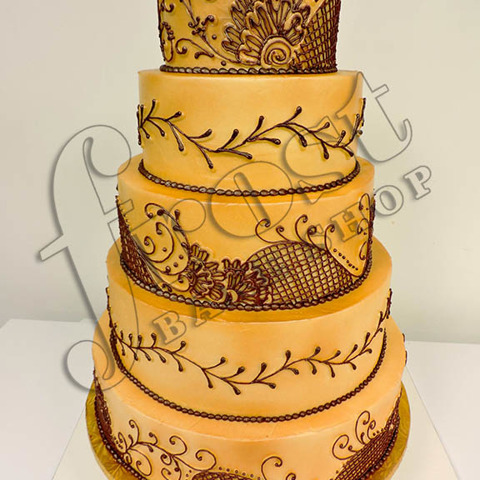 Your choice in wedding cake design makes a statement about your personality and sense of style. 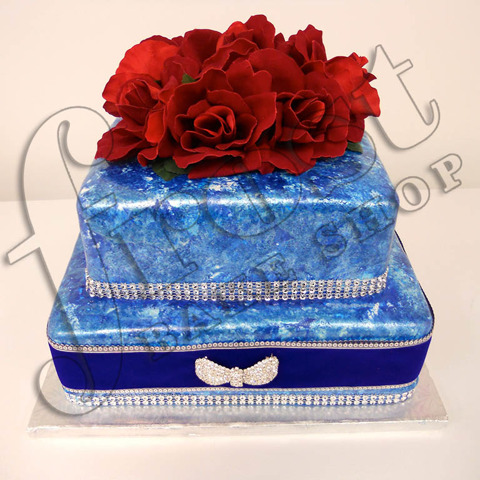 It should reflect you and your good taste. 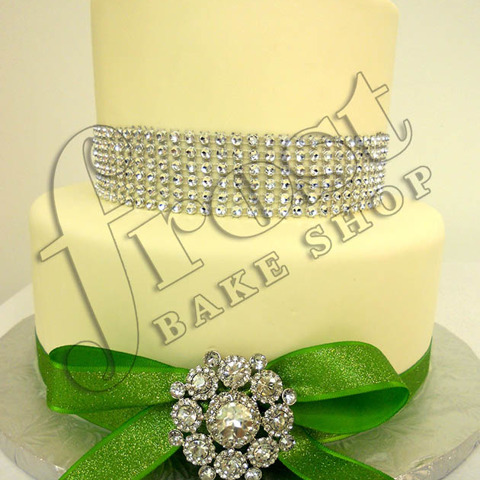 You may choose a sophisticated elegant look. 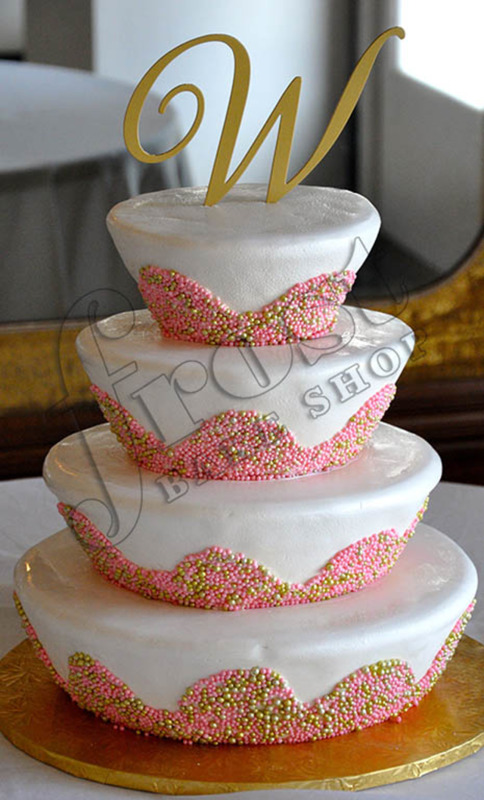 Or show your playfulness and sense of humor as in the case of "whimsical" styles. 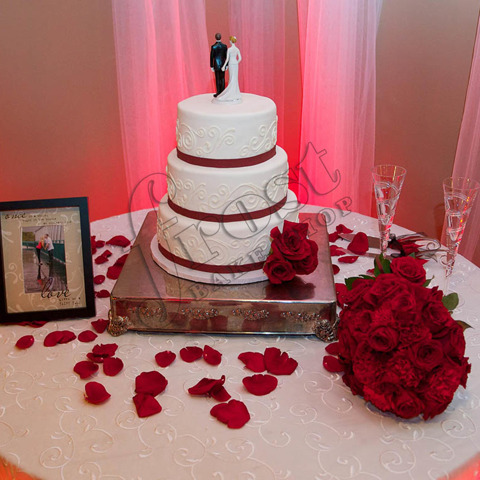 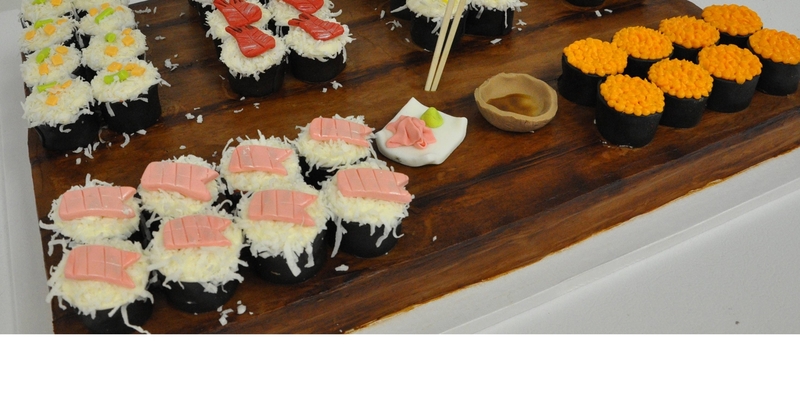 It should also fit well with the location, the decorating, and ambiance which you have created for your reception. 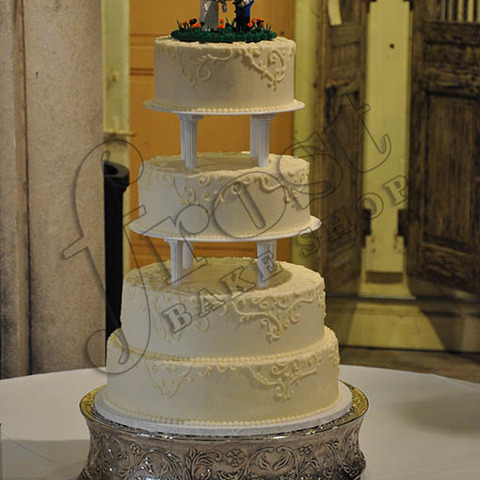 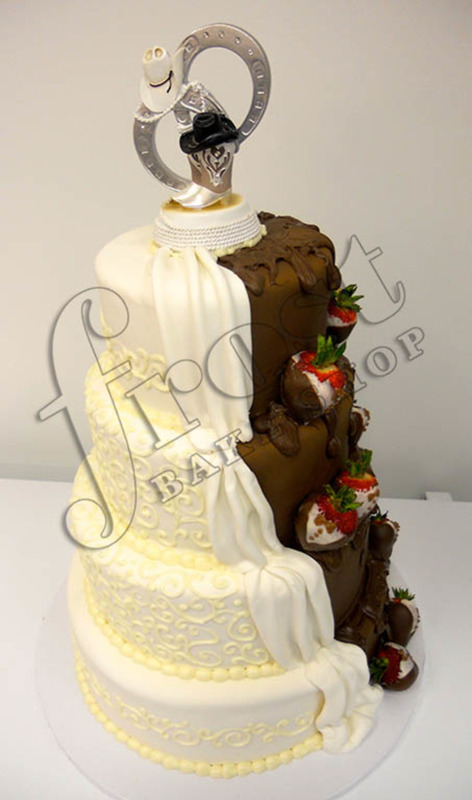 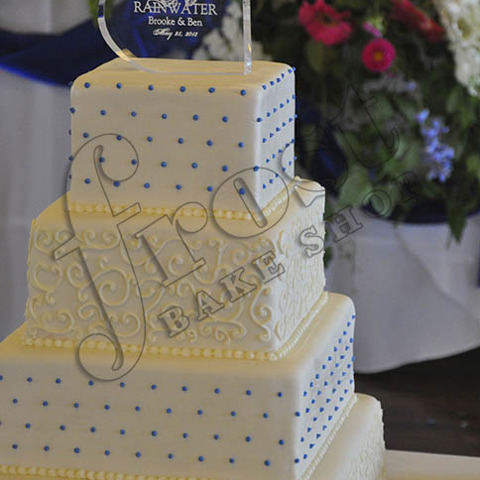 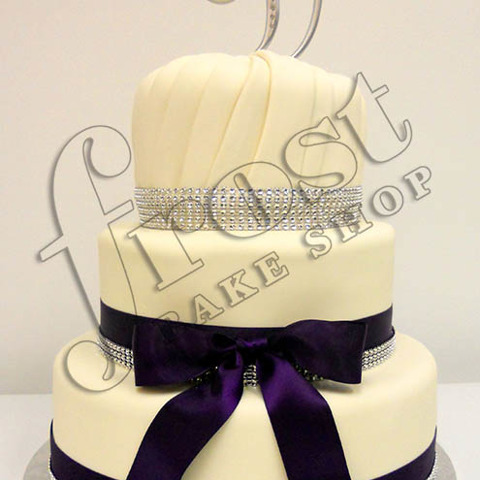 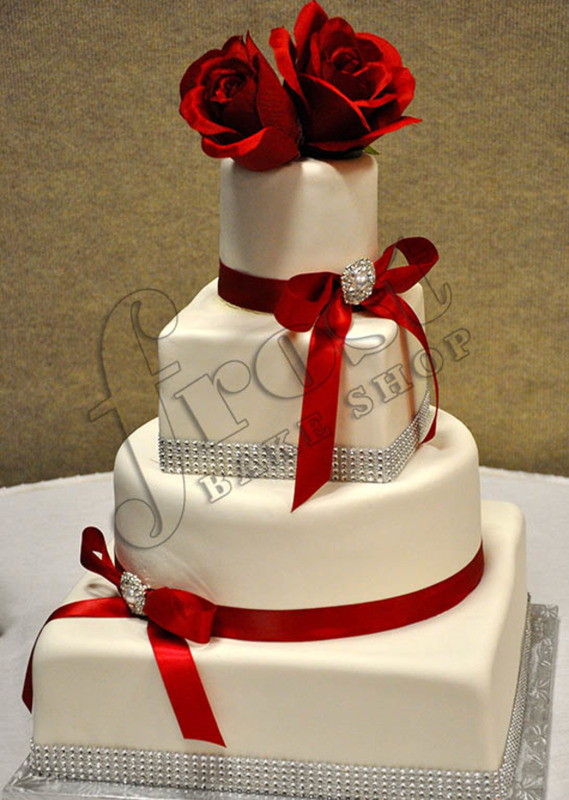 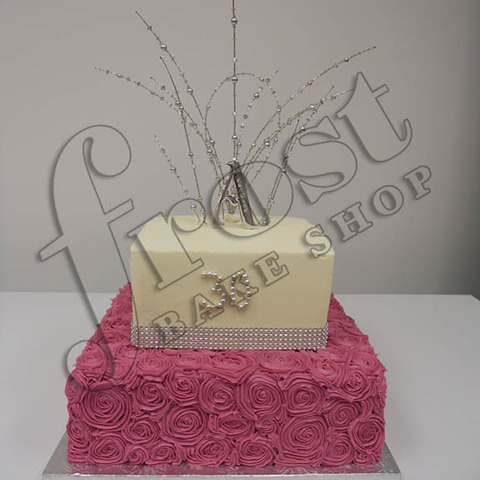 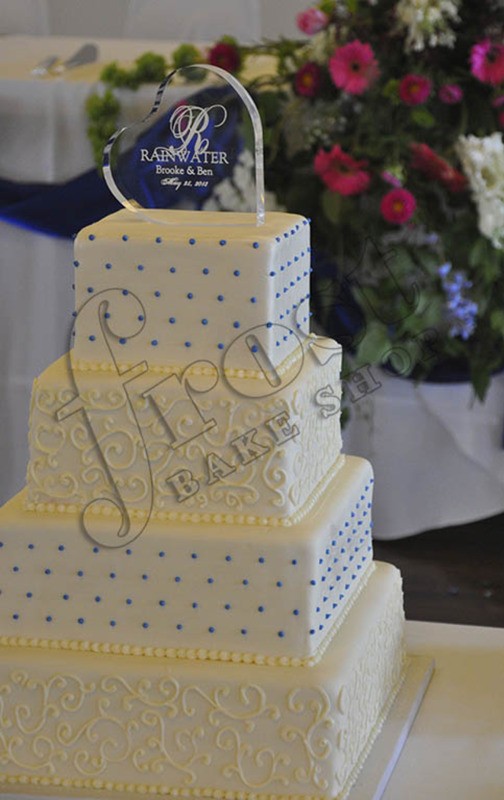 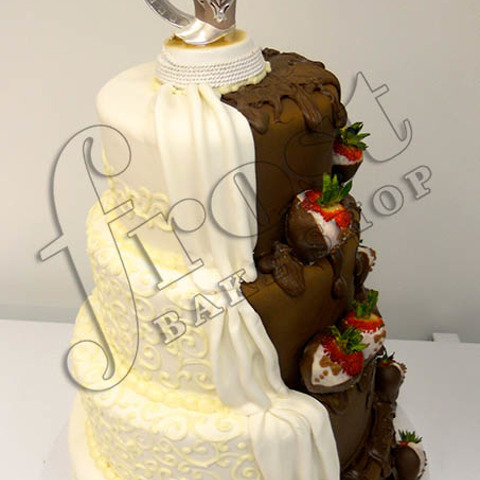 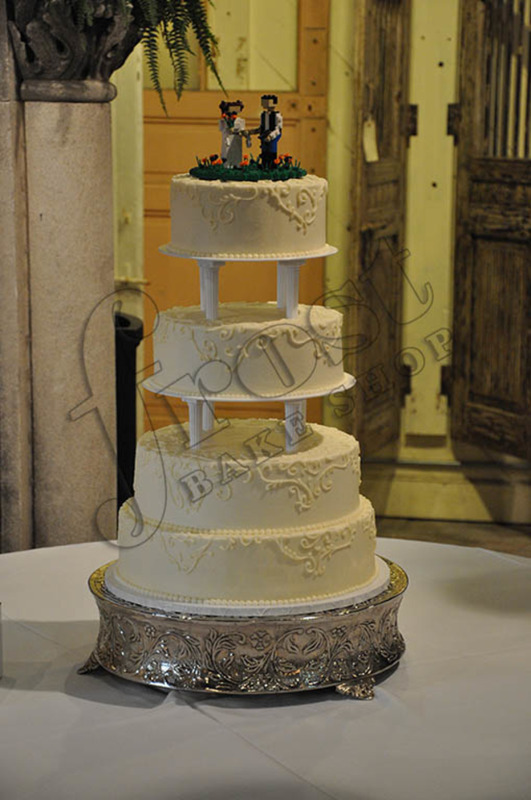 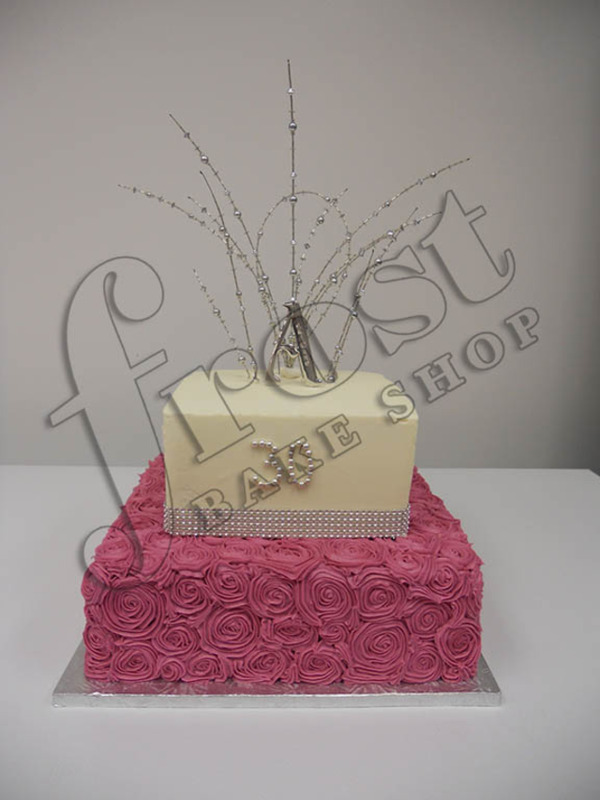 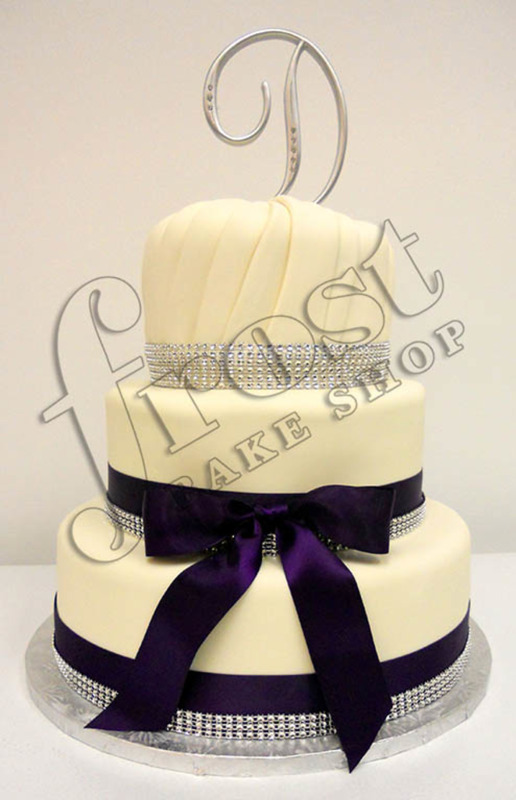 Remember, you are buying a memory - the cake is the second most photographed item at the wedding, after the bride. 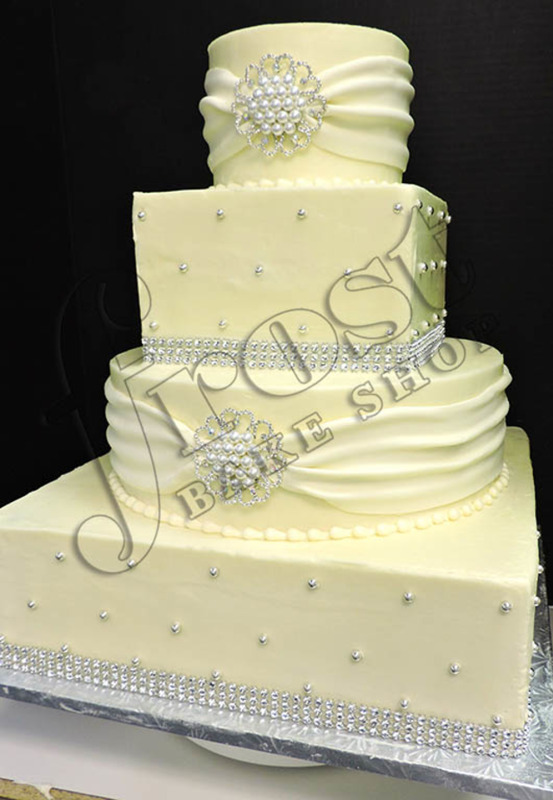 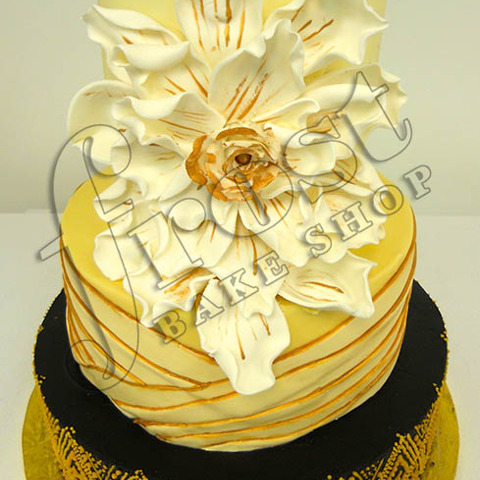 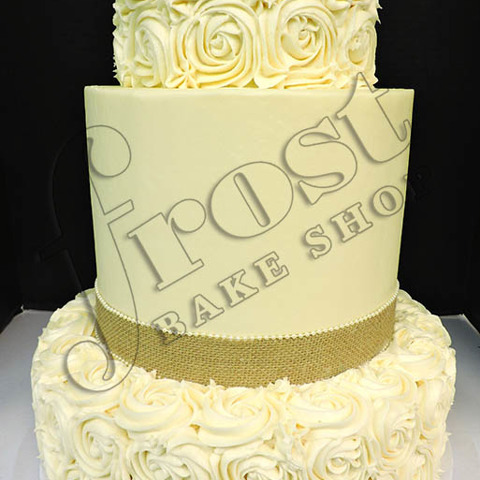 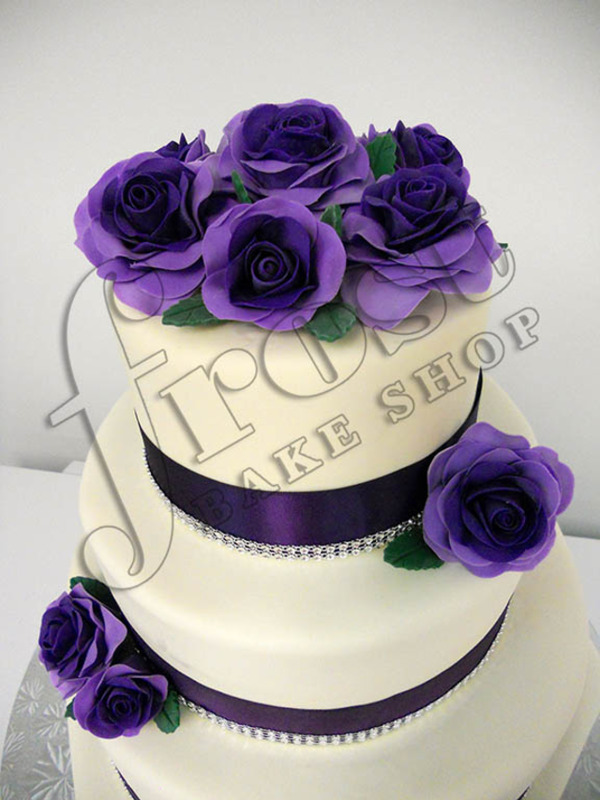 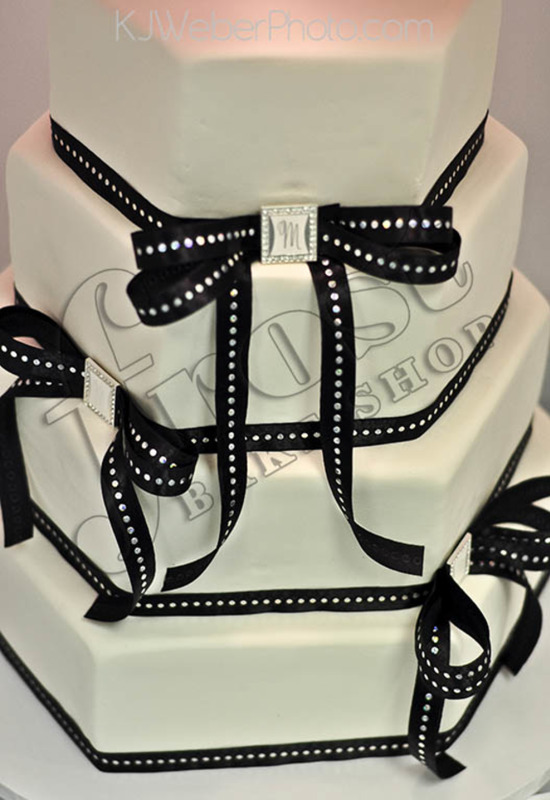 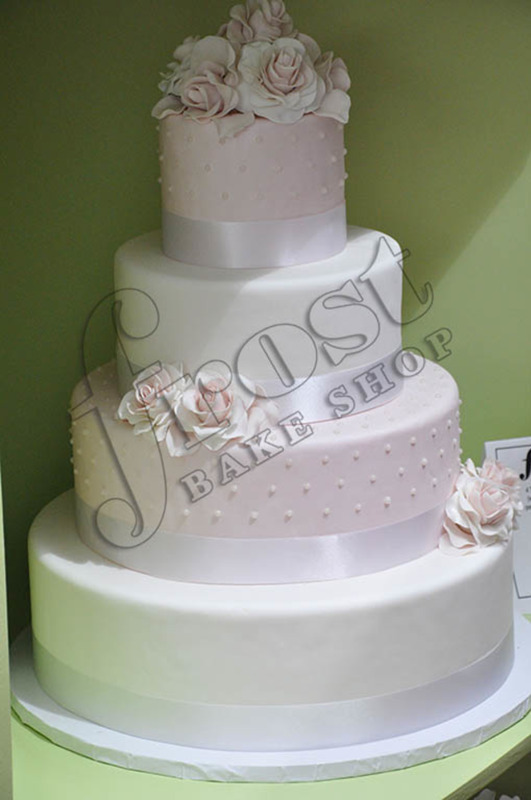 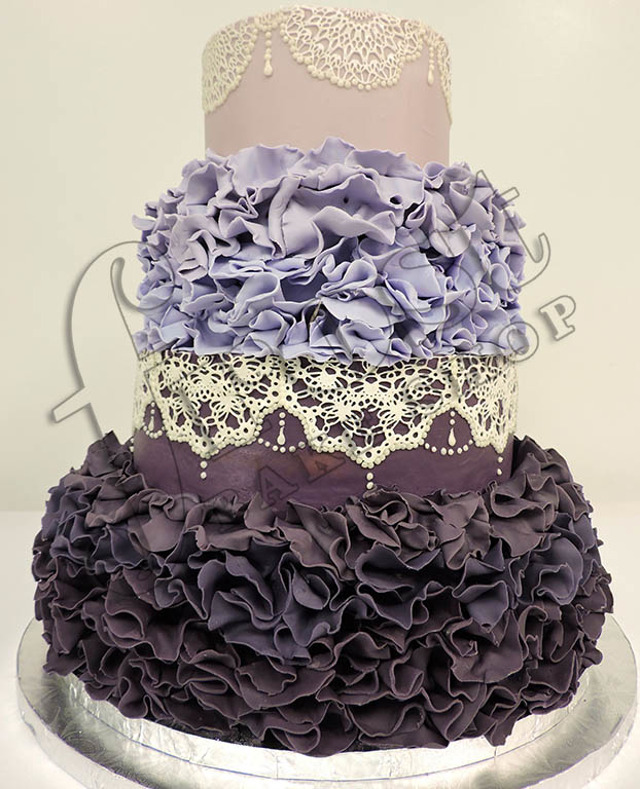 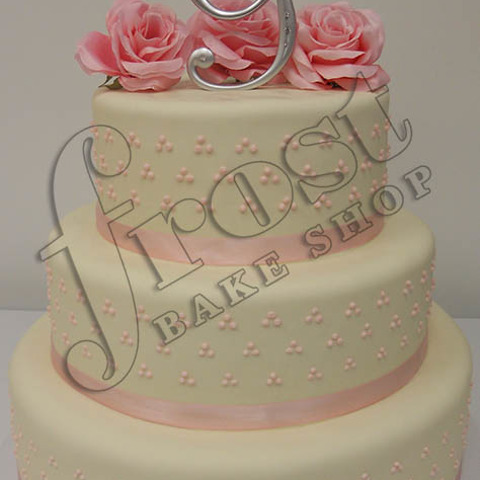 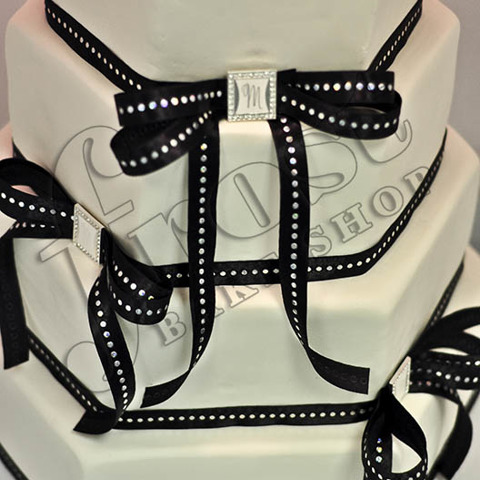 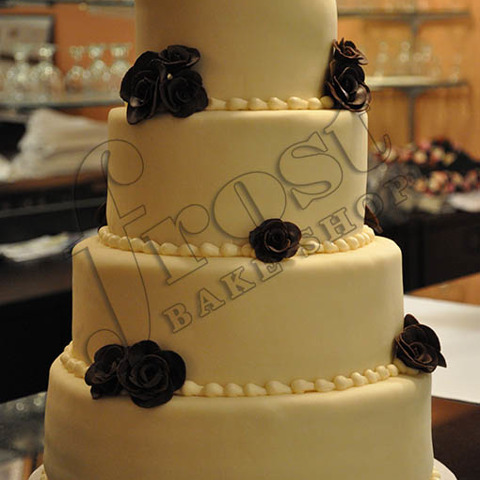 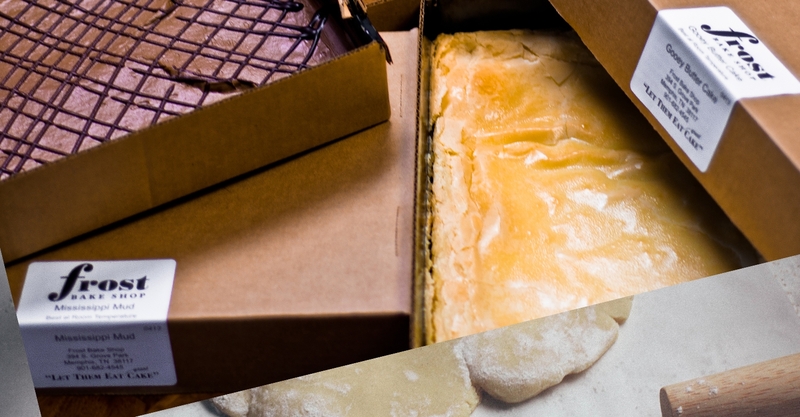 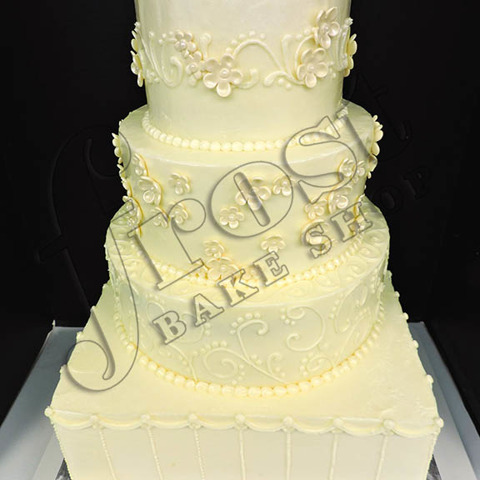 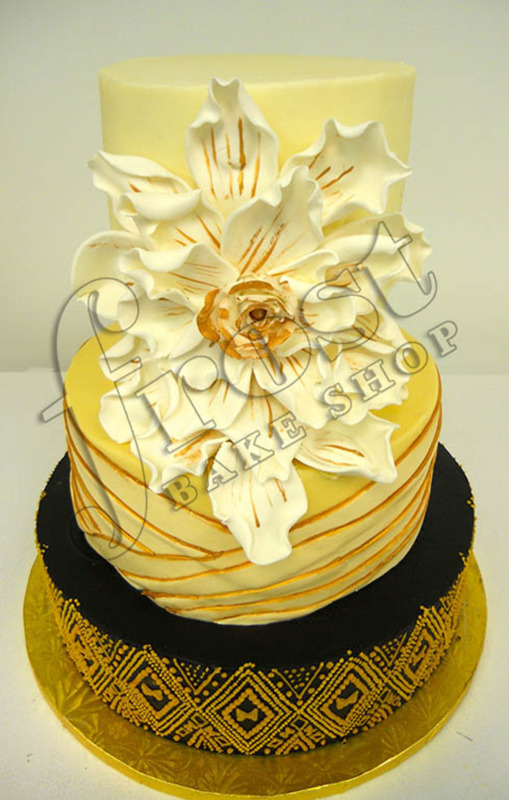 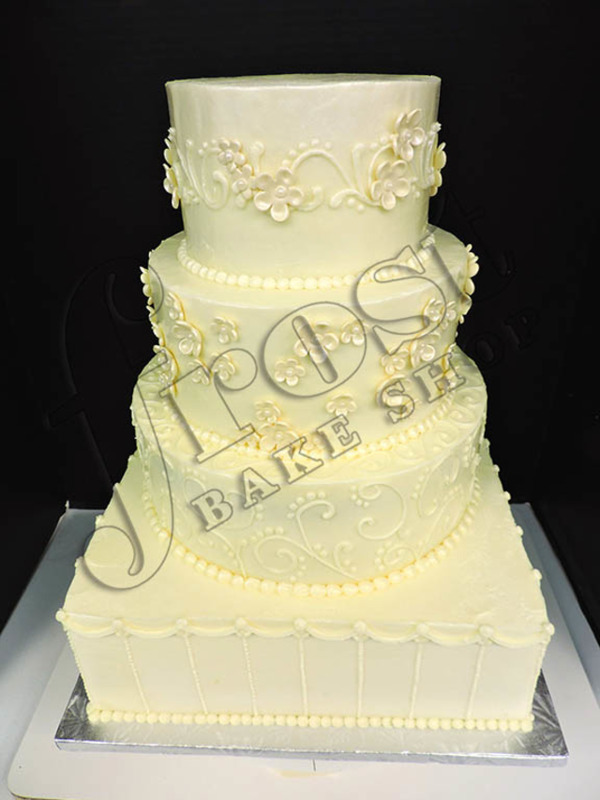 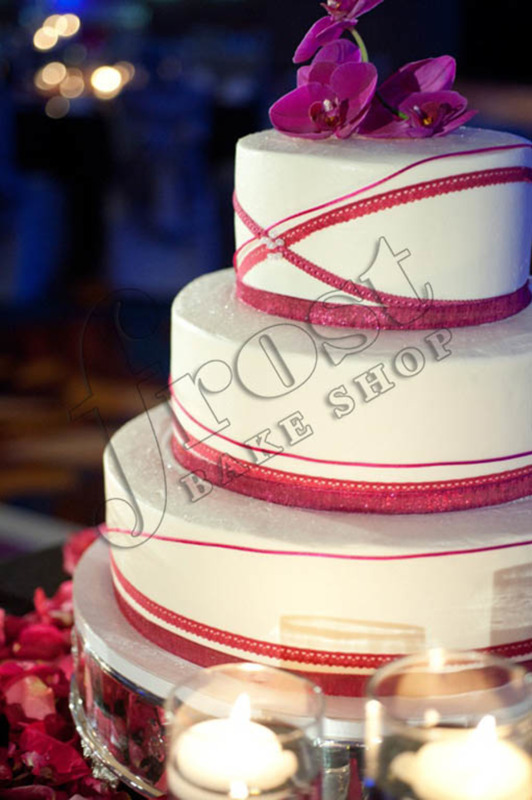 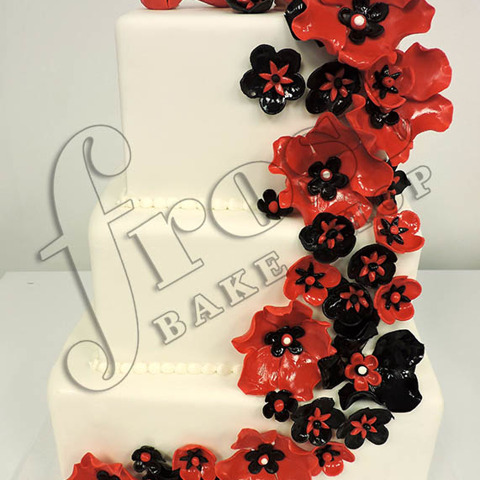 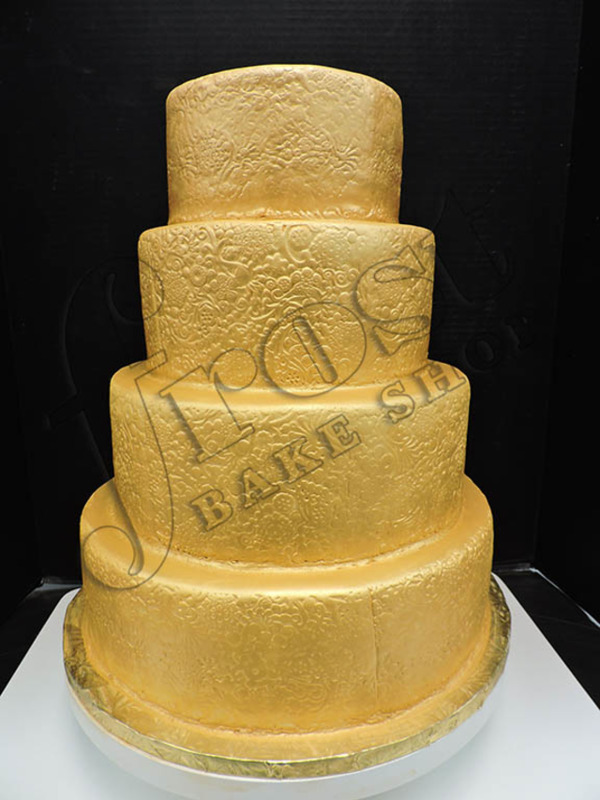 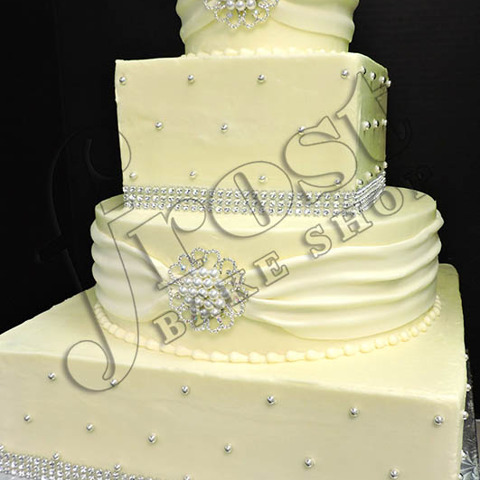 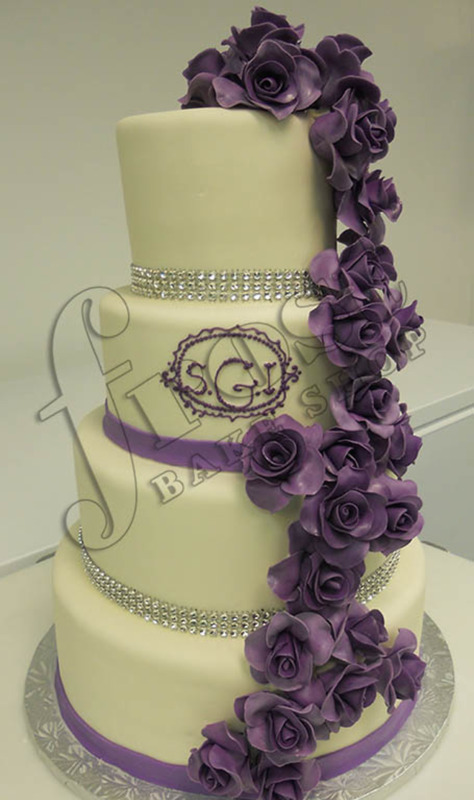 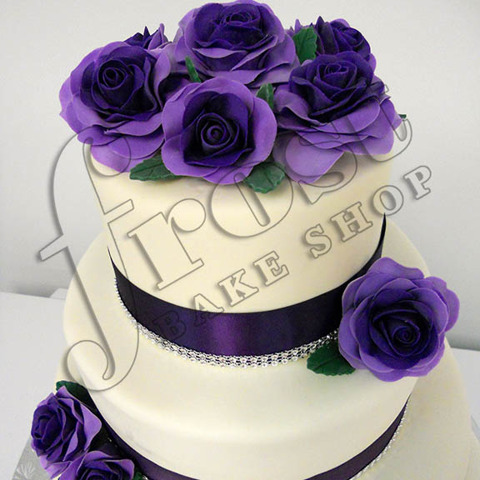 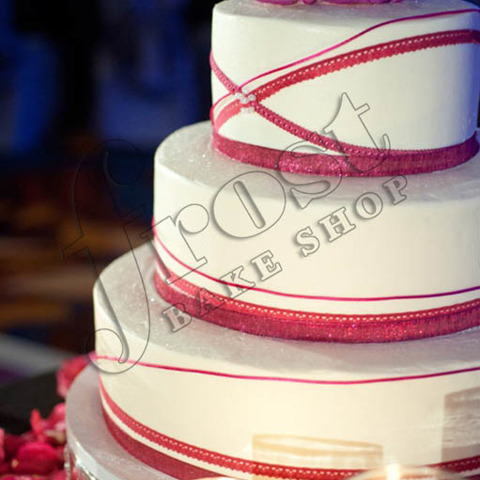 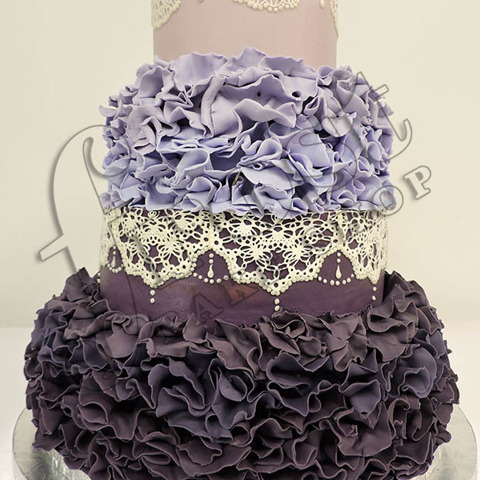 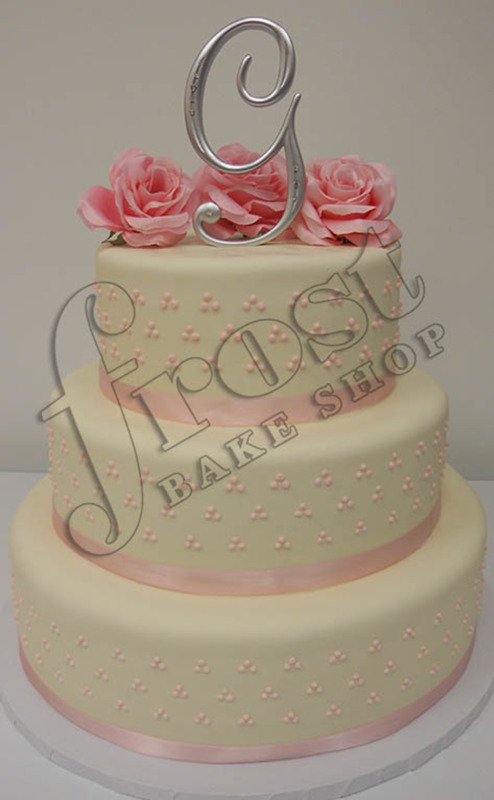 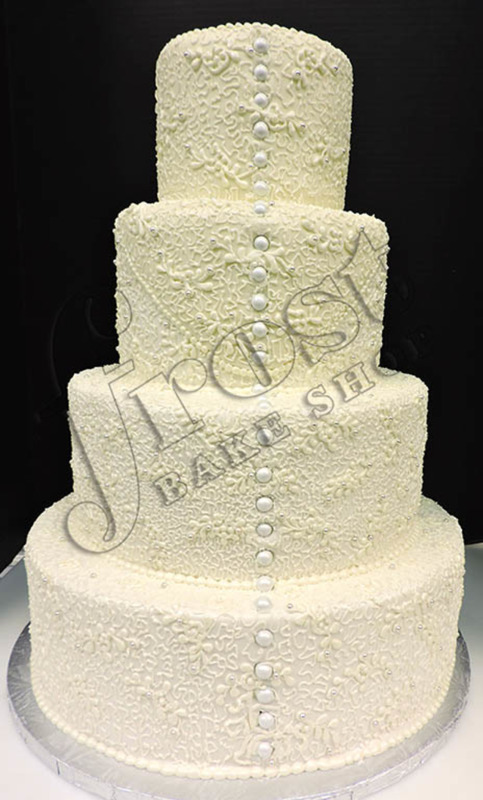 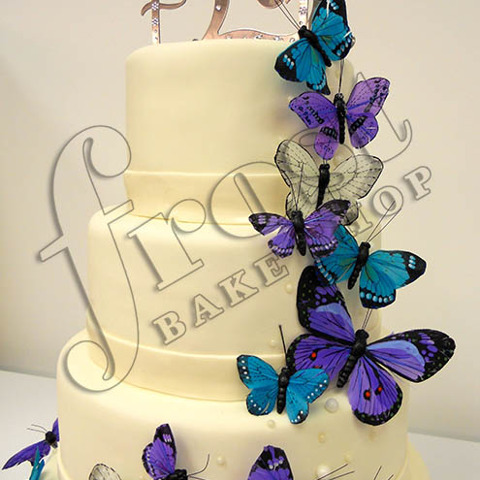 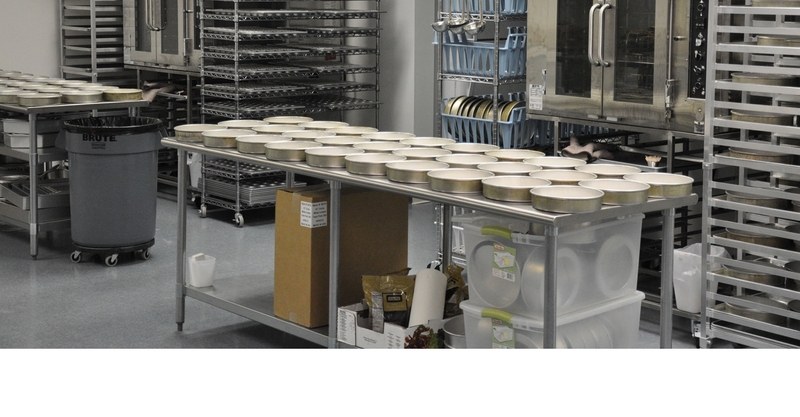 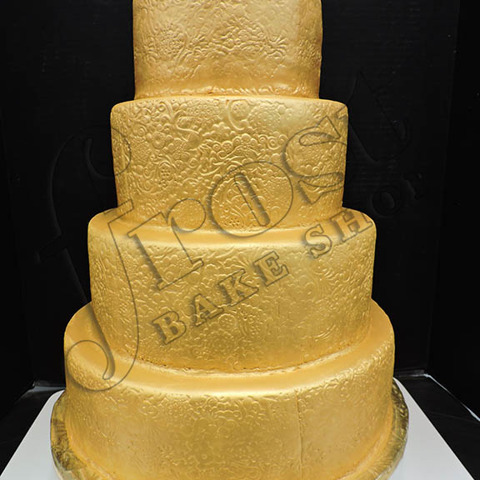 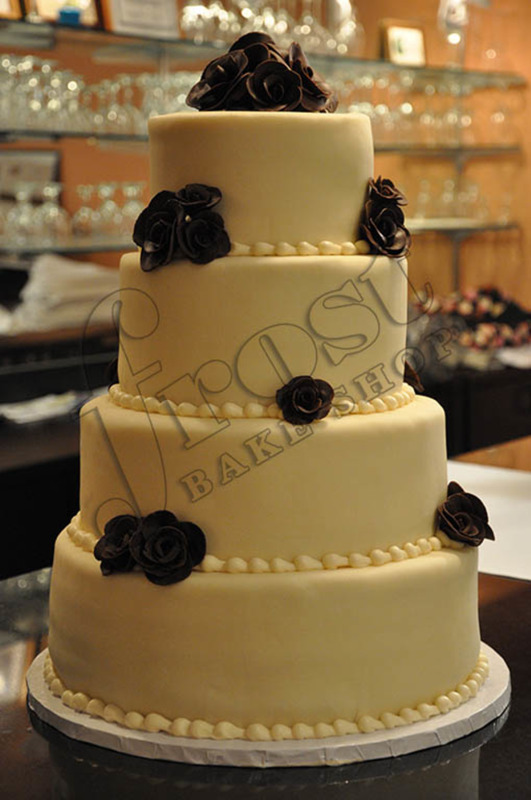 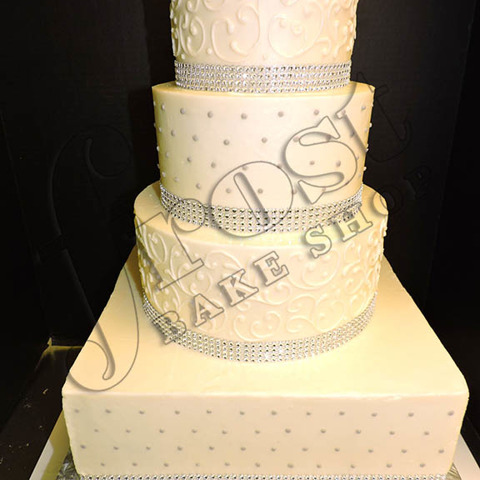 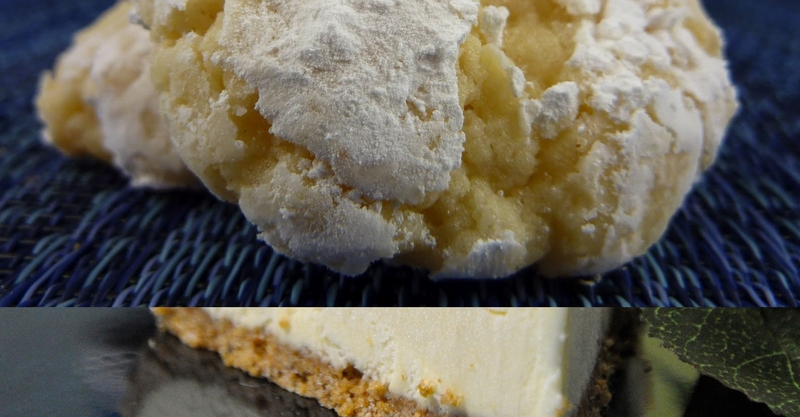 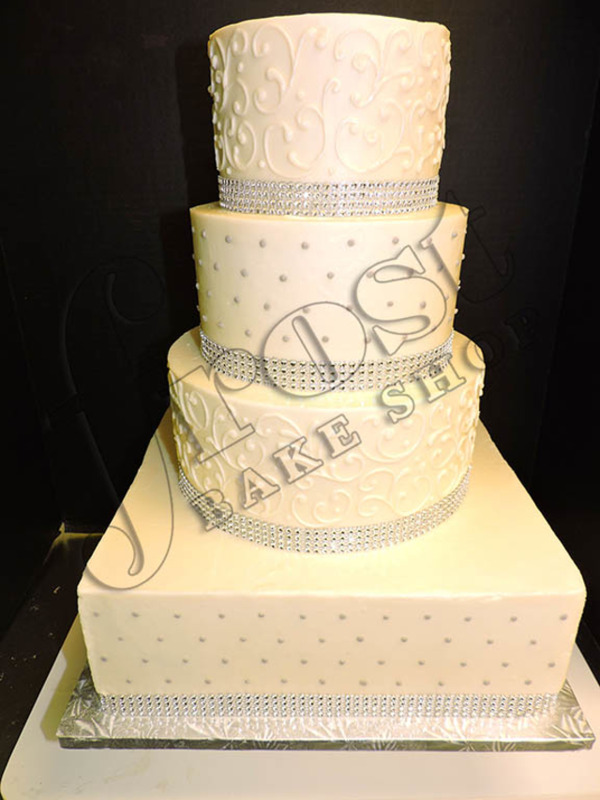 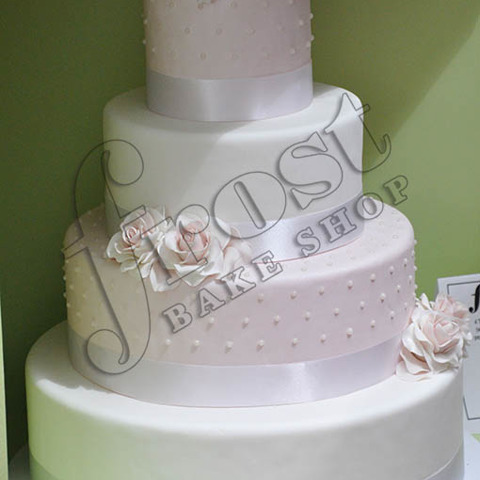 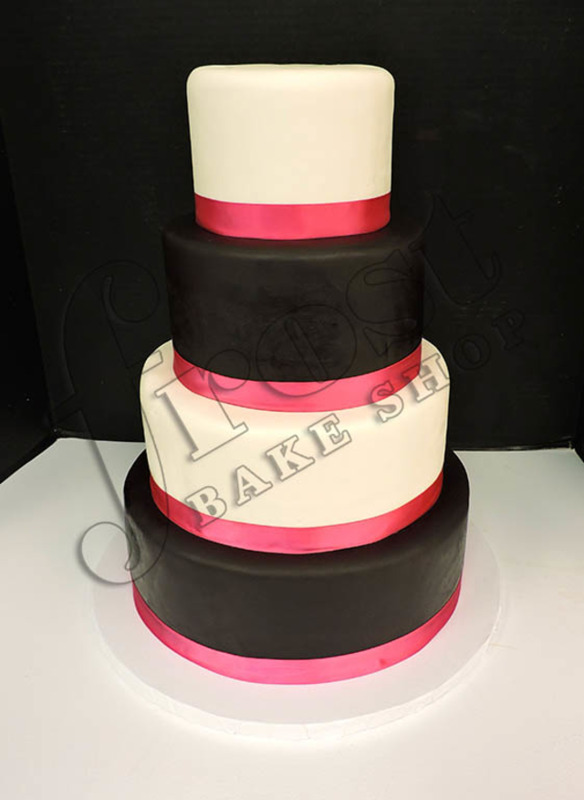 Our reputation, experience and methods enable us to create the perfect cake for you. 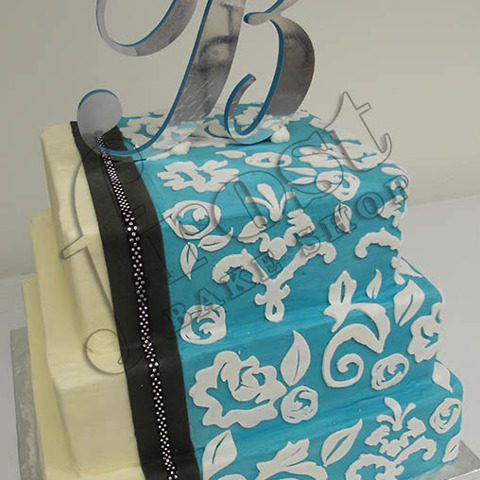 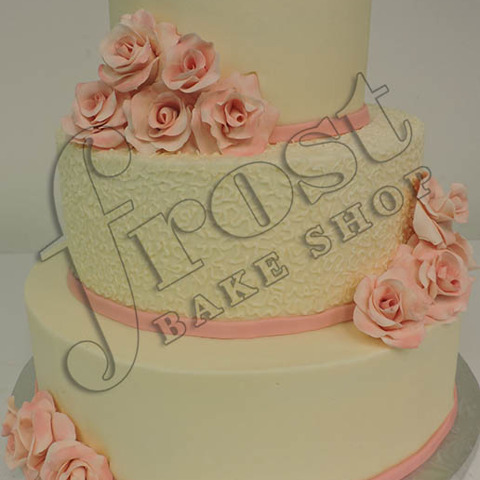 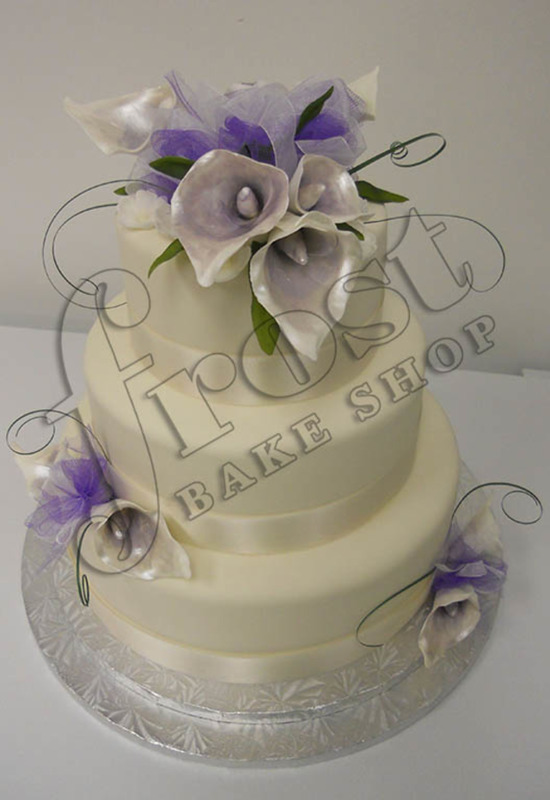 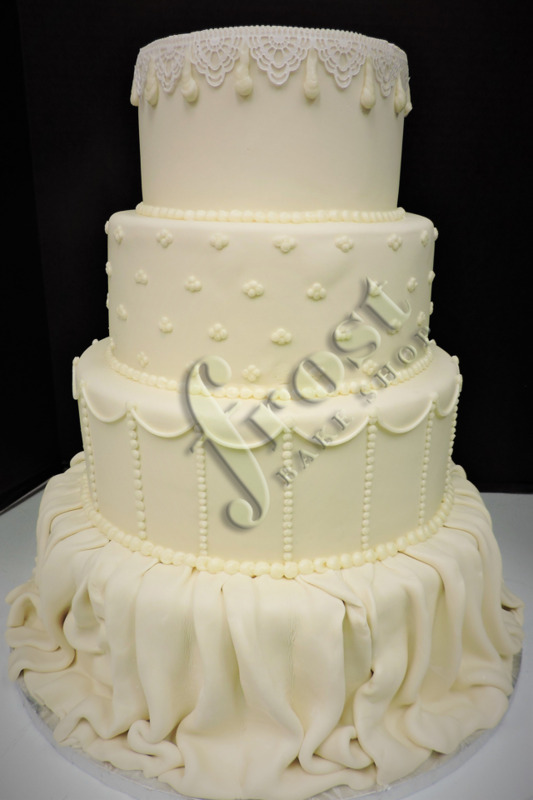 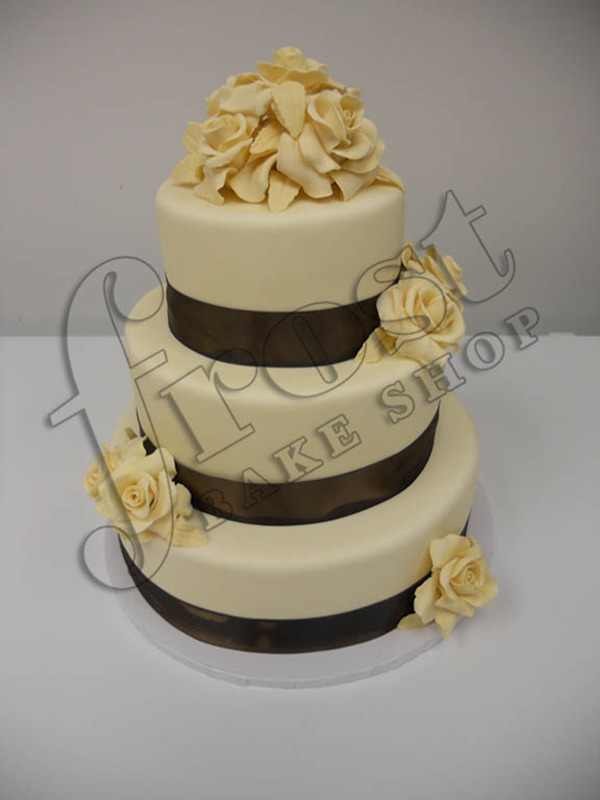 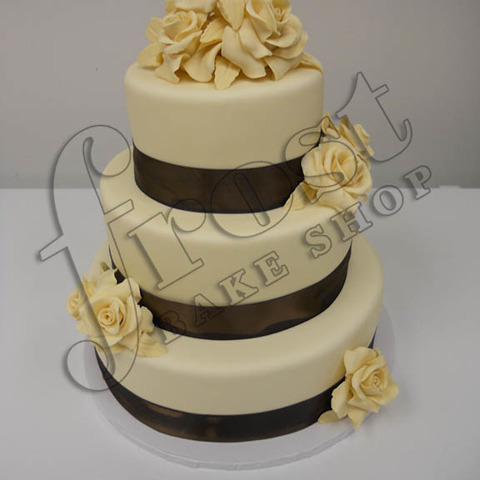 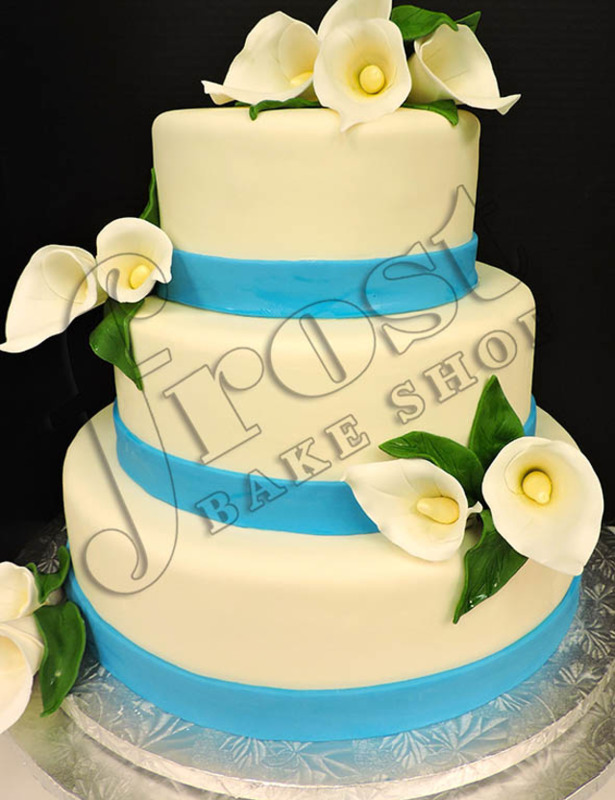 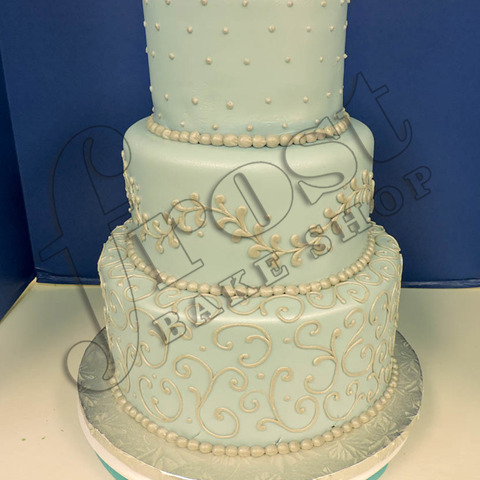 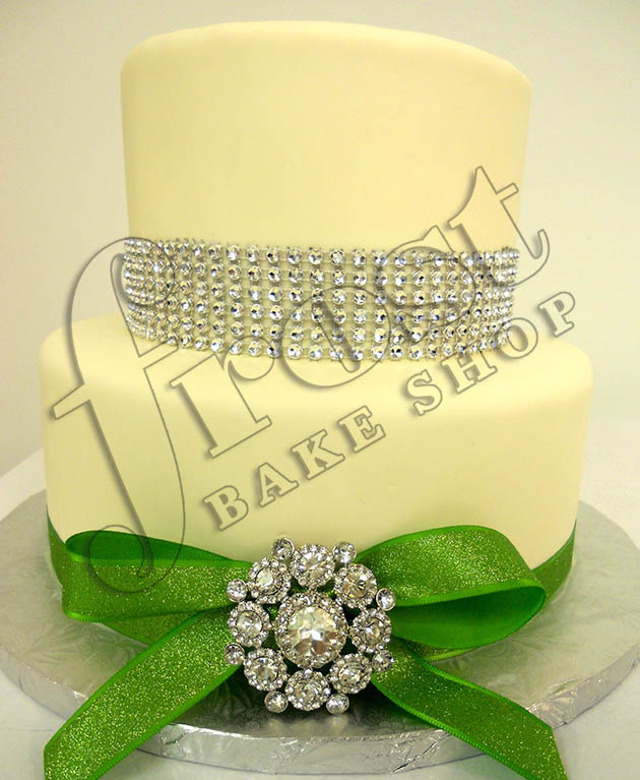 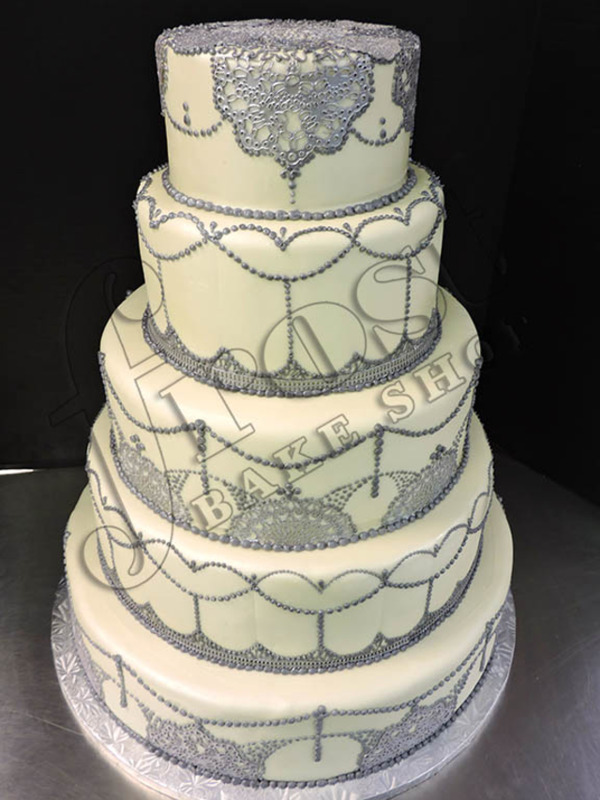 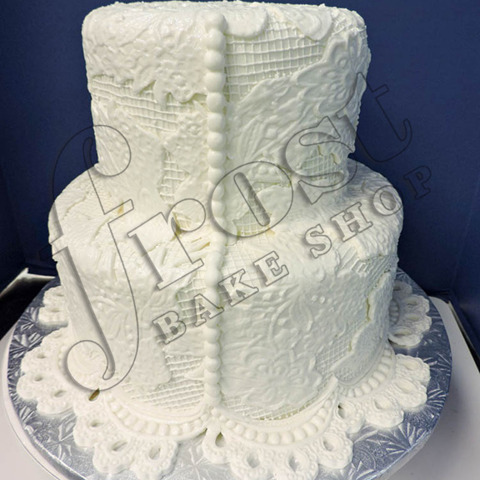 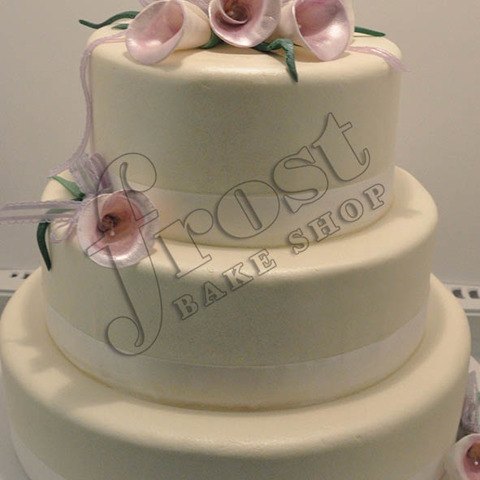 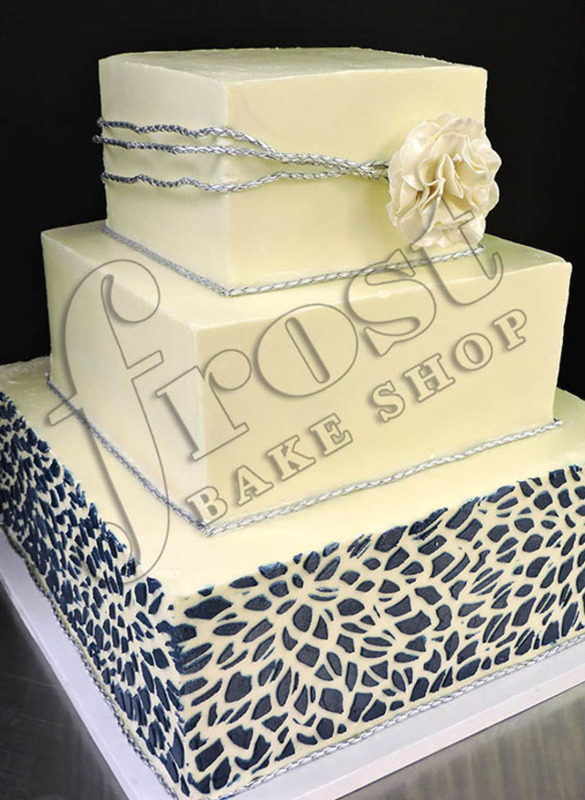 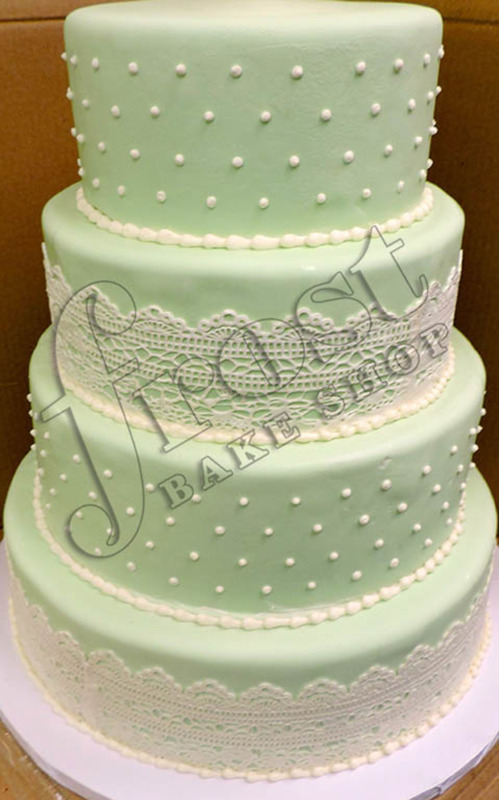 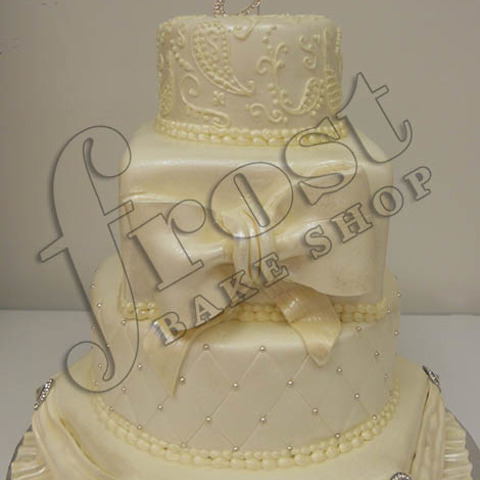 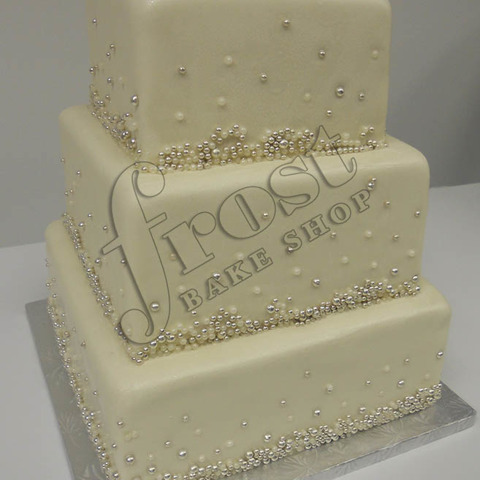 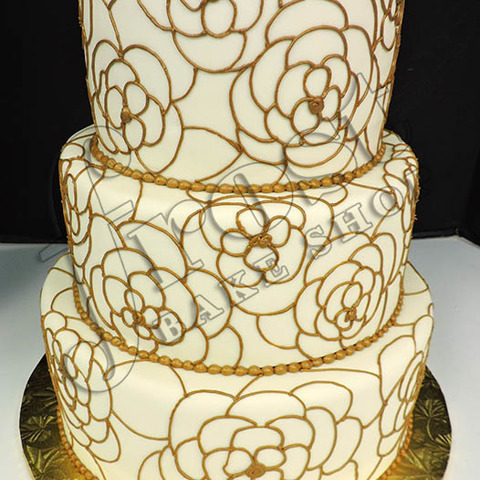 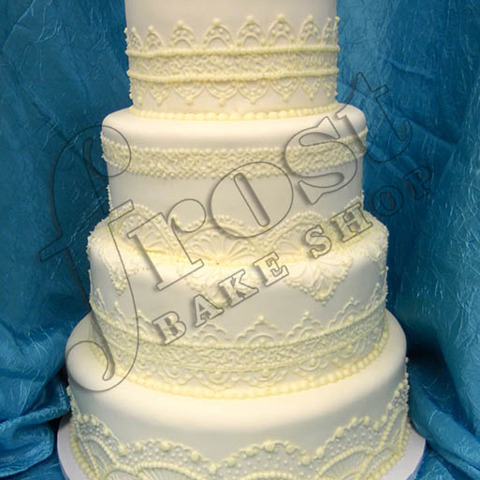 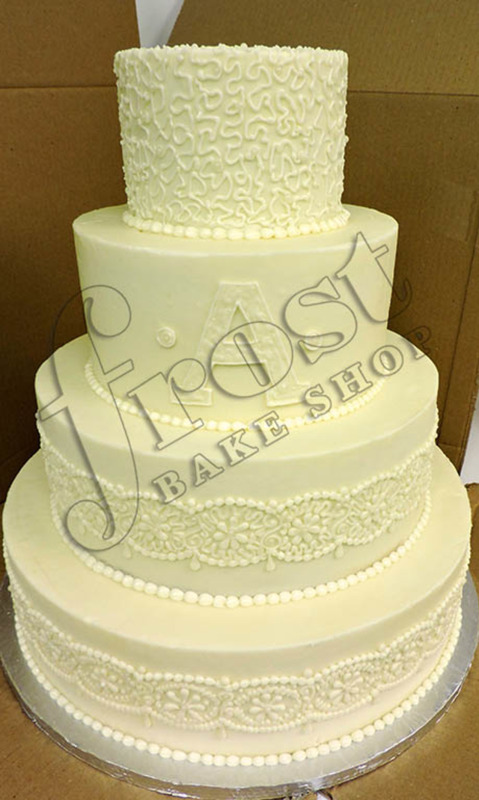 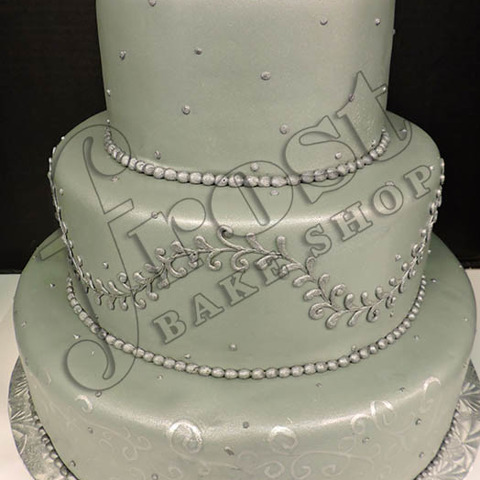 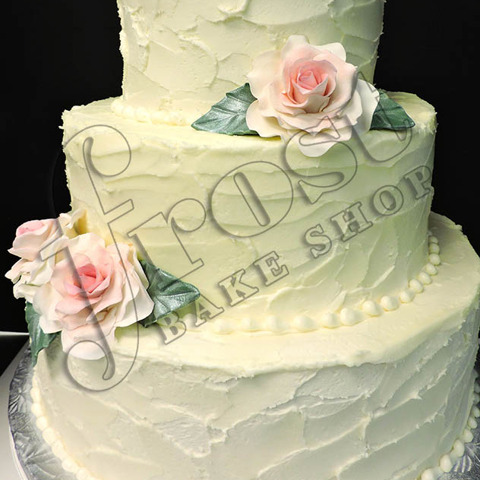 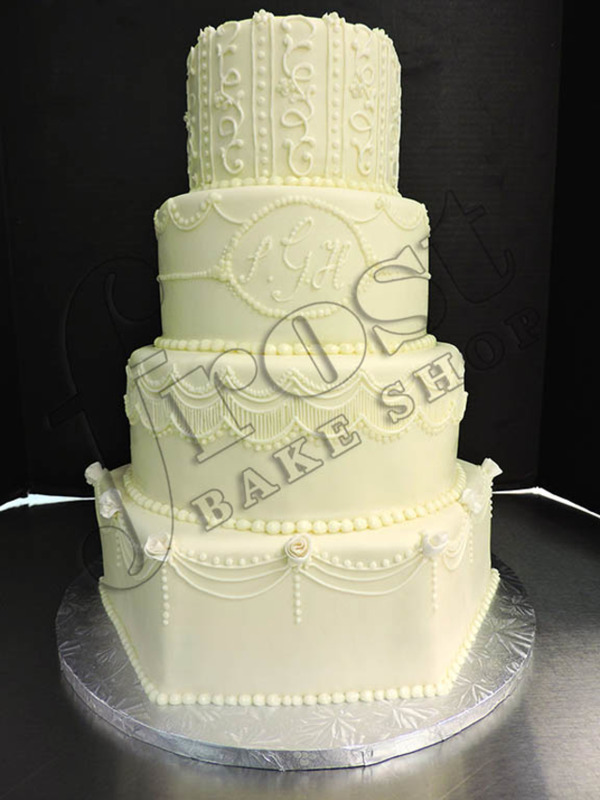 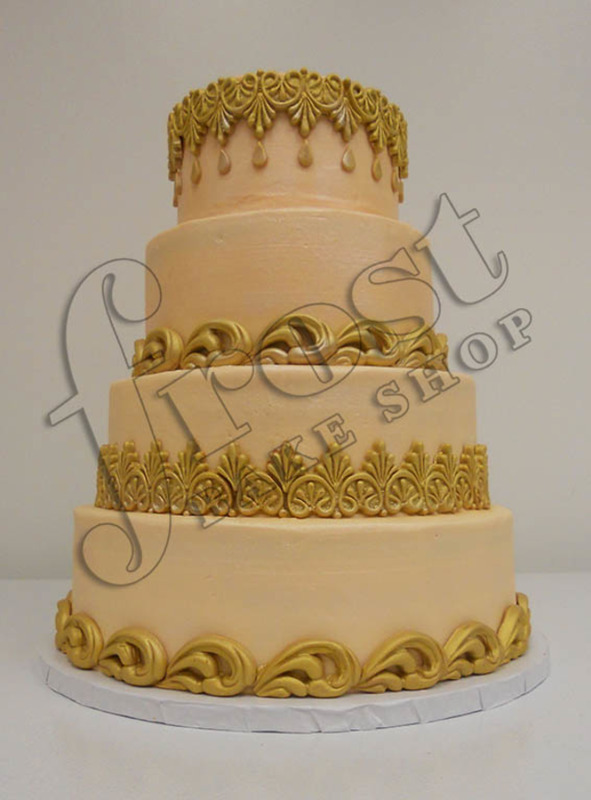 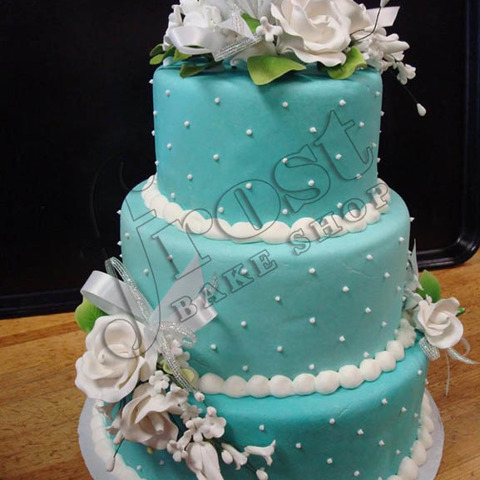 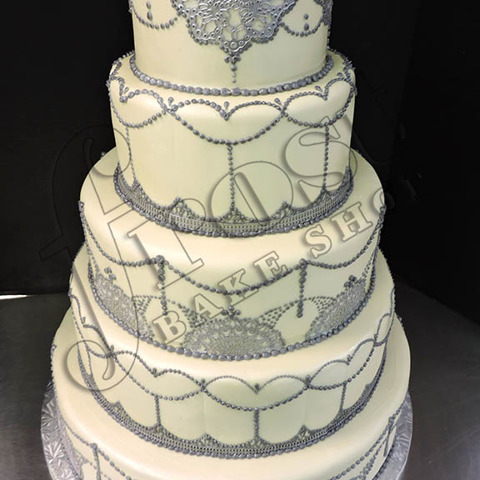 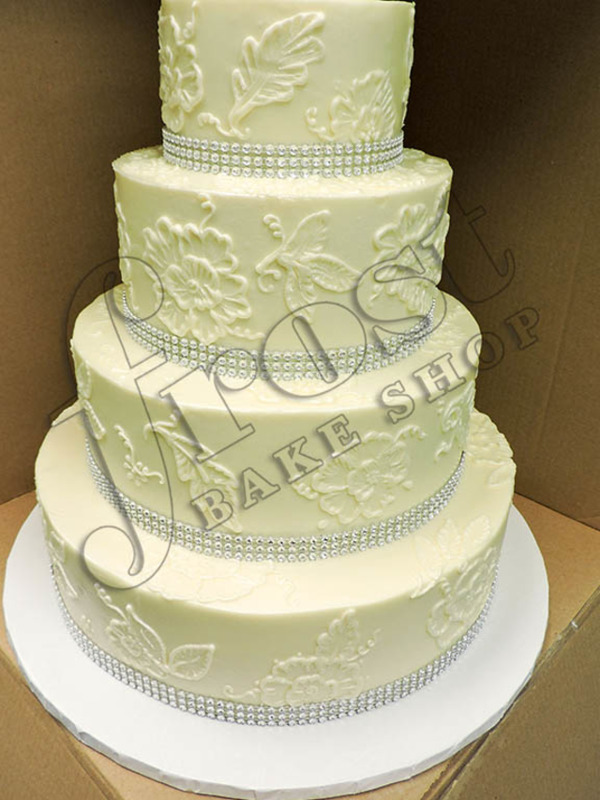 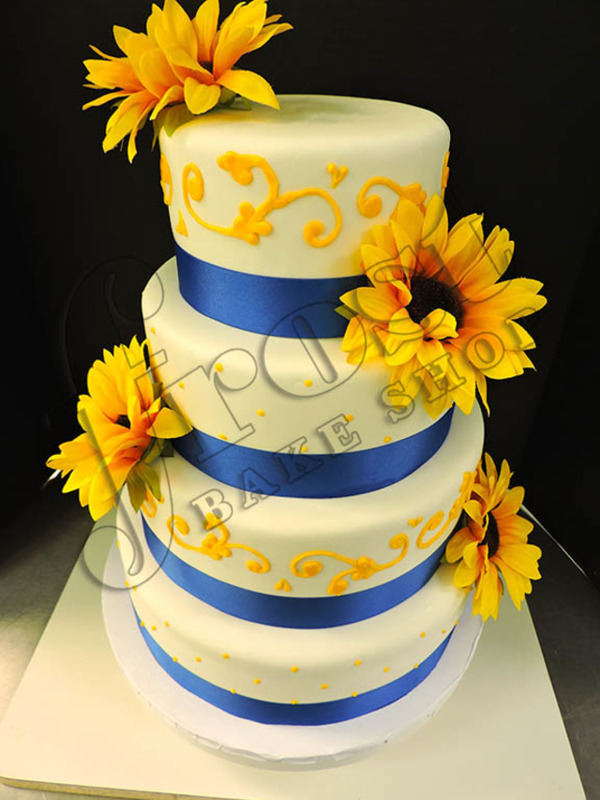 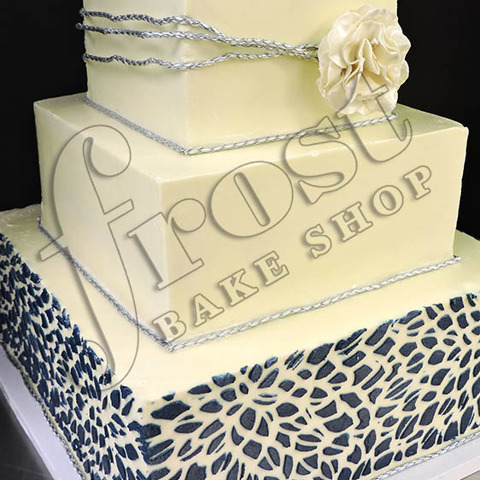 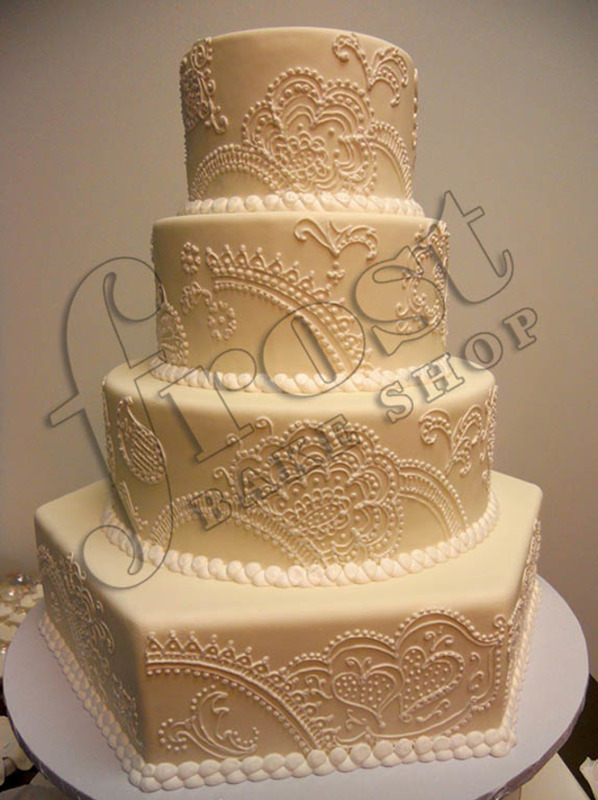 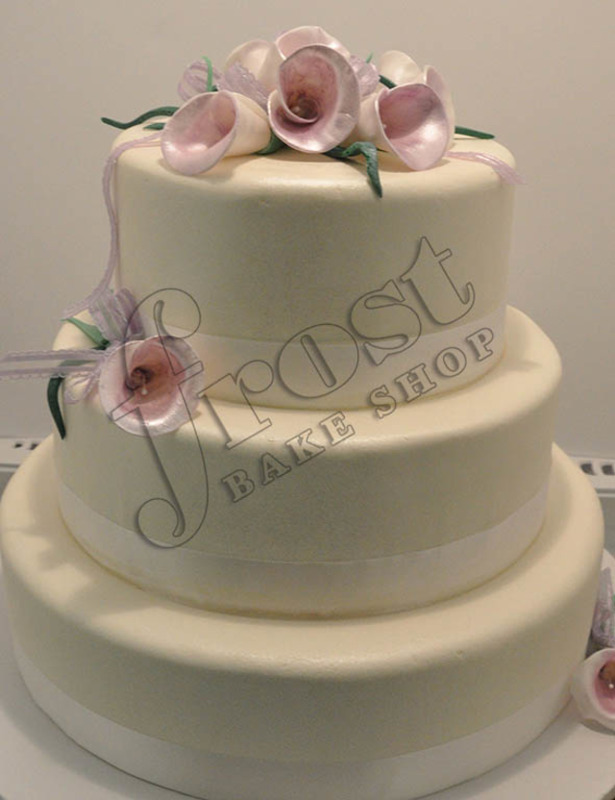 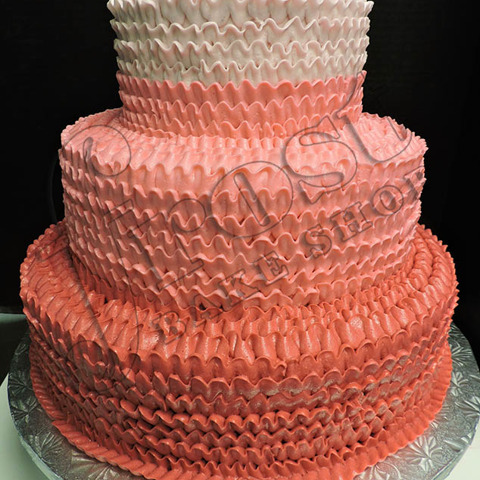 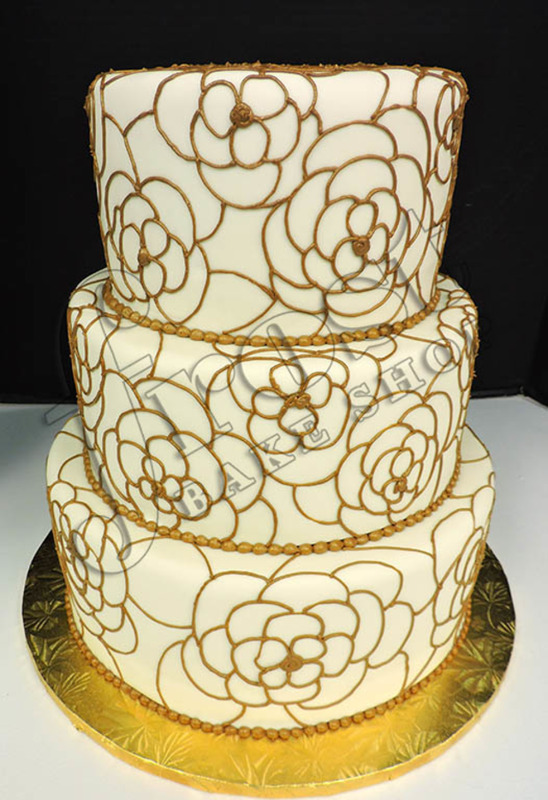 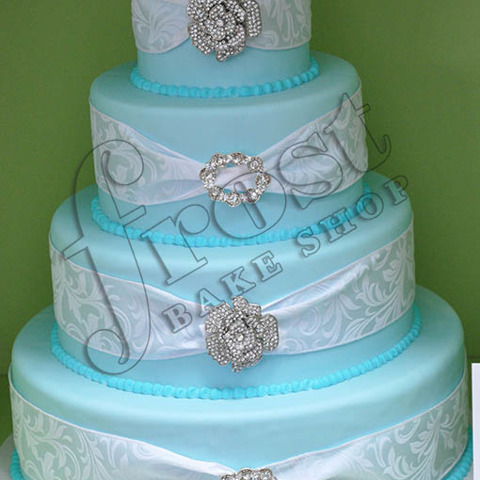 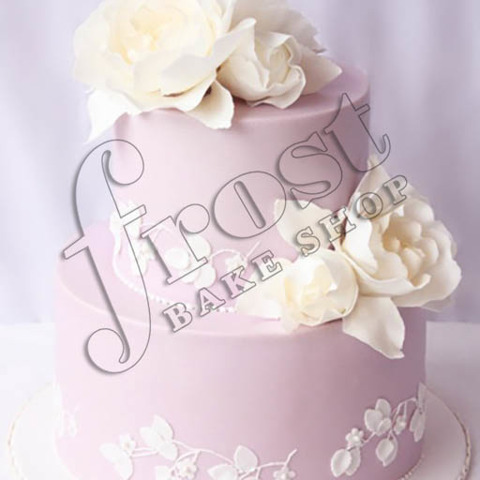 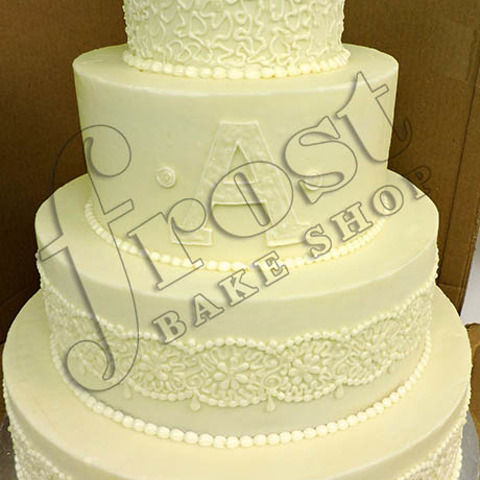 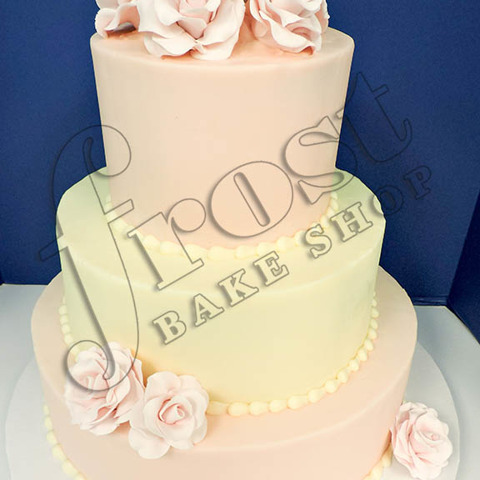 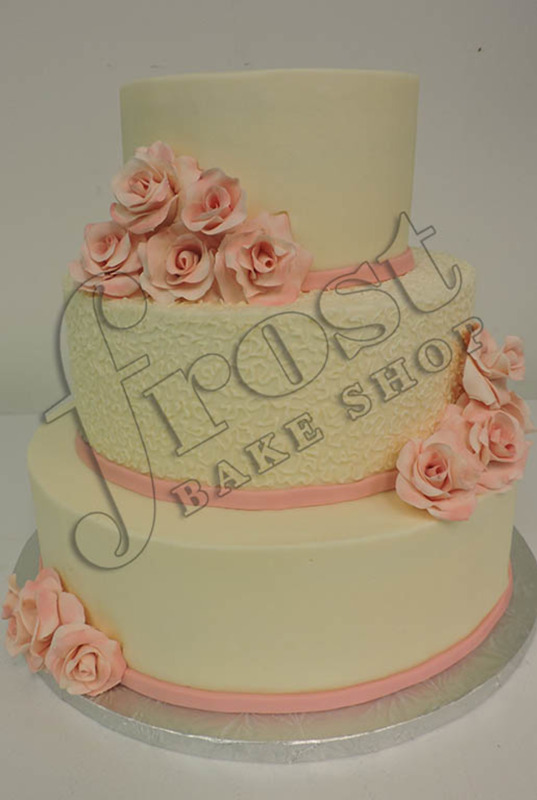 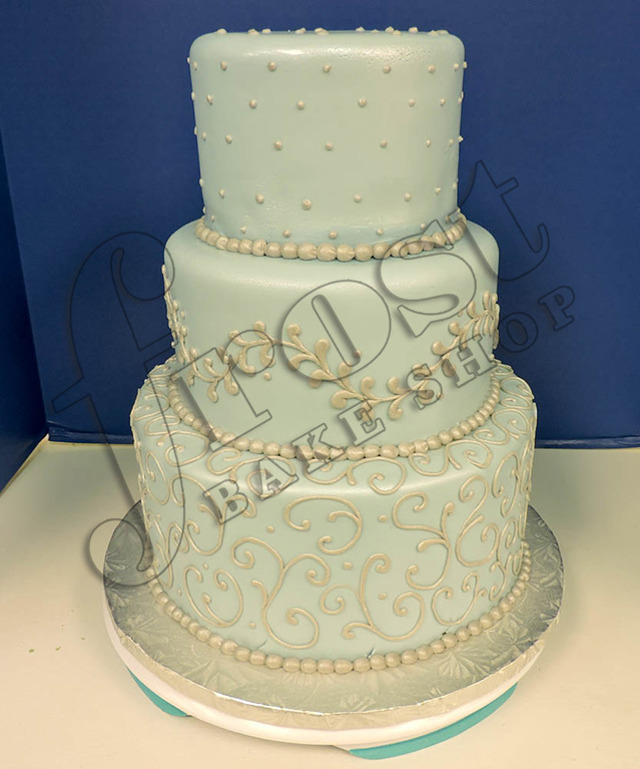 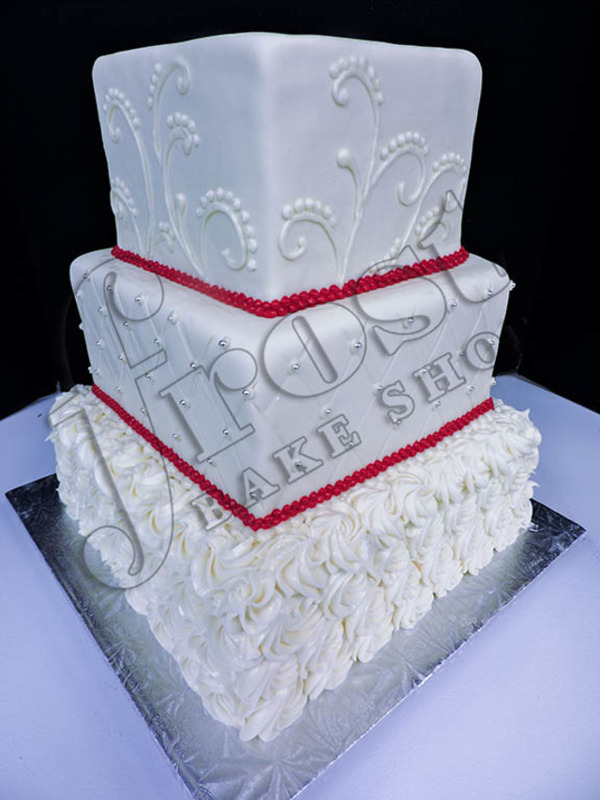 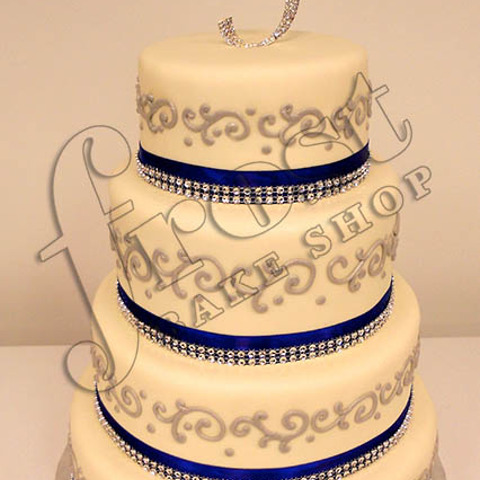 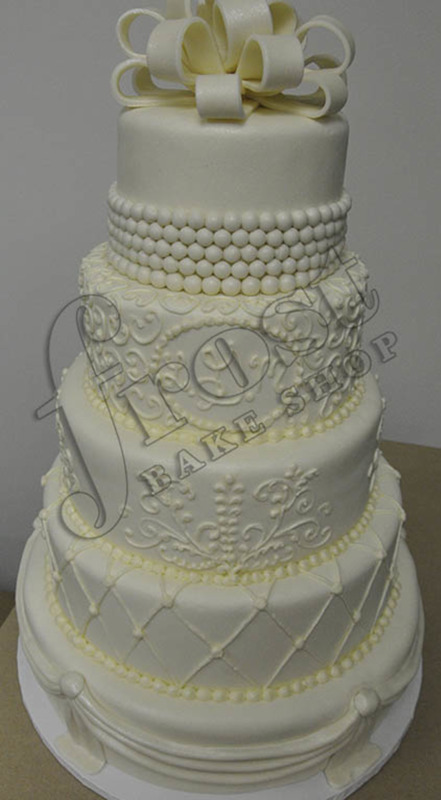 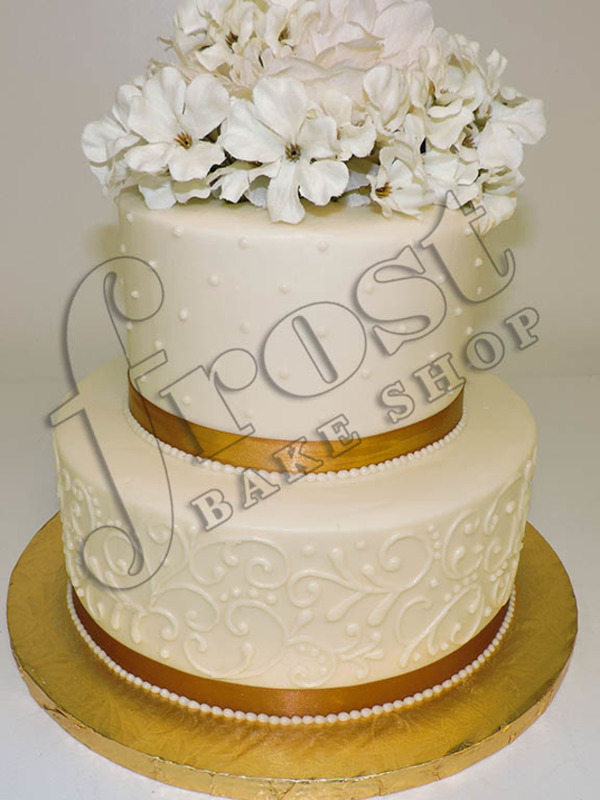 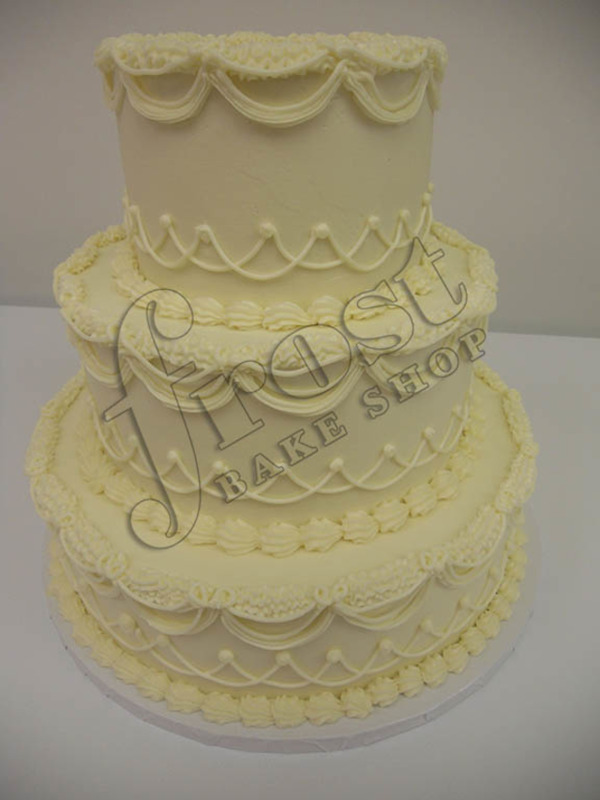 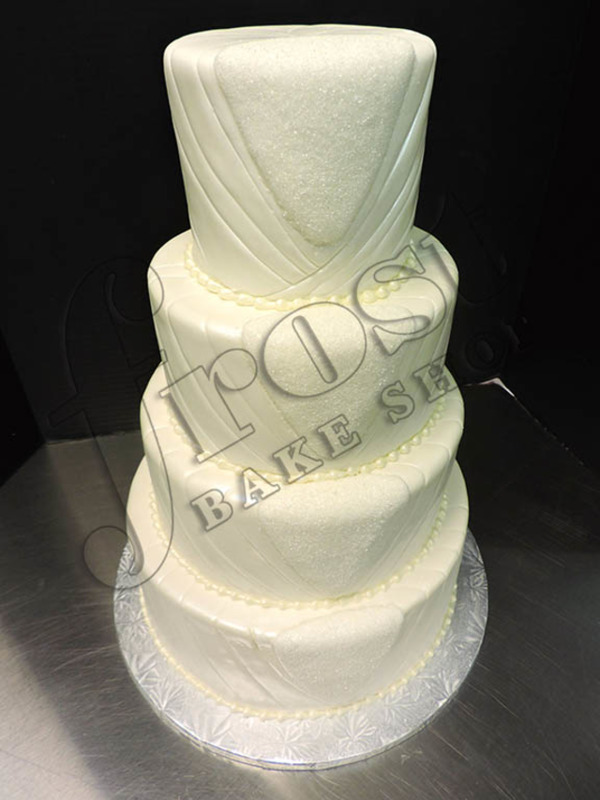 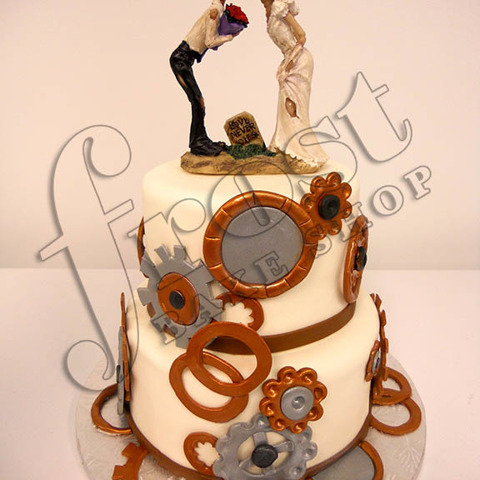 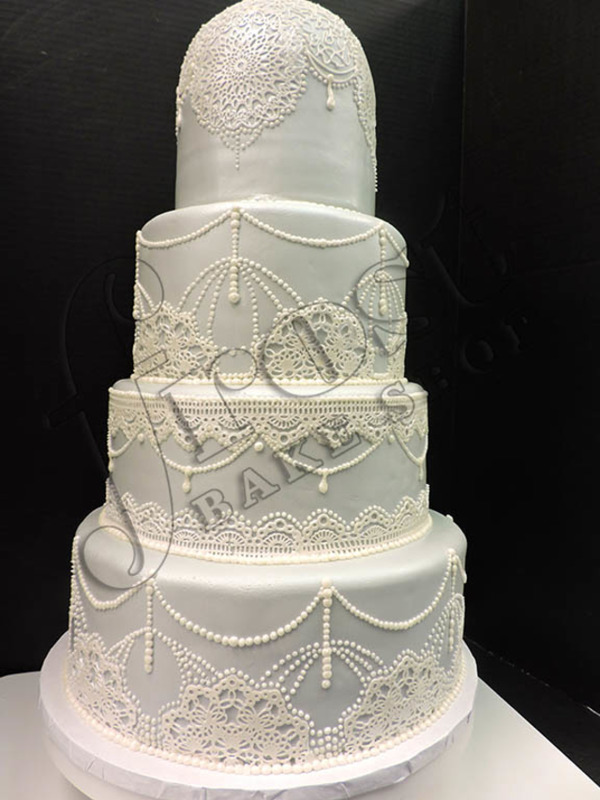 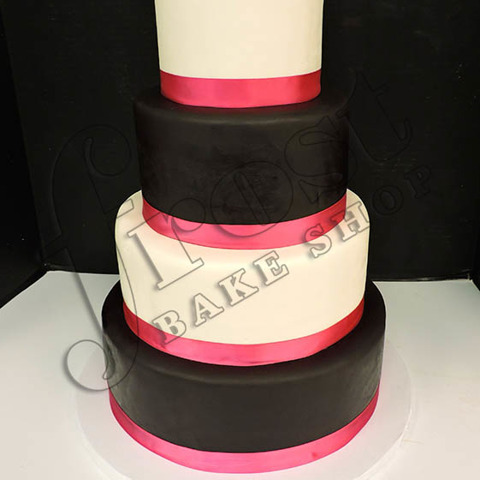 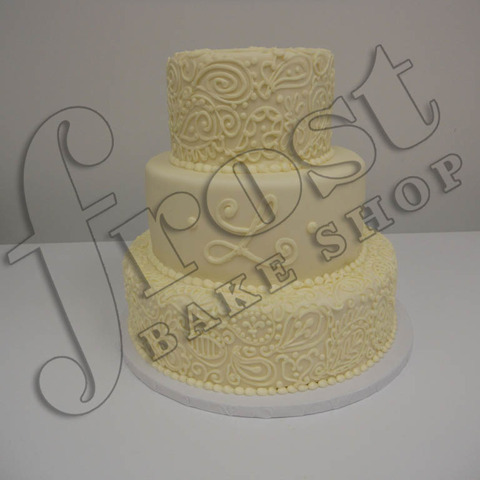 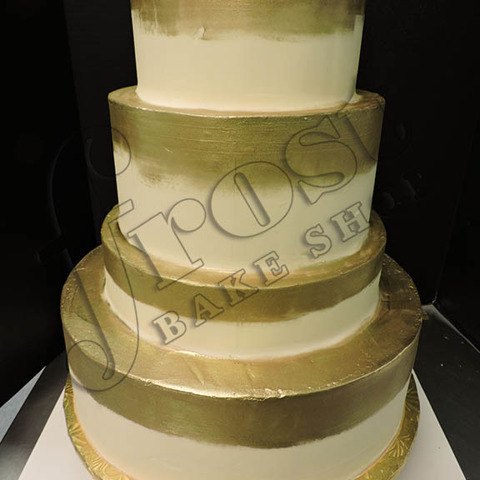 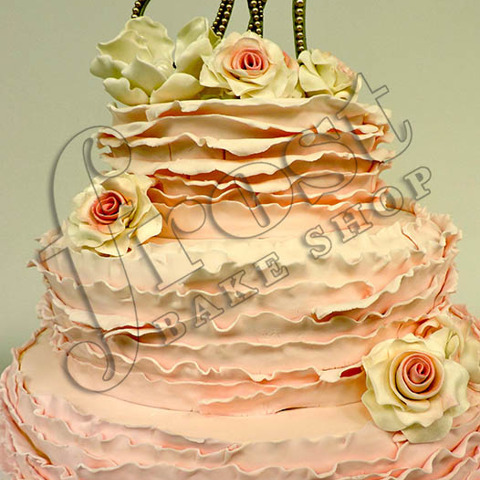 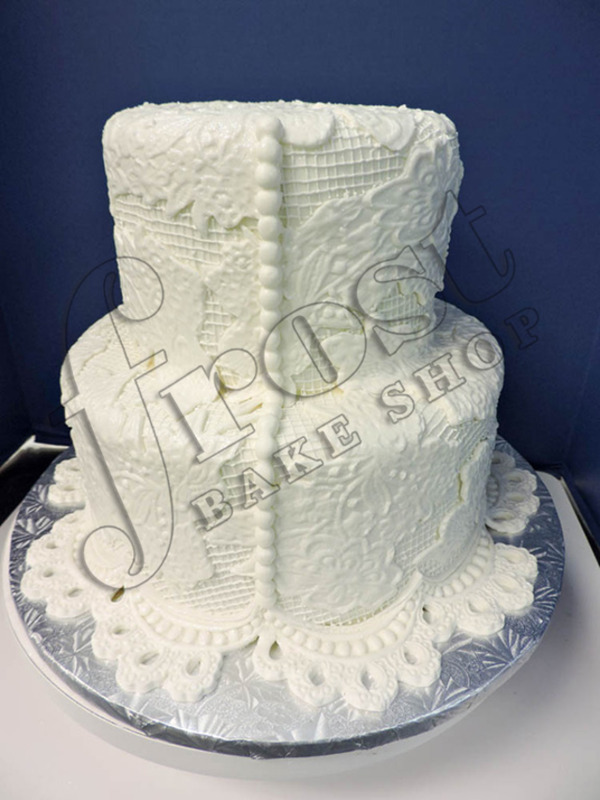 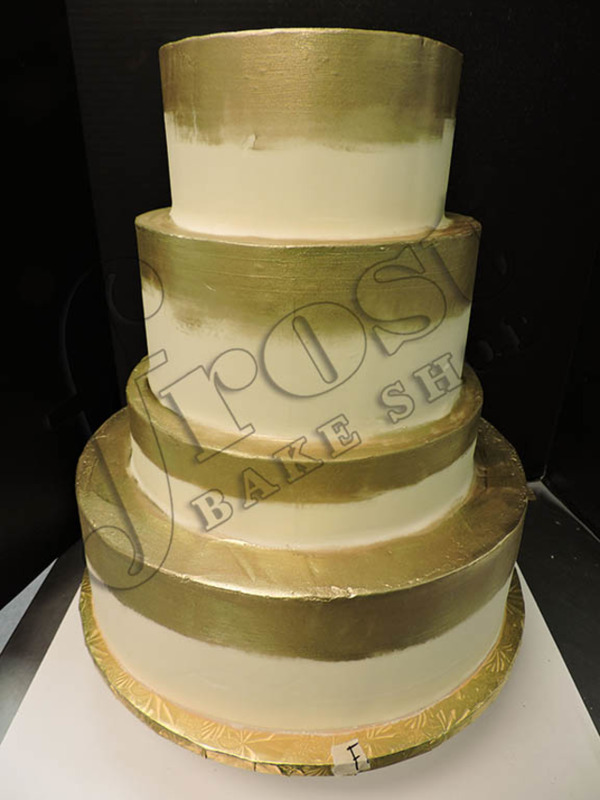 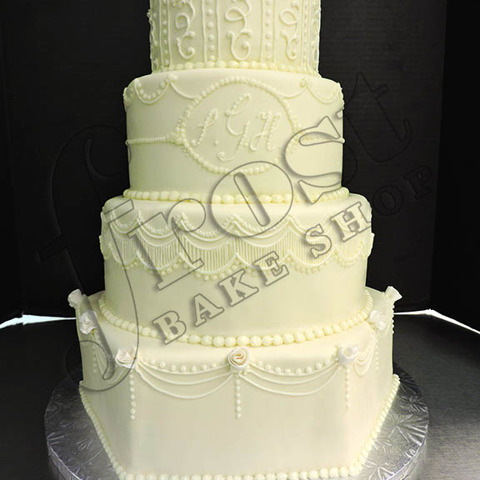 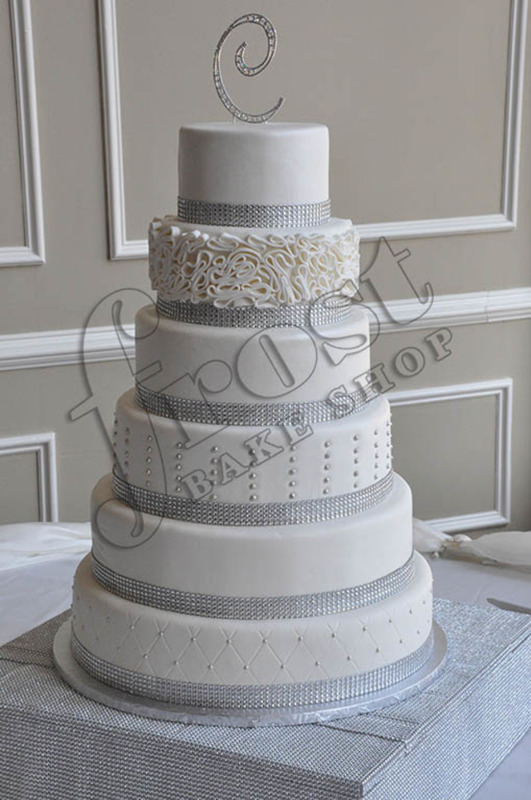 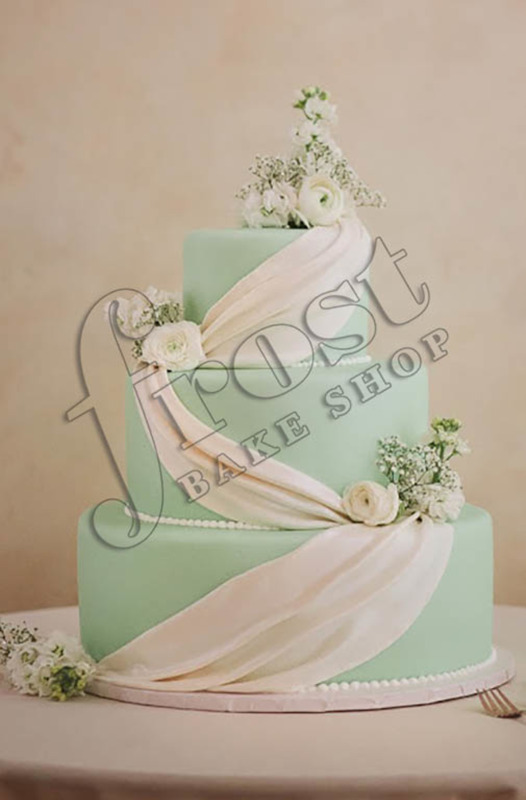 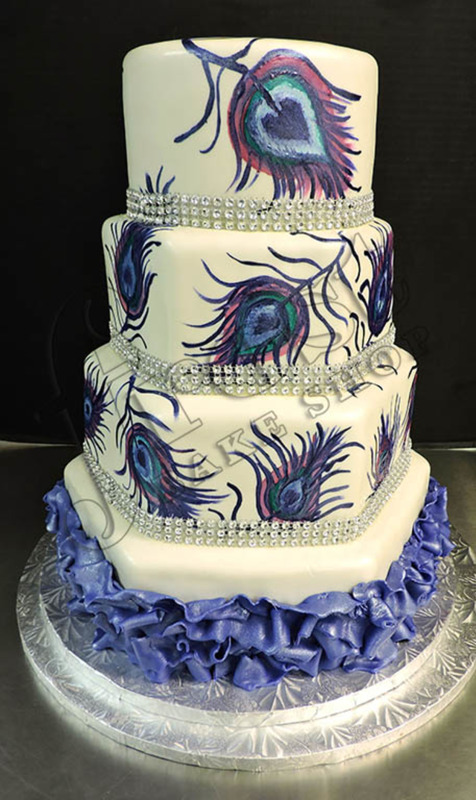 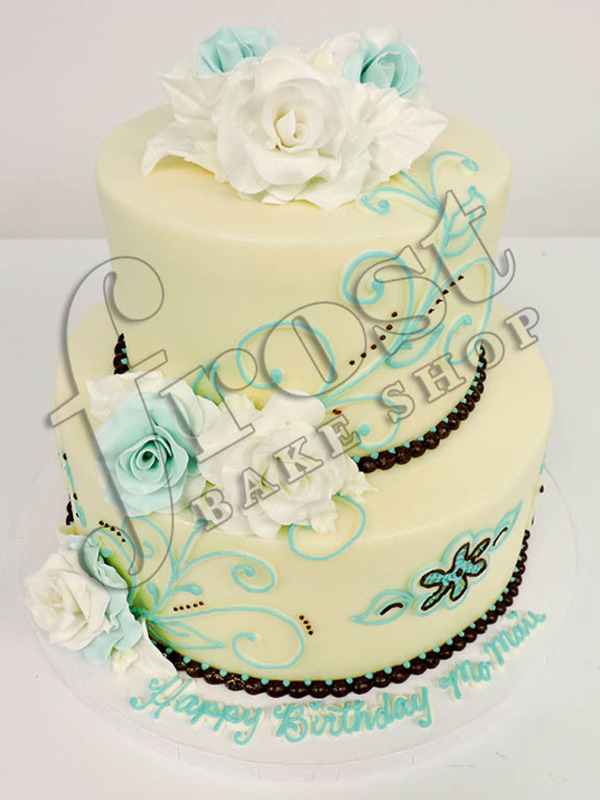 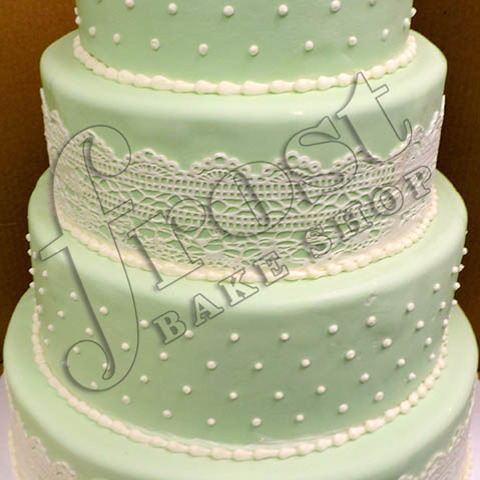 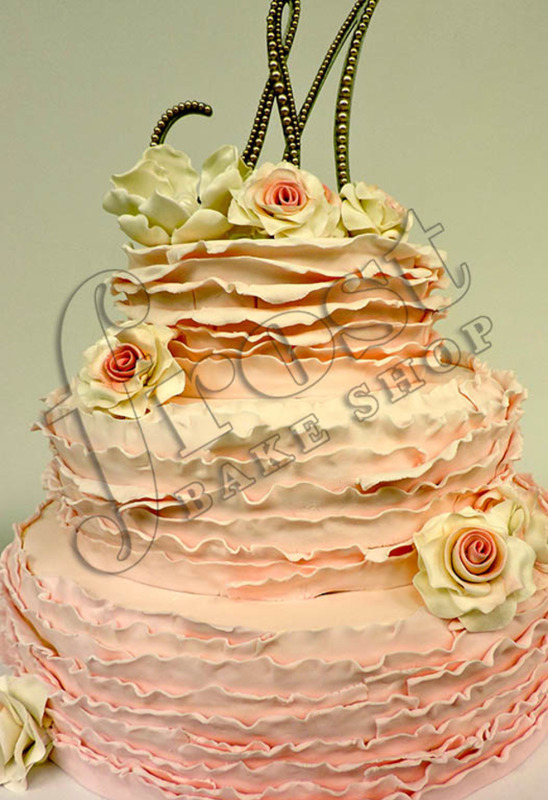 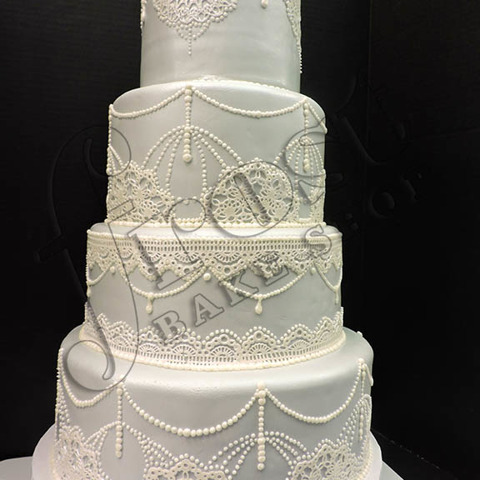 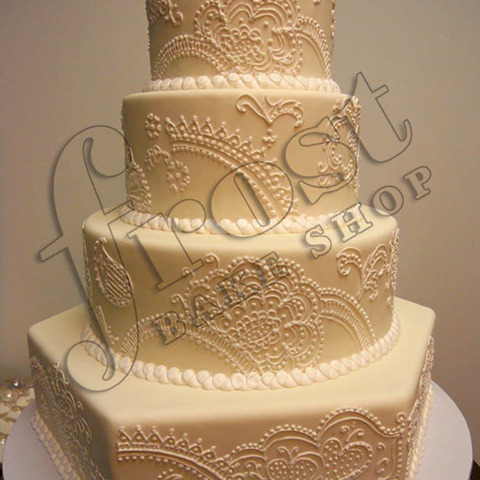 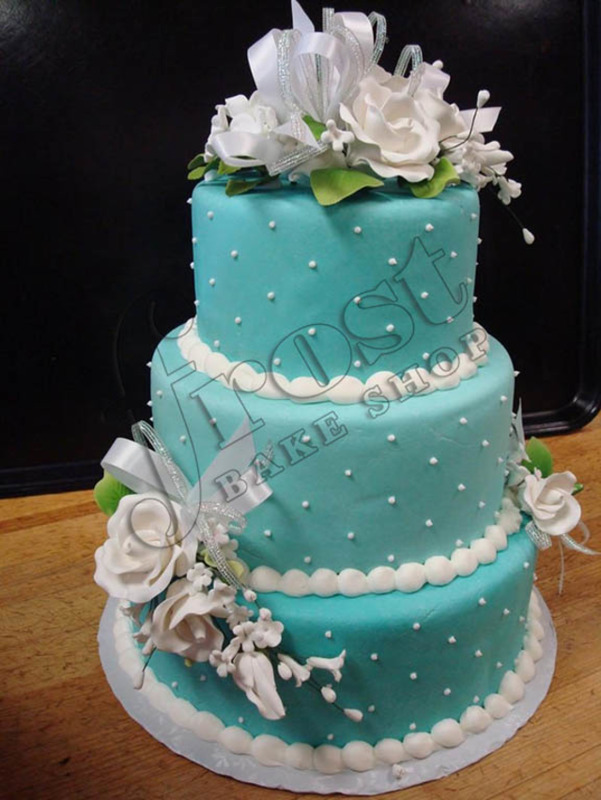 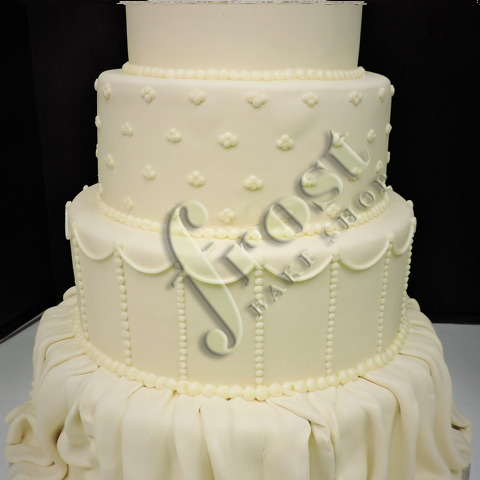 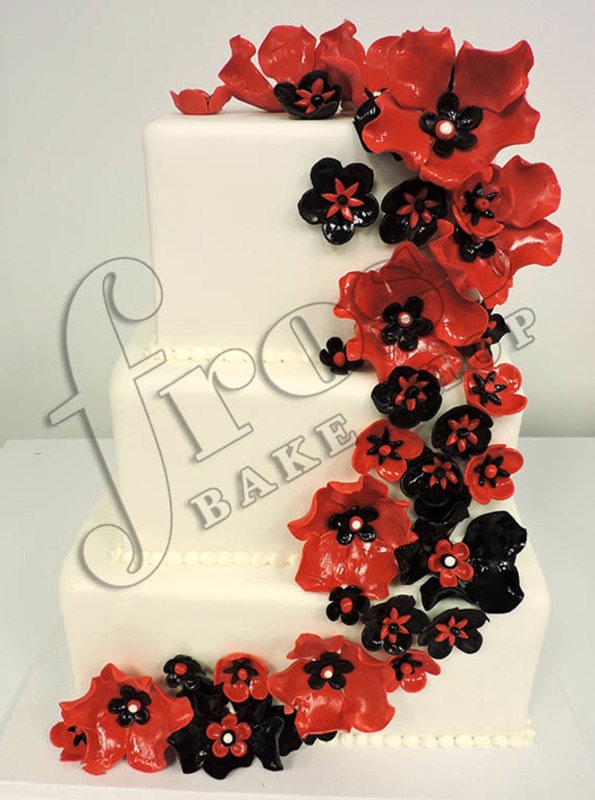 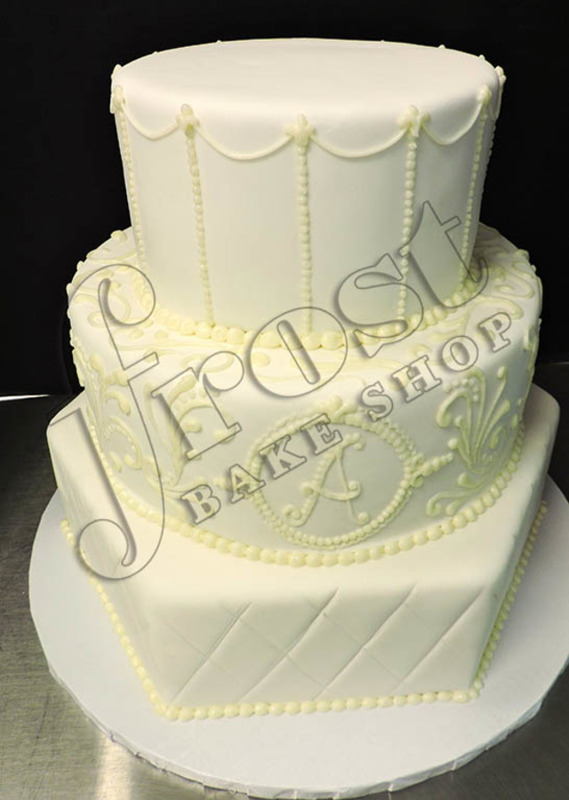 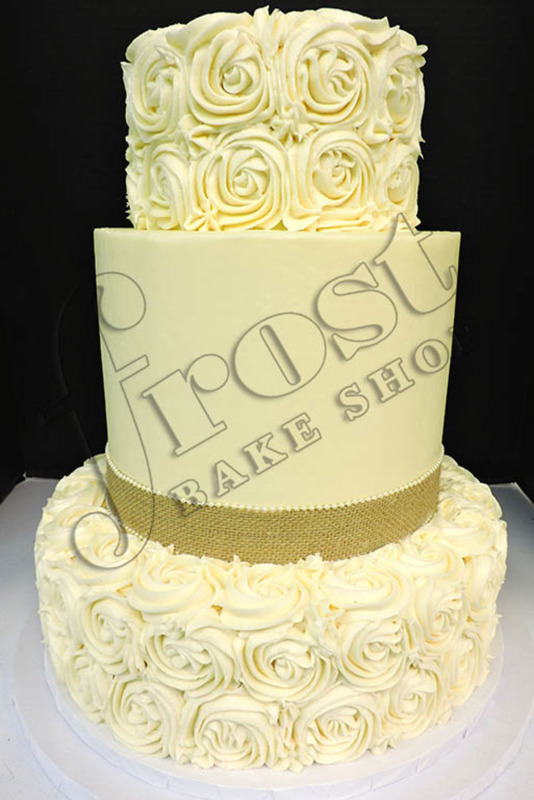 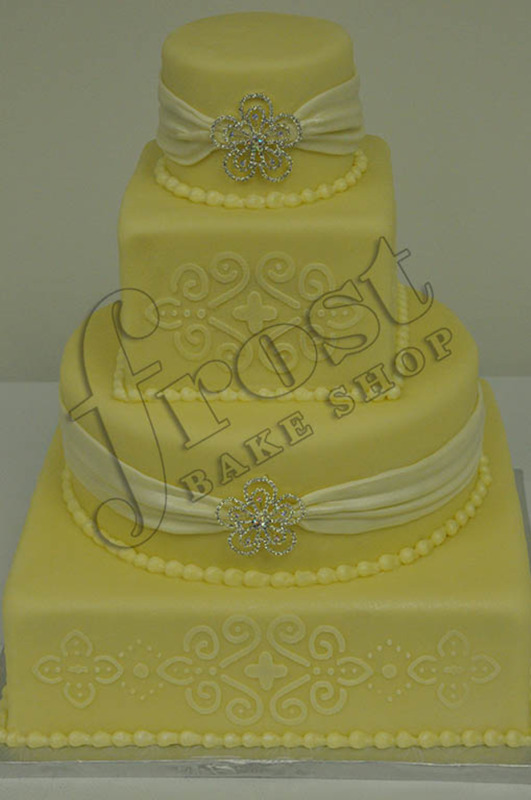 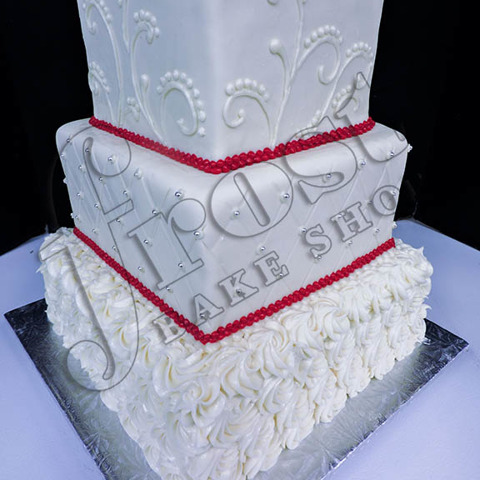 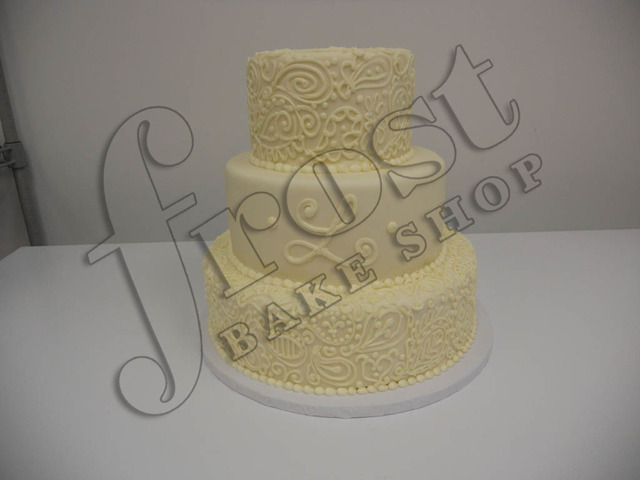 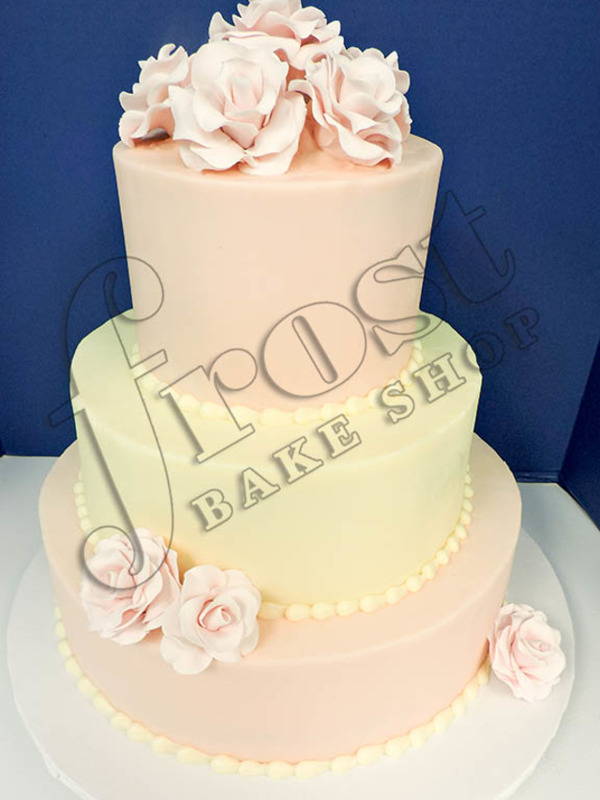 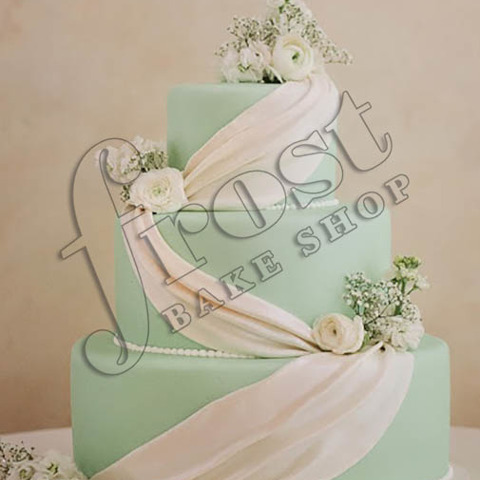 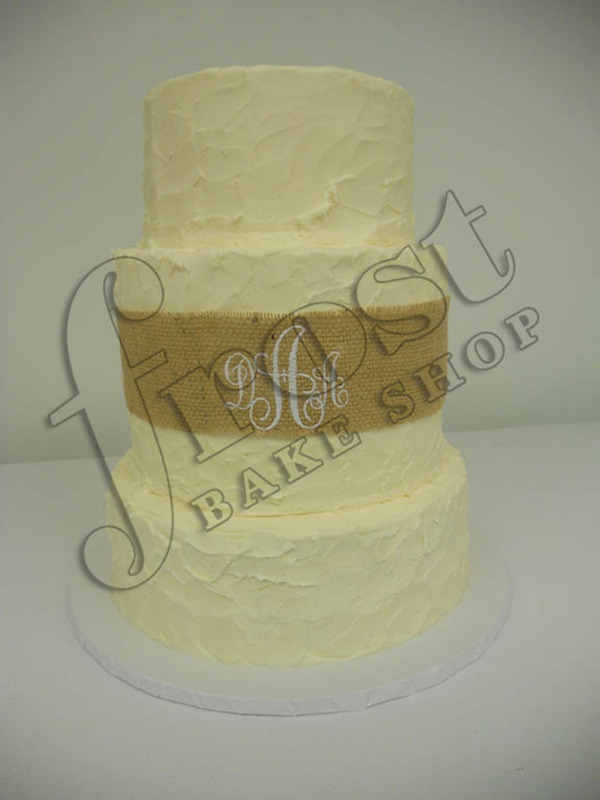 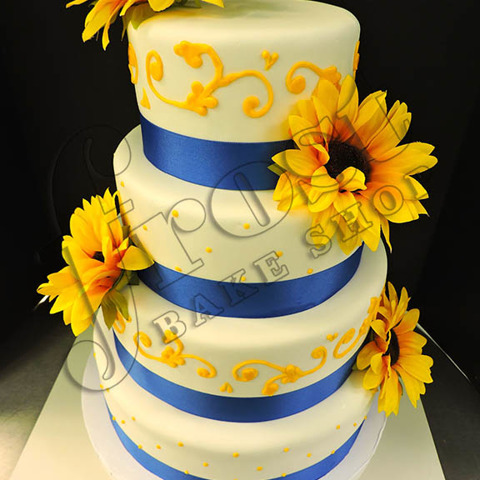 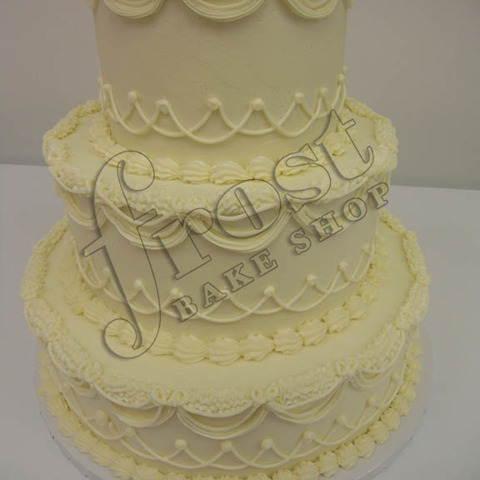 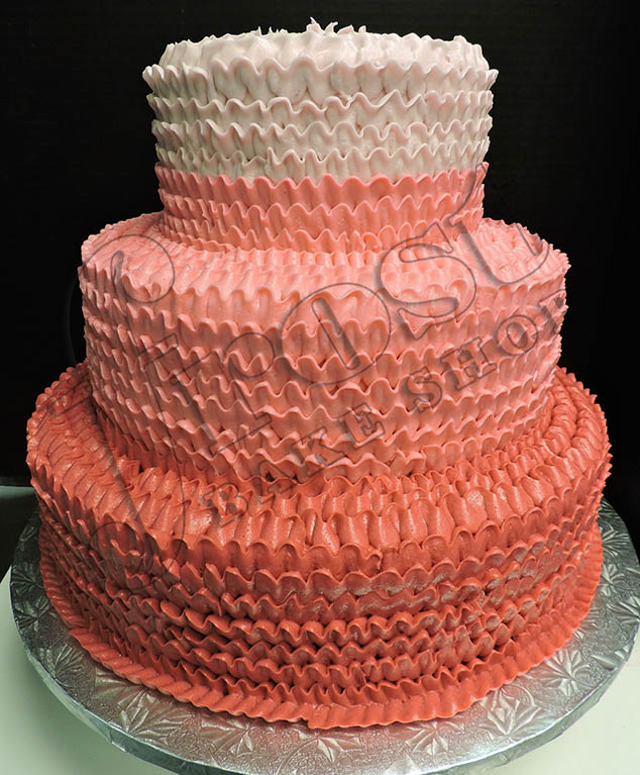 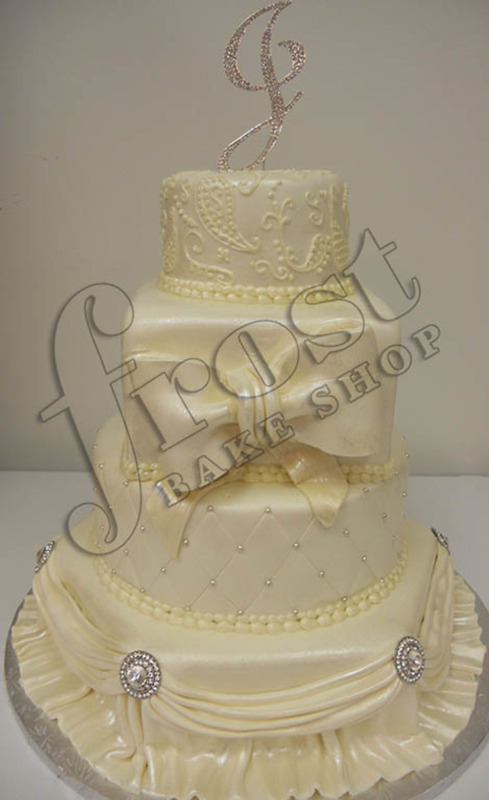 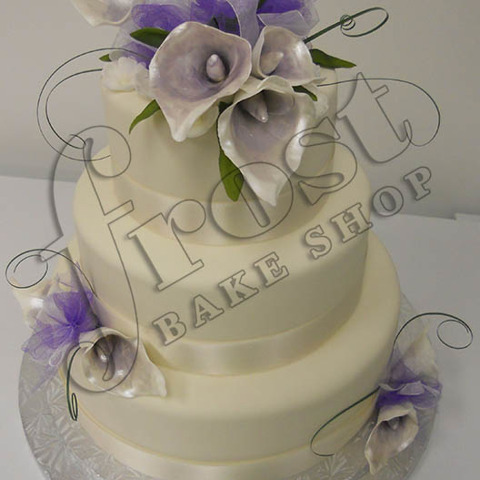 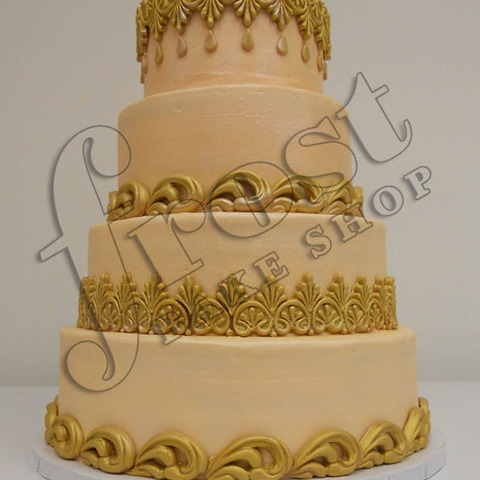 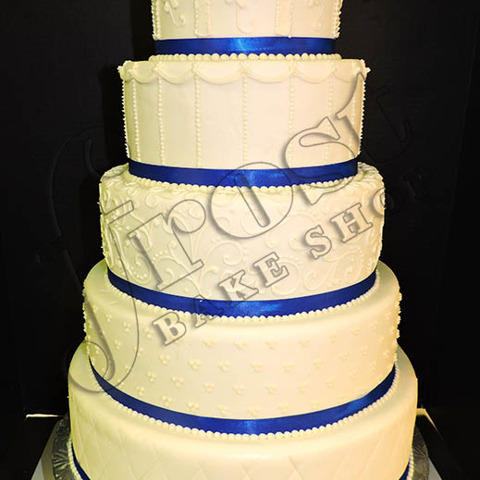 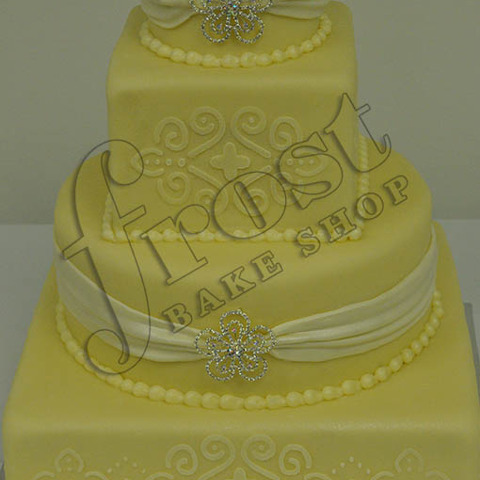 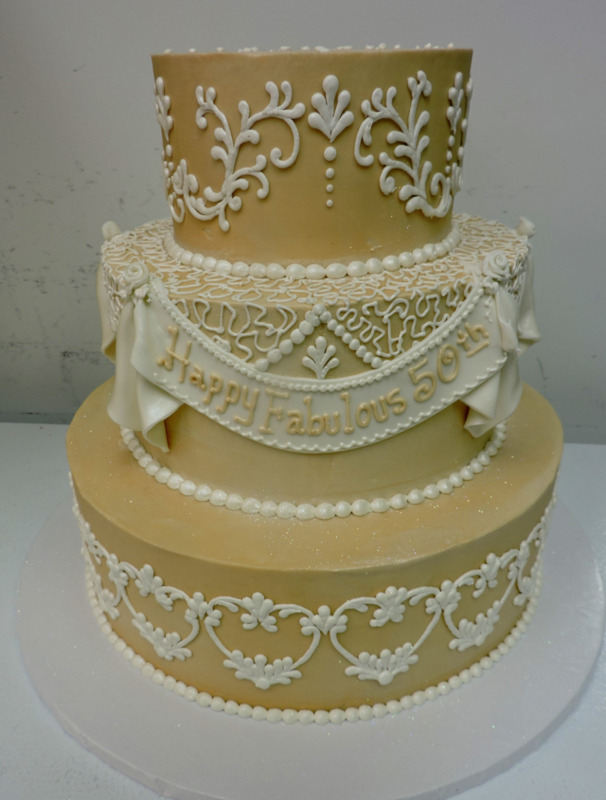 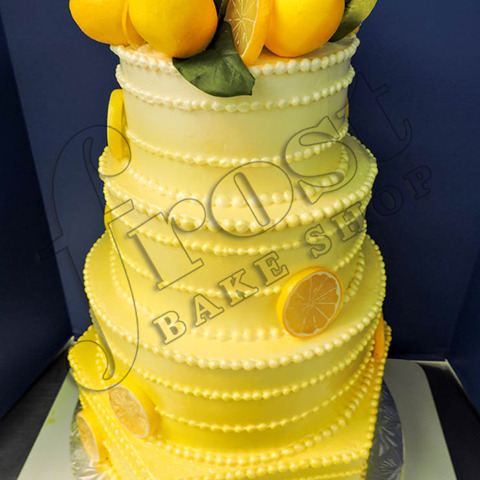 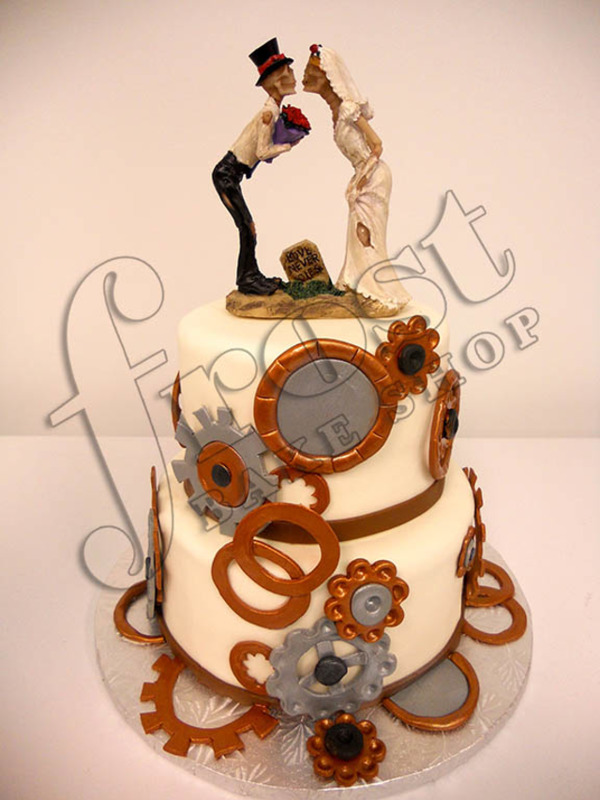 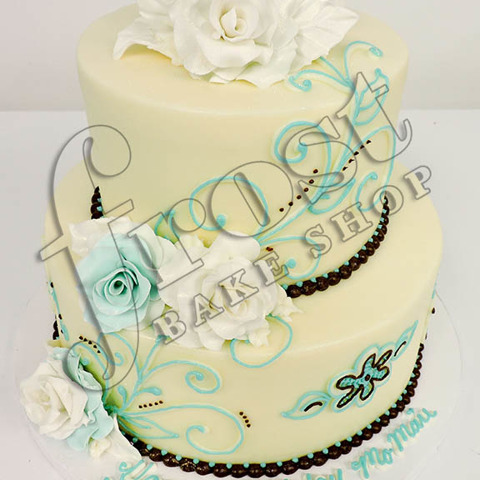 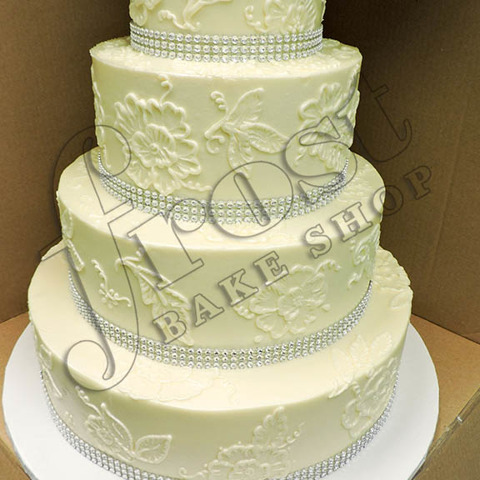 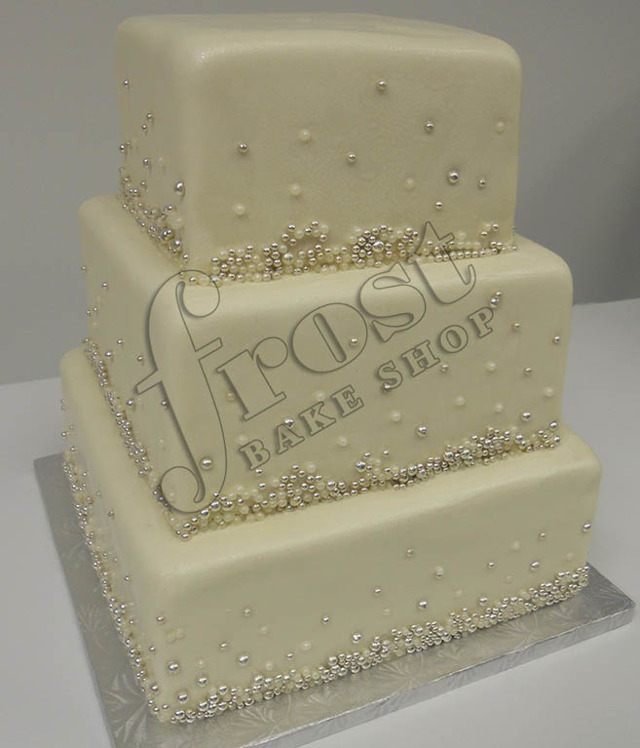 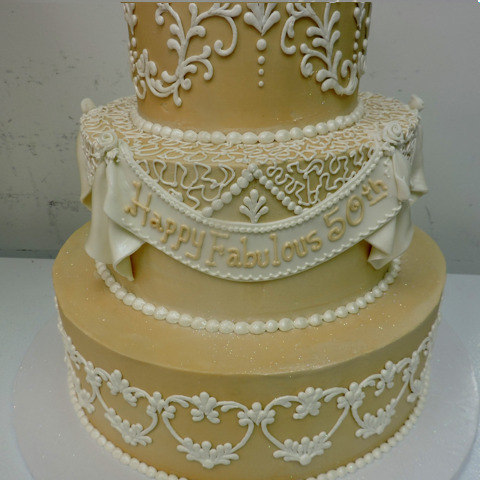 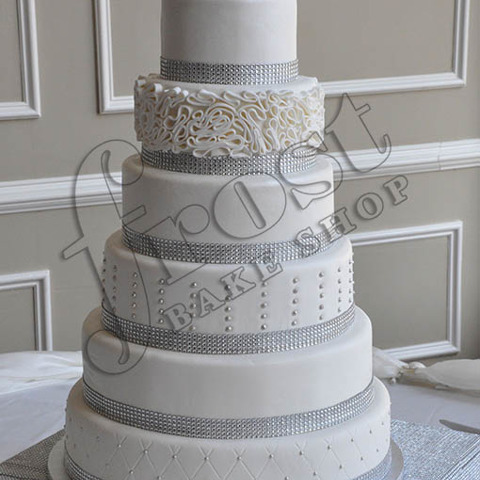 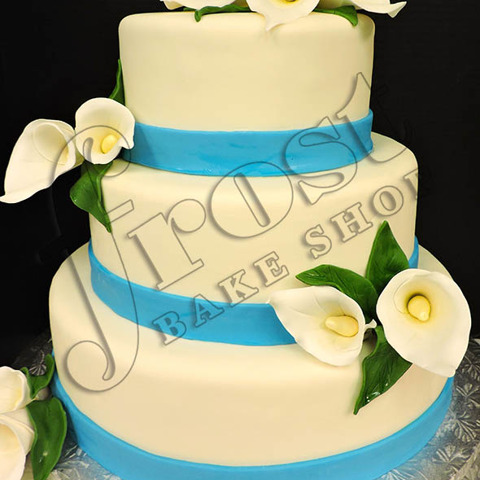 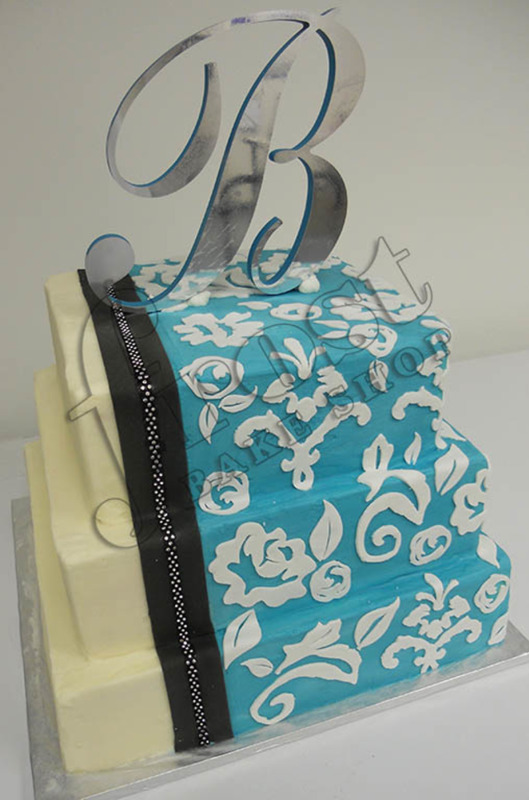 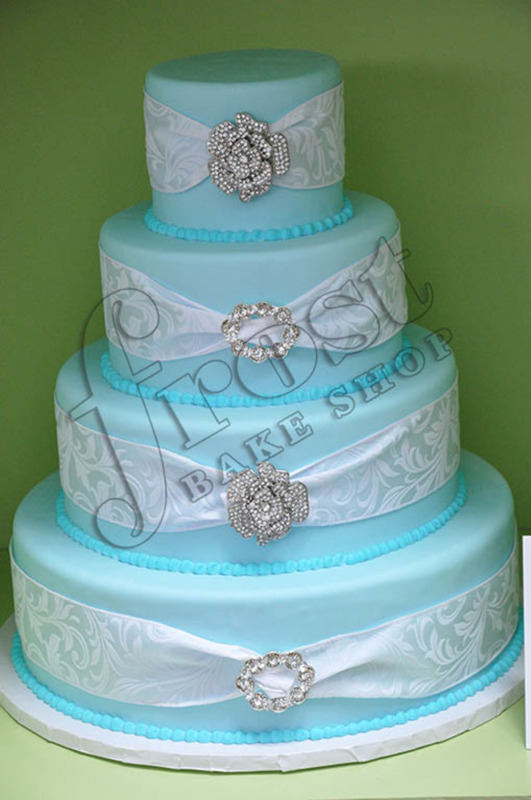 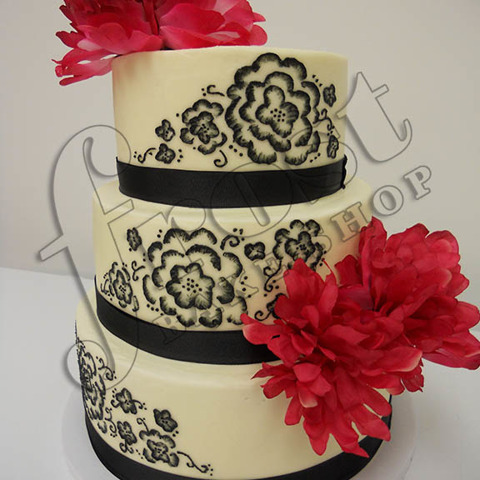 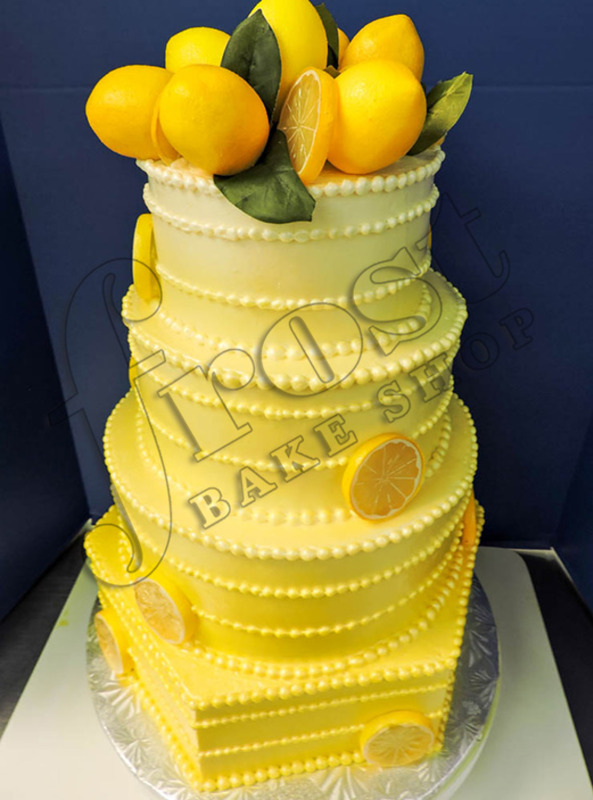 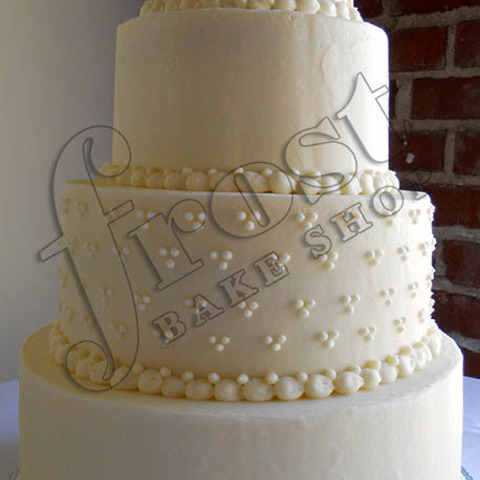 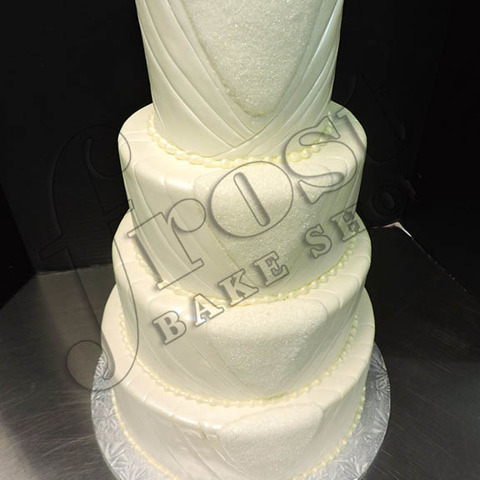 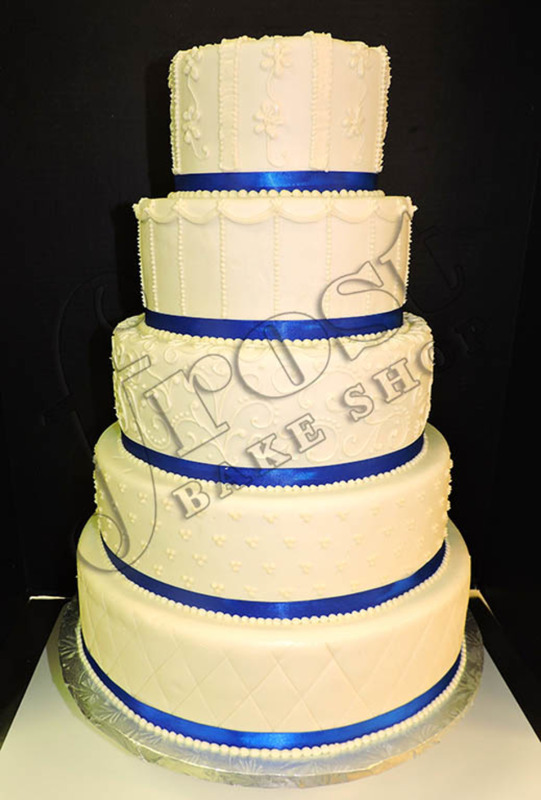 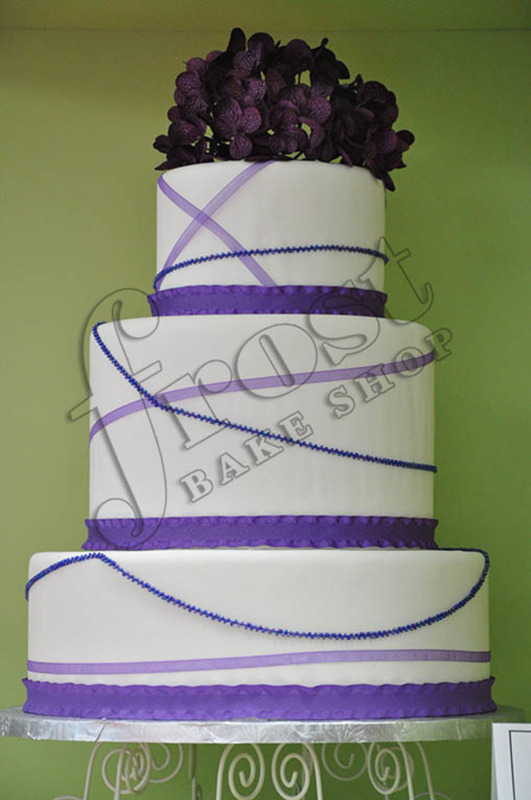 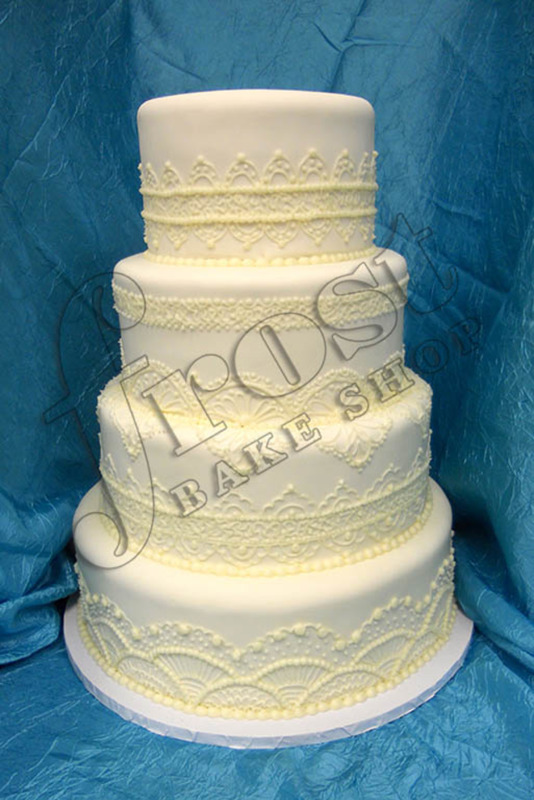 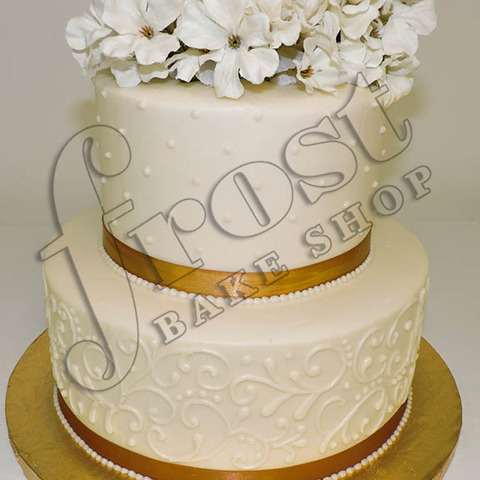 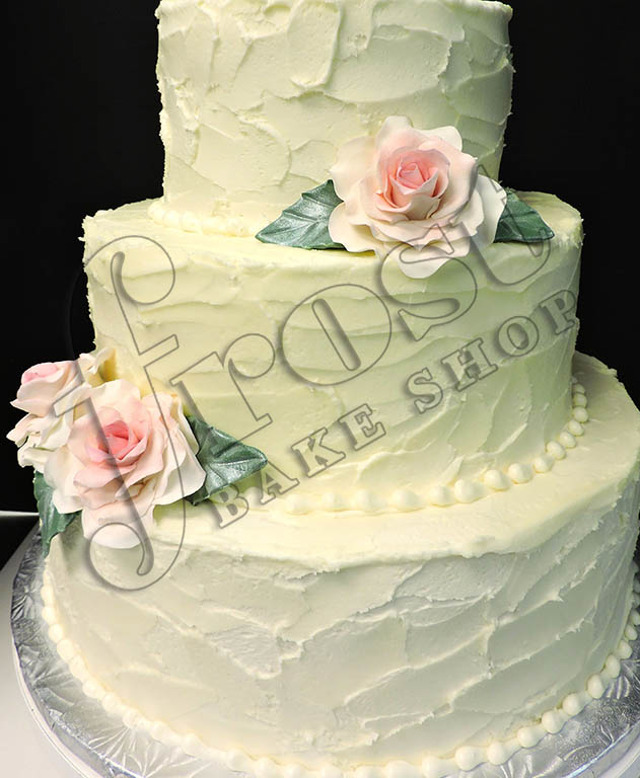 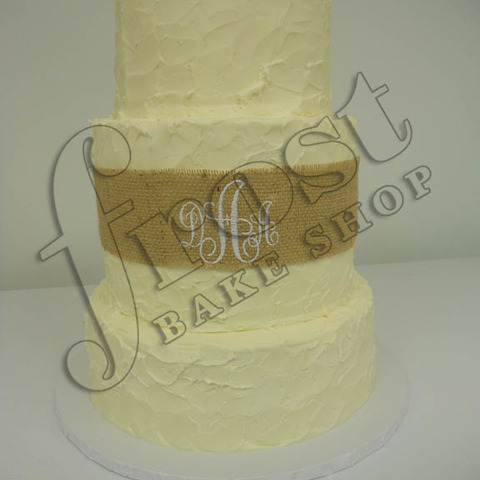 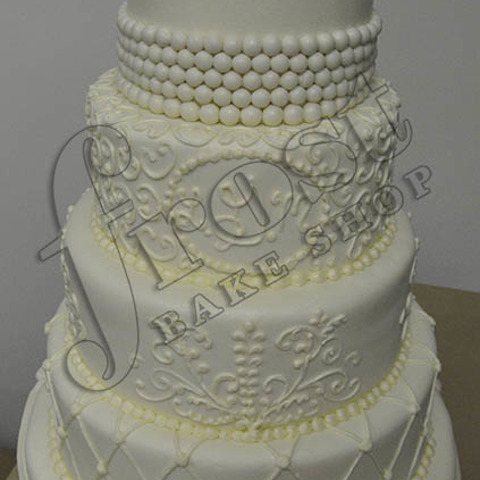 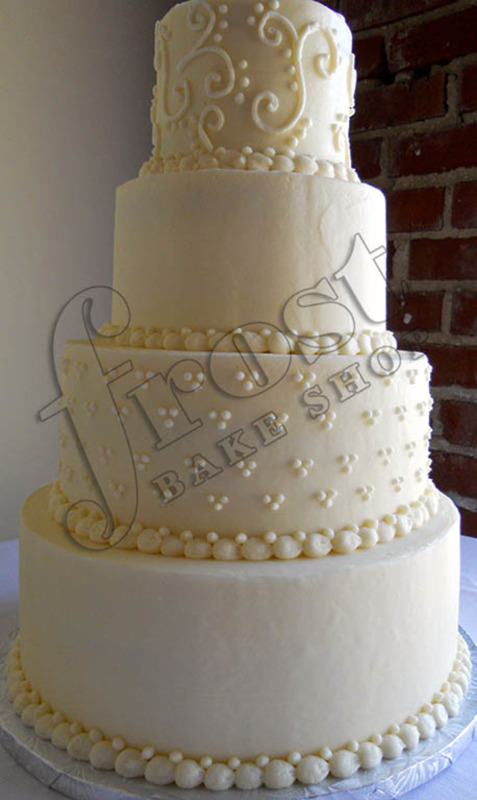 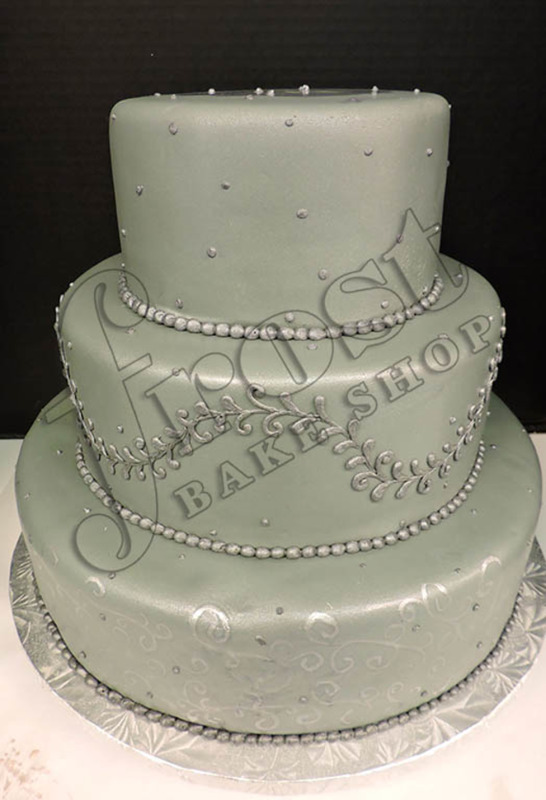 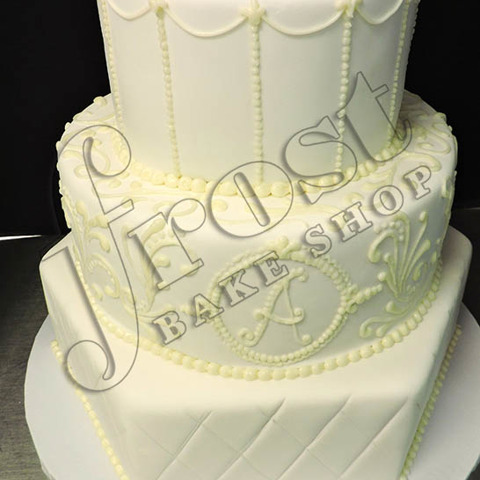 Memphis cake bakery, Frost Bake shop, specializes in the latest techniques using "rolled fondant", which gives you the smooth porcelain like finish so popular today. 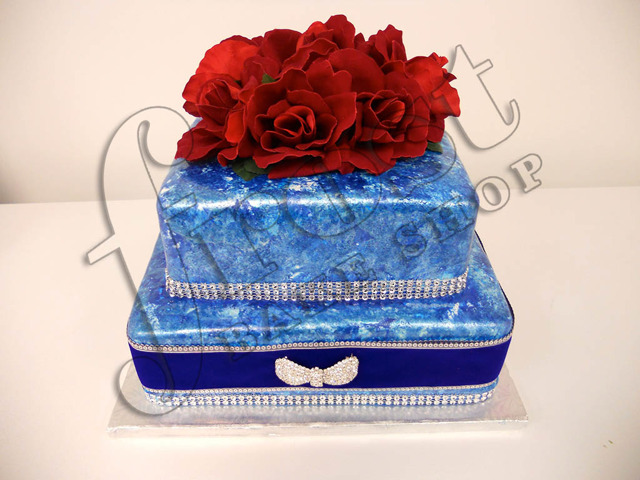 Choose from simple designs, to elaborate multi-tiered masterpieces. 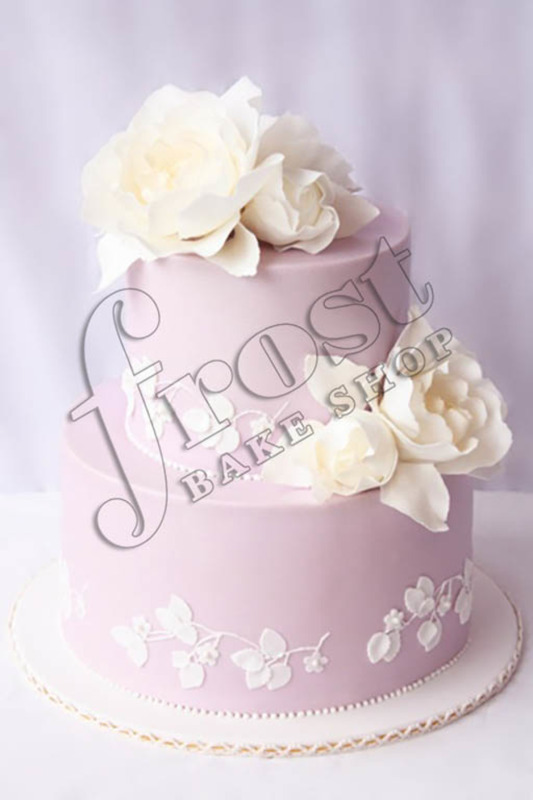 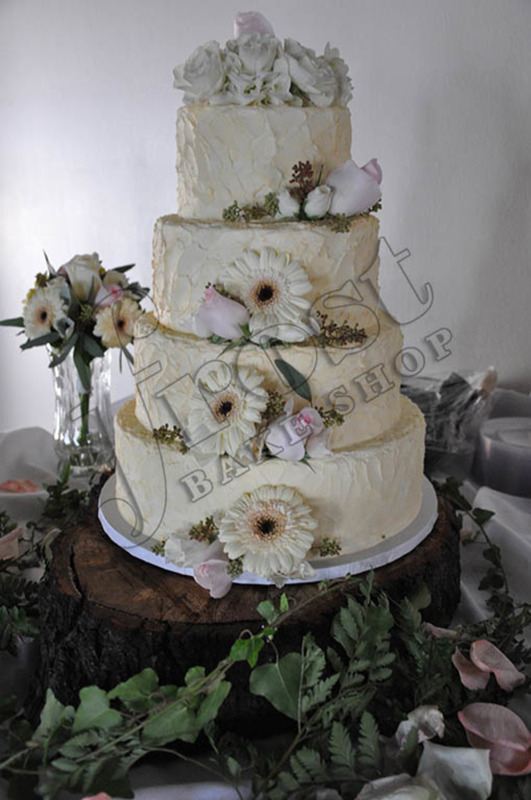 Specific wedding cake pricing is based on several factors including cake size, the complexity of the cake design and additional decorative elements (such as hand-made sugar flowers). 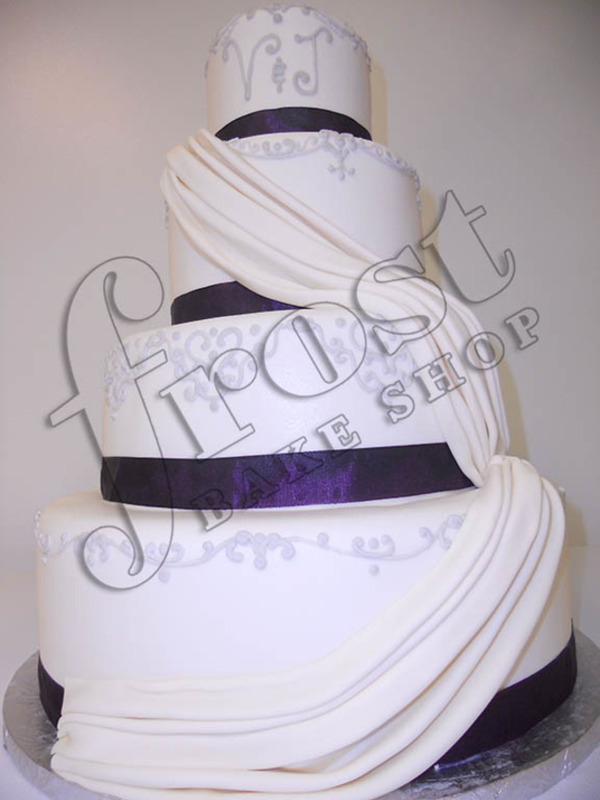 We offer appointments to discuss style and design, sizing options, flavor combinations and pricing. 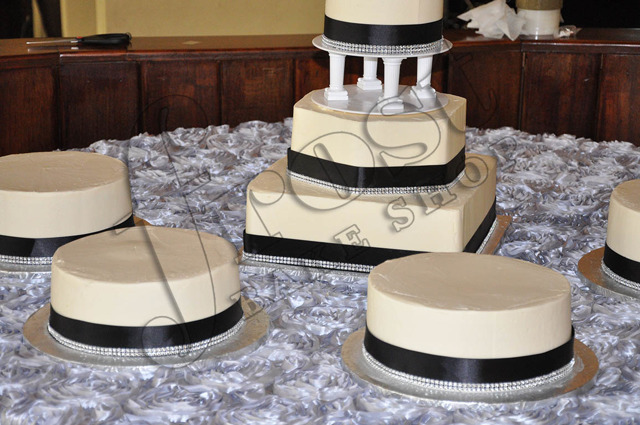 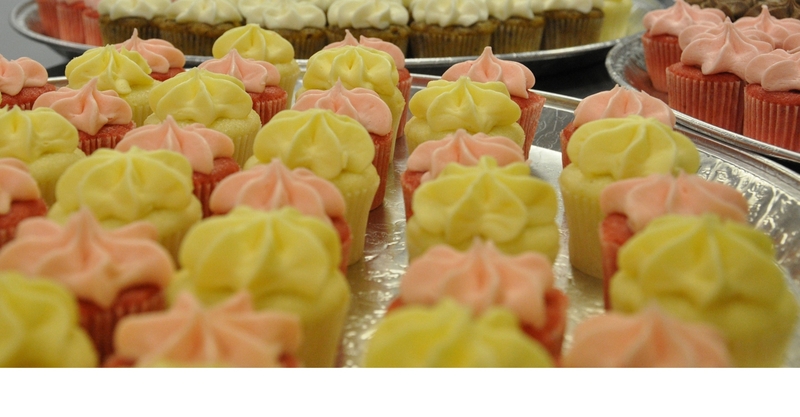 Of course, you will also get to sample cake! 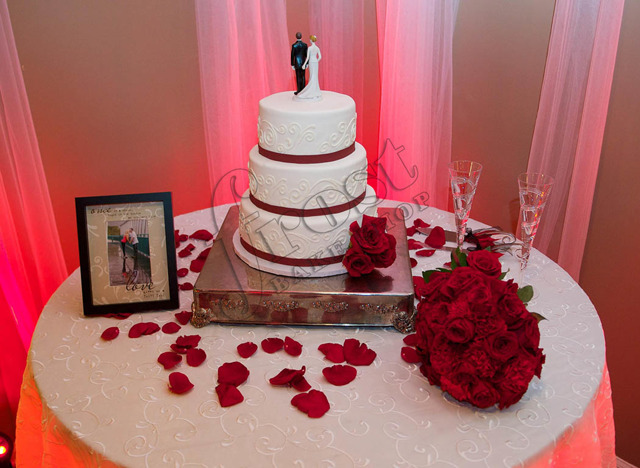 Consultations are complimentary, but they do need to be scheduled, so please call to make an appointment. 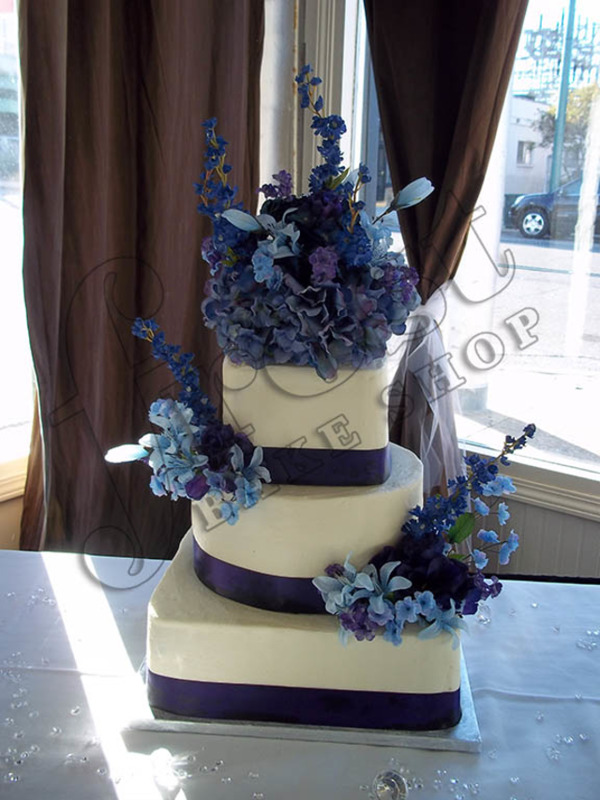 Appointments are typically available throughout the week; times vary by day.